Anyone looking for a completed trip report to read can check out Jeffs report, i will seriosuly say now.....if this report is completed in the next month it'll be a miracle...lol...it's taken me a month and a half just to get a start on it. I can't recall exactly when it was we finally decided we were going to visit Tasmania on a holiday, it's been something we'd been thinking of doing the past few years though. The main thing getting in our way was we couldn't work out if we were going to drive down with the fourby and camper trailer in tow and catch the ferry across, or if we were going to fly down and hire a camper van and explore the place that way, or we even toyed with the idea of flying down and hiring a car to drive around in and just stay in what ever accomodation we found along the way. In the end a decision was made one day at a bbq at a mates place, and we were going to Tassie for a 6 week holiday, with me driving the fourby down to Melbourne with the camper in tow and catching the ferry across to The Apple Isle (all up i'd be on holidays 7 weeks, allowing for the 3400klms travel down and back to Melbourne). What you may notice in that statement is that i said i'd be driving, not we.....that's because my lovely wife and the kids were going to be flying down to Tassie and i was going to meet them there. So i have basically 2 days continuos driving to cover the roughly 1700klms it is from home to Melbourne followed by an overnight ferry ride to get to land on Tassie itself, whilst the wife and kids have a 3 hour flight to get there instead. Now fear not my friends i won't be doing this journey alone, you see along for the trip will be the friends who's bbq we were at that day when we finally decided to actually do the trip. Joining us on the holiday was Jeff, Sara and their 2 boys.... Jeff is going to drive down with me in his fourby towing his camper also, whilst Sara and the boys joined my wife Leanne and our 2 girls flying down to Tasmania. Our original plan had Jeff and myself leaving Brisbane early Thursday morning and arriving in Melbourne on the Friday arvo just in time to jump on the ferry across to Tassie, but being that it was costing us just over $1300 each for our return ferry ride to take the 4wd's and campers across, we decided a few weeks before departing on the trip that we'd give ourselves an extra day to do the drive just incase we ran into any vehicle or trailer problems along the way. In the months leading up to our trip we had a few bbq's together at Jeff and Sara's place, these were trip planning bbq's where we sussed out a heap of places we wanted to go see and also looked at places to stay at along at along the way. We pretty much planned out the first month or so of our holiday, we left the last part free so we could allow to change the first month around as we went along, and allow us to stay longer or shorter at some places if we wanted to. At the same time both the 4wd's were serviced and alot of maitence i'd been putting off on my Landcruiser finally got done...except for getting my winch working again that is (geez i wish i'd rebuilt that before going away, i could have used it a few times on the trip, as you'll see later on in the report). The weekend before leaving we packed the camper and fourby with all the gear we thought we'd need for the trip, choice of clothes was a major item of concern on the list for the 4 of us. Being it's Summer time we are doing this trip in, here at home we'd normally be wearing shorts, singlets and a pair of thongs (flip flops for the non Aussie's reading this) just about every day...but down in Tassie it's not that uncommon to hear reports of snow falling at this time of year in that state. So with that in mind, we packed everything from shorts and t shirts, right through to long pants, ski jackets, beanies and thermals...a decision we didn't regret one little bit i can tell you now the trip has been completed (i didn't wear the thermals but the ski jacket, long pants and beanie got a good work out). So with everything pretty much sorted (except rebuilding the winch), and Tuesday arvo the 9th of December 2014 now here, it's time for me to start my 7 weeks of holidays...let the trip begin. Early morning start today had me leaving home around 4.30 a.m, i meet up with Jeff at the Aratula BP servo about an hour or so from home, fuel up the Crusier and have brekky before hitting the road for some hard klms of driving today. Heading off from Aratula we cross over Cunninghams Gap to Warwick before then heading West along the Cunningham Highway towards Gundy. A touch West of Warwick we come across a wide load being transported, eventually we manage to get past it and have a good run into Goondiwindi, even seeing a few emus in the paddocks just before reaching there. 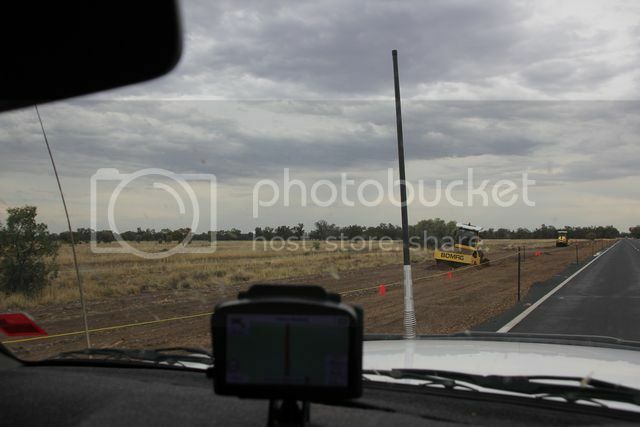 When you bypass the edge of the town of Goondiwindi on the highway, you'll go through a roundabout, as you do this you leave the state of Queensland and enter into NSW. 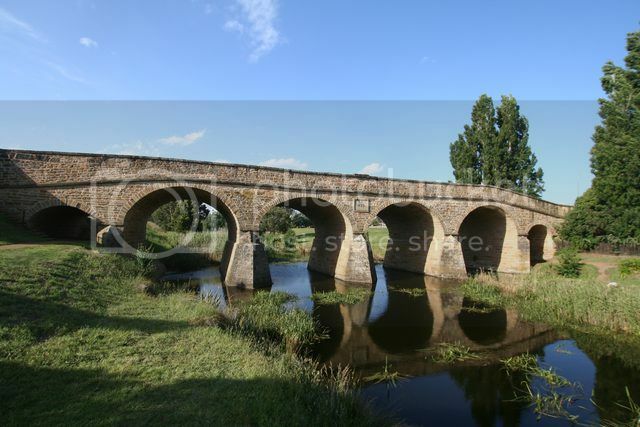 We take a quick wee stop on the outskirts of town and it's straight back into the driving gig once again. From Gundy we head south on the Newell Highway, straight through Morree and pull up in Narrabri for Jeff to grab some fuel (i'm fine to drive all day with my longrange tank and other main tank which both hold about 280ltrs onboard all up). With 570klms already roughly clocked up for the day, i grab some snacks that i could see but not reach that are on the front passenger side of the floor, and we hit the road once again (we didn't really stop for lunch today). 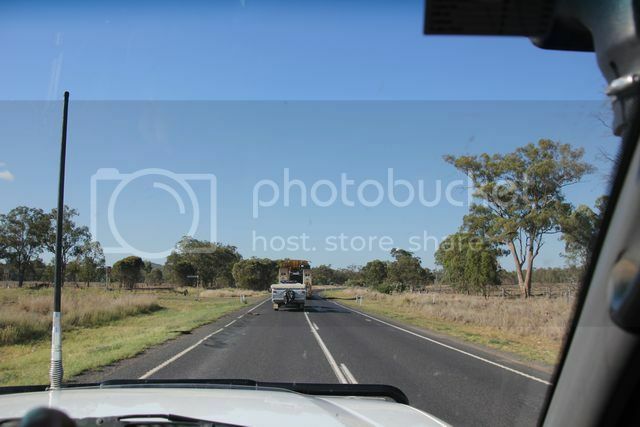 Pushing on South down the Newell we pass through Coonabarrabran and Gilgandra without stopping, before stopping on the Southern outskirts of Dubbo to stretch our legs and get a drink from the fridges in our vehicles. It's a stinking hot day outside today, and somewhere between Coonabarrabran and Gilgandra i notice the temp gauge start to rise on my Landcrusier as i go up some of the bigger hills, it's an ongoing issue i've had with the vehicle over the past few years that only occurs when i tow the camper trailer, one i thought i'd have fixed by now with the larger PWR radiator i installed just before leaving on this trip aswell as new viscuos fan earlier in the year also...... but sadly that doesn't seem to be the case. I know to back off the accelerator when this happens and the temperature will quickly drop once i crest the hill and start down the other side, so the rest of the arvo is spent driving without the aircon on to save the motor working any harder then it has to, and babying the vehicle up any climbs we come to along the way....did i mention it was stinking hot today?...i was sweating big time all arvo as i drove along. From Dubbo we continue on South down through Peak Hill, Parkes and Forbes without stopping once again, we pass by some roadworks somewhere along the way and Jeff radios to me to check out the bogged roller to the left...they've had some decent rain out here lately it would seem and the roadcrew won't be doing much here for a few days yet it seems. Still pushing on further South we eventually hit West Wyalong where we decide to call it a day as far as the driving goes, i've covered just on 1100klms for todays effort. Even though we have our camper trailers with us, the plan for tonight after a big days drive is to grab a cabin somewhere and dinner at the pub, which is exactly what we do. 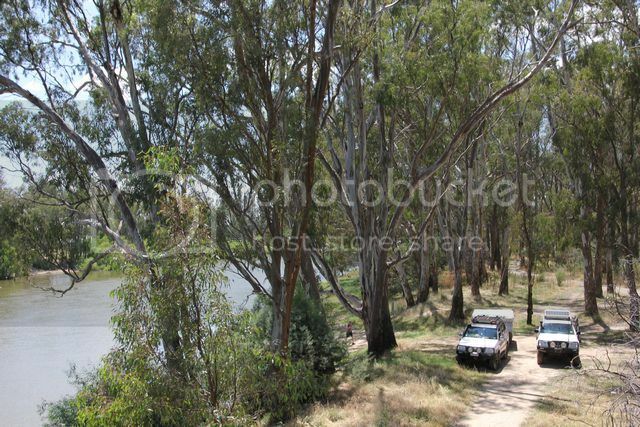 There's a couple of van parks to choose from in town, we end up staying at The West Wyalong Caravan Park due to it being smack bang in the centre of town and walking distance to the pub for dinner. This van park we choose is set a bit back from the main road down a small side street, so not real noisey and nice clean ammenities aswell (not the most modern, but very clean).... would stay here again if passing through. We grab our gear and throw it in the cabin before heading straight off to the pub for dinner, with daylight savings time here in NSW having us lose an hour today, we don't muck around to get to the pub before they stop cooking meals for the night. Not sure of the name of the pub we ate at (there's a few in town), but it was the one nearest to where we were staying and only a few hundred metres walk away which was beaut. Dinner was a nice feed and so was the cold beverages that accompanied it, we soon headed back to the cabin for a shower and it wasn't long before we were fast asleep after a big days driving. 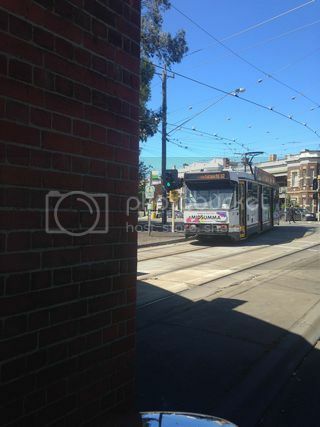 Up around 6.00 a.m and the plan for today is to reach Melbourne not to late in the afternoon, we'll be driving most of the day again today, but it shouldn't be as late as it was yesterday for our arrival (we arrived about 6.30 - 7.00 p.m lastnight in town). Brekky for us was at the roadhouse on the Northern end of town this morning, we refueled the vehicles and whilst Jeff was cleaning his windscreen with the squigeey, he went to flick the excess water off of it and somehow smashed it into his front guard of his Landcruiser, chipping some paint of the guard in the process. I didn't find out about this until the next day, but after the event it certainly gave me a laugh at his clumsyness...how the f... / heck did you do that i kept saying to him :lol: :lol: A quick toasted sanga and iced coffee for brekky for me, and we were soon on the road headed for Melbourne. 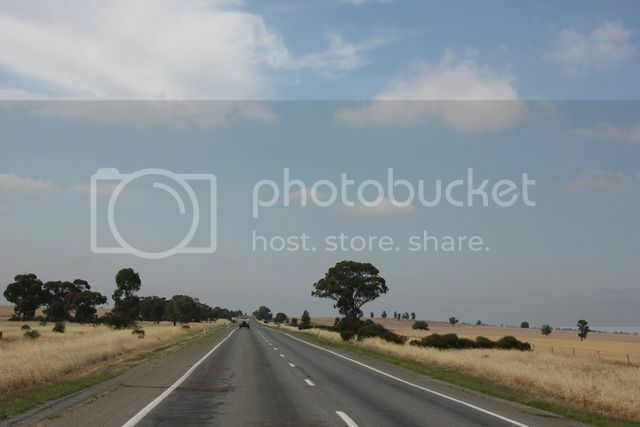 Driving South along the Newell Highway and you soon realise why they call this area the cereal bowl of NSW, the fields surrounding this area are filled with cereal crops. It's a touch monotonous looking at the same stuff in the surrounding fields as you drive along hour after hour, but you also realise why the transport trucks prefer to take this route rather then driving the coastal highways, there's not many towns to drive through to slow you down, so you can maintain the 110kph speed limit much of the driving time if you wanted to. As we drive along i spot a few more emus in the paddocks beside the highway, looking for them helps break up the drive some what i guess. 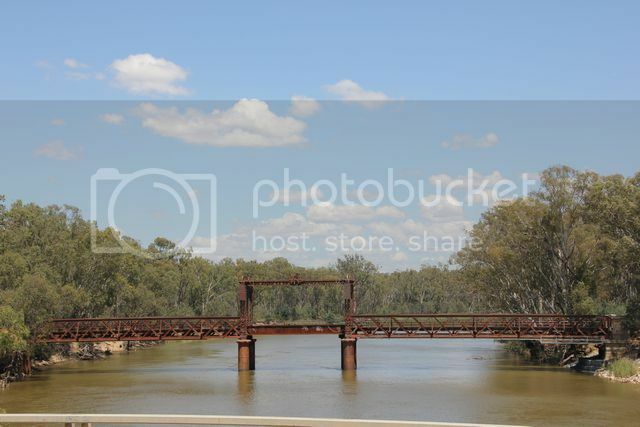 I don't think we stop anywhere along the way until we pass through the town of Tocumwal, we drive straight through town here and cross the bridge that is spanning The Murray River, where you then leave the state of NSW and enter into Victoria. Immediately as you pass the sign informing you of your entrance to Victoria, there's a side track heading off to the left from the highway, so we quickly take this sharp exit (it's literally a sharp left turn down a small track from the highway, so make sure you don't have a large truck or someone following to closely behind you as you do this) and pull up beside the banks of the mighty Murray River. Why is it called the Mighty Murray?... 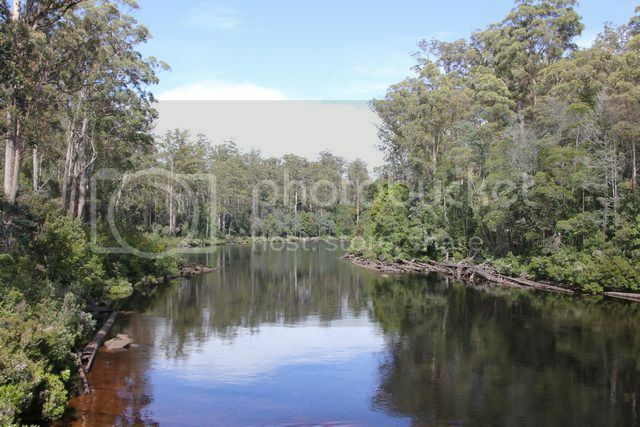 well if you don't know it's because it's Australia's longest river at just over 2500 klms long, and it's overall the catchment area is 1/7th of Australia's total land mass. Anyhow... enough useless facts, we basically need to stretch our legs for a while, and doing so beside some water is a nice place to do it. 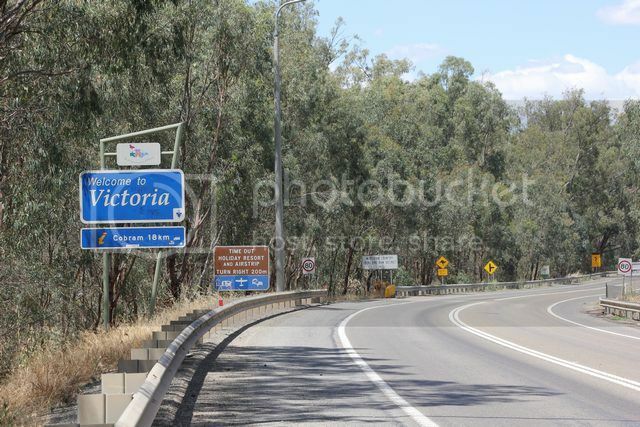 I grab my camera and go for a walk back up onto the verge of the highway, i grab a pic of the Victoria sign we saw as we crossed into the state, then walk back onto the bridge itself and take an elevated pic of of fourbies by the Murray River, and another pic of a bridge that spans the river on the Western side of the highway aswell. Legs stretched and we are back into the driving once again, as soon as you re-enter the highway to head South the road is a touch windy, but after a while we get back into the 100kph driving once again. 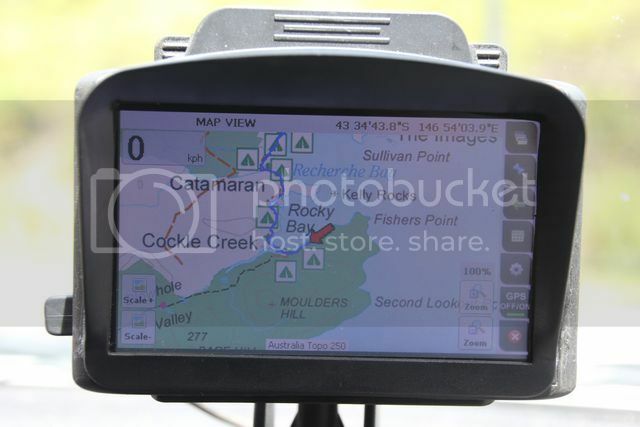 We are no longer travelling on the Newell Highway anymore, that highway ends when you cross the Murray River and enter into Victoria, we are now travelling on the Goulburn Valley Highway instead. 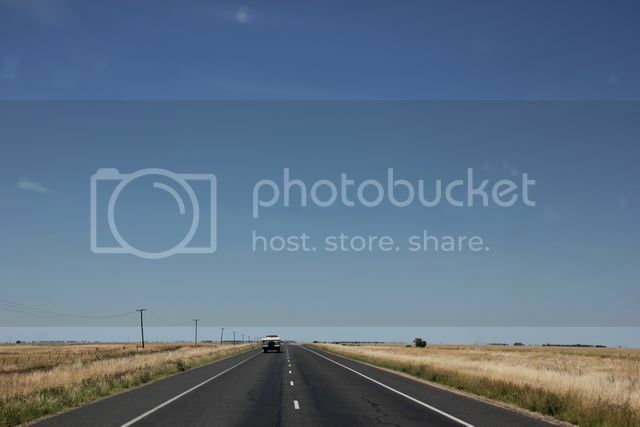 Somewhere along the way the highway turns into a dual lane carriage way, we bypass many of the small towns along the way now adays and when Jeff calls out over the uhf radio he's in need of some fuel, we take an exit off the highway for the town of Nagambie. To access the town and then get back on the highway again, i think you take about a 14klm detour off of the highway itself.... you take the exit from the highway and drive about 7klms, then pass through the town and loop back onto the highway a further 7klms or so further South from memory (roughly speaking here, not sure of the exact distances). Pulling up in town we struggle to find a carpark in the main street and end up parking well down a side street somewhere. We are amazed at how busy this small town is in it's main street, but later notice there appears to be a fairly largely attended funeral being held in the town centre whilst we were here. 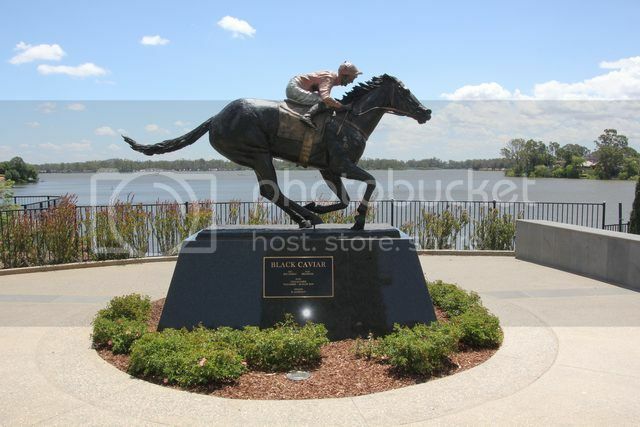 I tell Jeff that i know there's a statue in town here for the race horse Black Caviar (undefeated in 25 races it was), i'd seen pics of the staue in someone elses recent trip report, so thought we may aswell visit it ourselves whilst in town. Knowing there was water in the background of the pic i'd seen, we head for the water we saw on our right as we drove through the centre of town, we quickly find what we are looking for and grab a few pics before making a bee line down the Northern end of town for the bakery to grab a pie for lunch. Our latish lunch had, and we jump back in the vehicles for our final run into Melbourne. Back on the dual carraige way again and we notice the increase in traffic the closer we get to Melbourne itself. 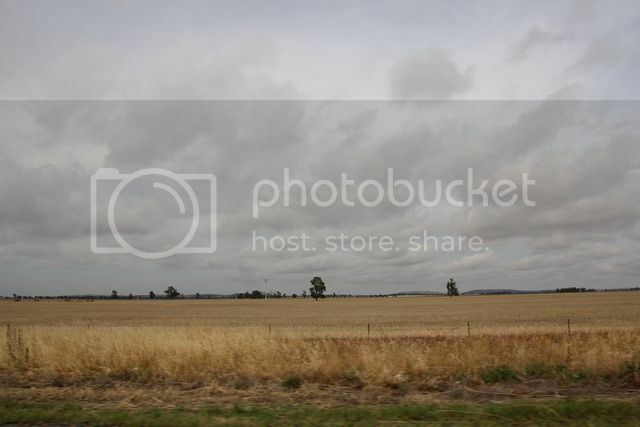 The weather has now turned into your typical Victorian weather, it was hot and sunny at Nagambie, but it's now overcast and showering on and off as we drive along the highway now. The main thing i notice as we crooze along the highway here, is just how many fixed speed cameras they have on the side of the road, the things are everywhere!!! We didn't really plan this last leg of our journey very well, we were headed for the Eastern suburbs of Melbourne and should have exited off and avoided much of the afternoons peak hour traffic, but instead we foolishly didn't even think about this part of our trip, and ended up smack bang in Melbournes afternoon peak hour traffic towing our camper trailers. We eventually ended up where we wanted to be, but likely added about an hour to our days drive by not detouring further East to avoid the traffic. 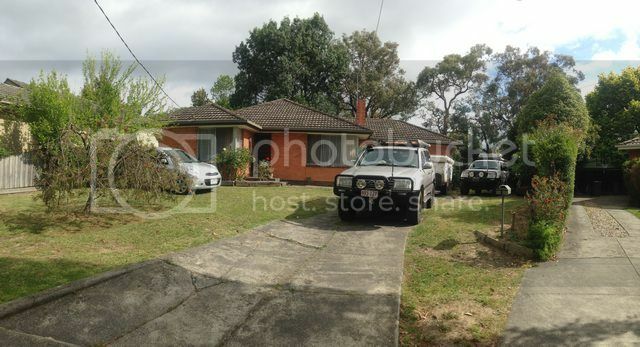 First up we needed to head to one of Sarahs relatives house to drop off my vehicle and camper aswell as Jeffs camper aswell, there's room for our vehicles here but the beds we needed to sleep in were going to be at another relatives place not to far away from there instead. We drop those off, and i jump in Jeffs fourby for the drive over to the other relatives house, we have a few drinks on the back verandah whilst waiting for some of the other relatives that live here to get home after finishing work for the day, before then heading down to a local pub where we then have dinner. Dinner had, we return back to the house where we soon head off to bed, exhausted after another full day of driving. 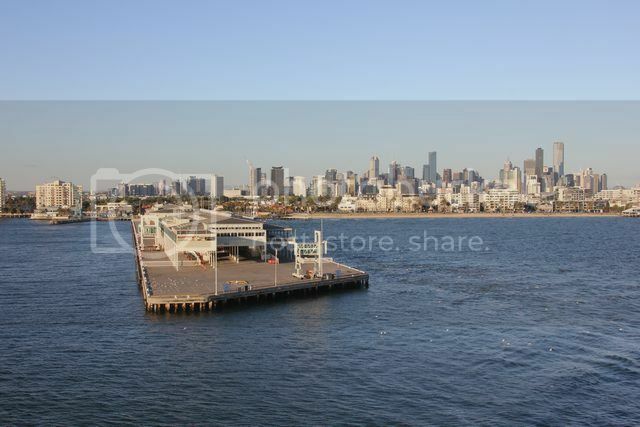 After taking a very scenice route to get to where we were going, we eventually end up down at the ferry terminal at Port of Melbourne. We are pleasently surprised to see that there is actually quite alot of on street parking around this area along the foreshore, and that there is also quite a nice beach located right beside where the ferry terminal is, i guess the fact it's located on Beach Street probably should have gave us a clue about that though...lol. We pull up into a car park spot for a quick look around and Jeff goes for a walk to the nearby toilets, out of nowhere a ninja like parking inspector appears, and i have to quickly jump back in Jeffs fourby to move it so he doesn't get a parking fine. When Jeff returns we check out the parking costs and note it's $11 to park here all day on the street, that's pretty cheap we reckon so decide that we may aswell head straight back to where our campers and my fourby is located to collect them, and head straight back down here to spend the rest of the day. It's a pretty nice area down where the ferry terminal is, there's no point battling peak hour traffic this afternoon to try and get back here, so it's an easy decision made to relax by the water for the afternoon. 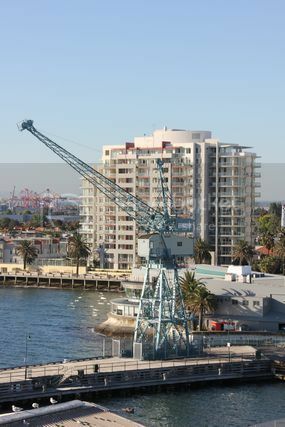 The other decision we make is that no matter what the 2 toll roads cost, with Melbournes traffic being what it is, it's worth paying the tolls to drive straight to where we need to get to and back againg to the Port, which is exactly what we do. Heading back to grab my fourby we get stuck in some worse traffic then earlier, there's a break down or something in the tunnel and it's pretty slow going for about 20 or so minutes driving, but once we clear that it's a good run. We get back to my vehicle and hook Jeffs trailer back up to his fourby, we thank Sarahs relative for letting us keep my vehicle and Jeffs trailer there overnight, before saying goodbye and quickly heading back to the beach to laze the afternoon away. On the way to the terminal we use 2 different toll roads, there's the Eastlink and the Citylink...from what i can work out and then paid, the Eastlink (one use pass) cost me $5.48, and the Citylink cost me $15.80 to travel on (i had to purchase a 24hr pass for this one, as that's the only online option i could see that suited the route we took). 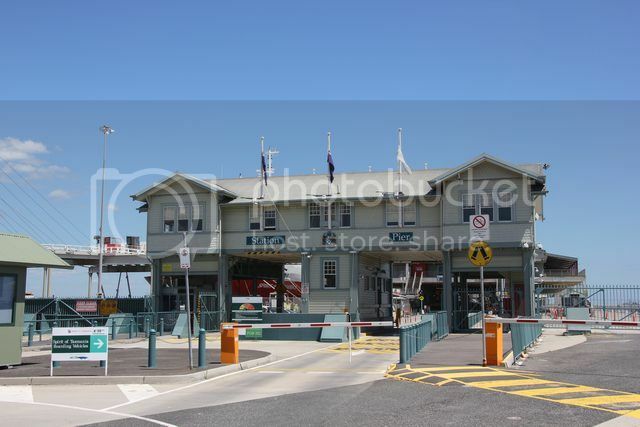 At the end of the day the $20 it cost me in tolls was worth the cost, it's a straight forward run from the Eastern suburbs going along these roads, and the exit from the Citylink is not to far around the corner from the ferry terminal. 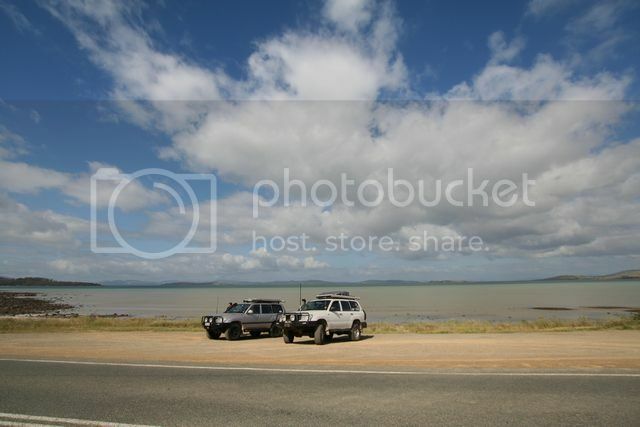 Vehicles parked up on the foreshore, we grab a bite to eat from a local takeaway shop nearby, and then spend the arvo doing not much more then looking out over the water relaxing. We go for a short walk from where we've parked to the terminal itself to try and work out exactly where we need to enter for the ferry later on, the signage for the ferry is tiny IMHO and something you could easily miss if trying to drive and keep an eye on traffic at the same time. 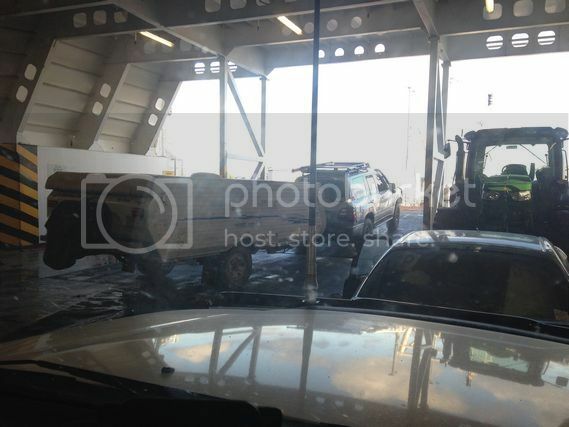 If you look at the pic below you'll see a few boom gates, the boom gate to the right is where you go once they "OPEN" later in the afternoon, the gate you see behind the boom gate also gets opened for you to drive through to start the vehicle inspection process. 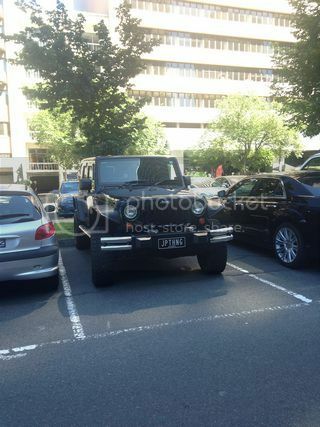 Walking back to our vehicles i spot a modified Landcruiser trayback ute in the carpark, i snap a pic of it and after that we just bum around the next few hours waiting until 5.00 p.m, when they open the gates for us to start loading onto the ferry. When you book for the ferry you'll get sent a heap of information about what you can and can't take on the ferry to Tasmania with you, quarantine is pretty strict for certain foods, as is the fact you can't take fuel in jerry cans onboard the boat with you (aswell as some gas canisters etc)....something i'd forgotten about with the 5 litre jerry can for the chainsaw still having a few litres of 2 stroke fuel in it. The gates finally open and we drive around to where they do the vehicle inspections, it's just like going through customs with them asking you a heap of questions regarding food, fuel, gas bottles etc etc. I make them aware of the fuel in the jerry can, and the guy doing my inspection gets me to unlock some of the storage boxes on the camper so he can look in them, aswell as the fridge in the back of my fourby. Be prepared for them to look in anything, they'll pick random areas for you to open and don't necessarily look in everywhere, just random spots of their choosing at the time. The guy puts a tag on my windscreen so someone else further down the line can easily spot me and do something about the fuel i have in the jerry can. When we eventually start to load onto the ferry a while later, another guy directs me to pull over in a speciafic area to the side, where i myself then have to take the jerry can and tip the fuel into a waste drum, i then need to use the water tap located here and fill the jerry can with water so that no fuel vapour can cause an explosion on the ferry later on. 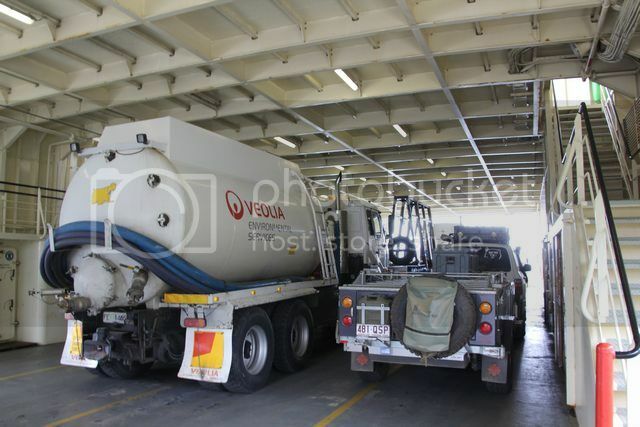 I mention the fuel vapour thing as you need to make sure you haven't had fuel in your jerry cans recently, they'll make you fill them with water if they smell badly of fuel, so remove the caps from them a few days atleast before you plan to travel on the ferry. 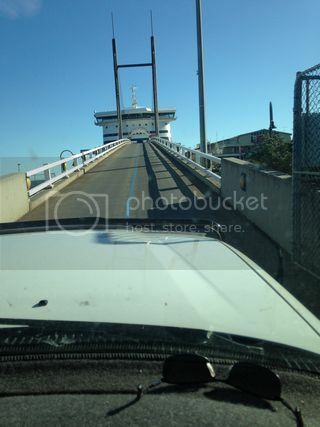 With the jerry can now sorted it's time to load, i drive up the big ramp at the front of the ferry and follow the various guys instructions as they direct you which level to go onto and where to go inside the boat. Once onboard and parked up i grab my overnight bag from the fourby, you are not allowed back down to the vehicles once they've loaded, so make sure you have whatever you need for the night. I head up to our room and throw my stuff on my bed, i then start to look around the boat and after a while i ring Jeff to see where he is. Much to my surprise he's still waiting to be loaded onto the boat, he was parked right beside me on the dock, but 30 minutes after i'm onboard and he's still waiting to be told to drive onboard (it's pretty random how they load you, but obviously they have a system). Eventually Jeff gets the go ahead and boards the boat, he eventually joins me up on deck where we take a few pics of our surrounds before the ferry sets sail at 7.30 p.m.
Once the ferry departs the pier, it sails out across Port Phillip Bay for about 3 hours (where you'll get to see the sun set over the water as it does so), before it then goes through the small headlands that lead you out into Bass Straight for the crossing to Tasmania...it's after you do this you get to find out how rough the crossing will either be or not be, for us it was a pretty calm crossing though. Before reaching the headlands though, we make our way to bar to grab a drink and then to the bistro where we grab some dinner. Dinner itself was ok, the roast meat (i think it was beef from memory) was very average to say the least, but the rest of the food was ok...though i wouldn't say it was fantastic (maybe grab dinner before you board). Around 10.30 p.m we reach the headland and head out into Bass Straight, we immediately notice the boat start to pitch from front to back in the swell, it's not massive but definately noticeable how different it now is to the calm waters of Port Phillip Bay. Around 11.30 p.m we make our way back to our room to go to sleep, as i lay in my bed i notice just how bad the vibration is that runs through the ship from the motor, laying here feels like i'm in some sort of vibrating massage bed, it's a touch annoying actually. Eventually i fall asleep though, it's been a pretty big couple of days leading up to this point, so i could sleep just about anywhere right now i reckon. 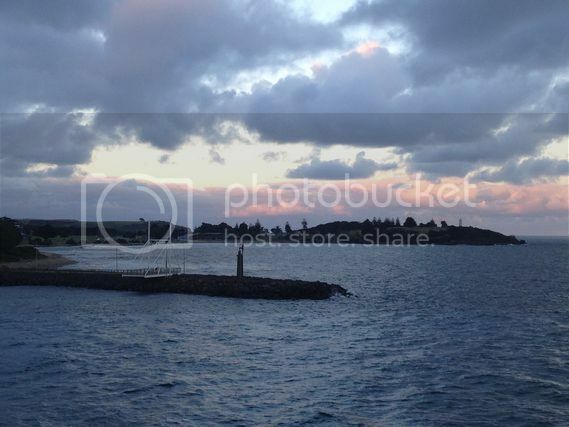 Awake nice and early (about 5.00 a.m i think it was, maybe a touch earlier) and i notice Jeff has already left the cabin, i do the same and go for a walk about the ship to look for him and see where we are and if Tasmania is in view yet. I find Jeff watching telly mid ship somewhere, he metions being up for several hours already, something about people snoring in the cabin and him getting bugger all sleep last night...that's strange, i didn't hear them....lol. 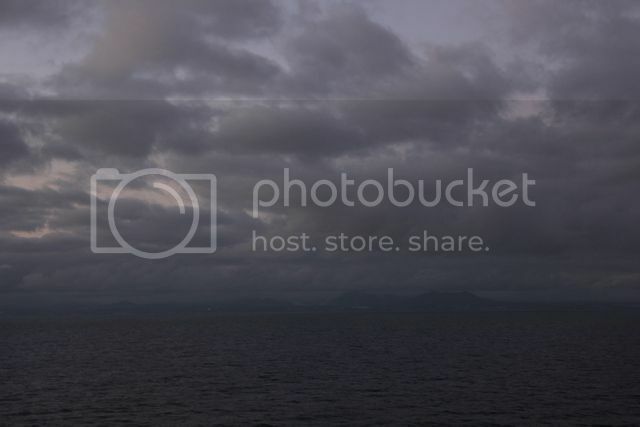 With just a touch of daylight in the sky we walk out on deck to see how cold it is outside, and at the same time manage to catch view of Tassie off in the distance. I take a few pics, but being it's windy and pretty cold outside (i'm wearing shorts and a t shirt), i don't ast long outside, so head back inside to watch the telly for a while. A short time later they give the call over the P.A sytem that brekky is being served in the eatery, we give this option a miss and plan to have it somewhere like Launceston once we depart the ferry. It's not long and we are entering through the headlands of Devenport, i see there's some sort of statue on the right of us either welcoming us to port or helping to guard the entrance (i have no idea what it was for really), and Devenport looks like abit of a sleepy little city at first glance (well it is 6.00 a.m on a Saturday morning). The ferry gives out a loud blast of it's horn, a lovely early morning wake up call for the town that i'm sure the locals must be very used to hearing each day. 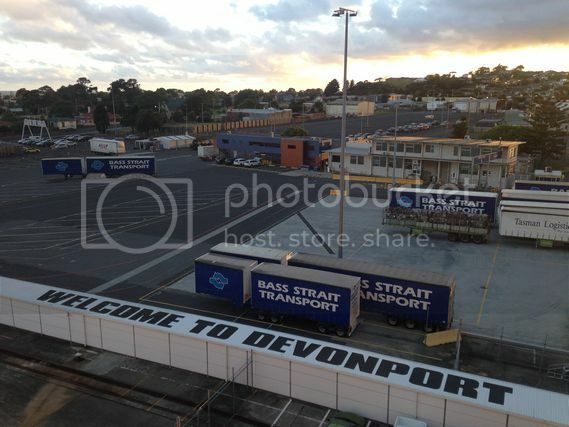 As soon as the ferry docks they start unloading many of the truck frieght trailers that were loaded in Melbourne (using the small yellow tow vehicles pictured below), it's a well rehearsed show we watch for about 20 - 30 minutes, before we then get the call over the P.A that it's time to make our way down to our vehicles so we can depart the ferry. Jeff may have got loaded well after myself onto the ferry, but in the end he was parked just to my lefthand side on the deck, and was off the ferry before i was. 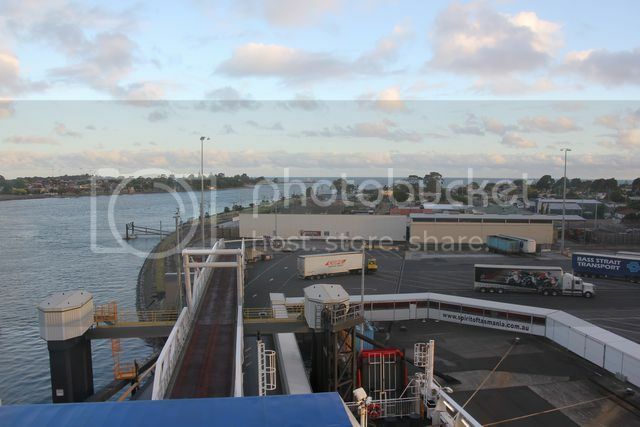 Once you depart the ferry you have to stop in the dock yard a couple of hundred metres away to go through quarantine once again, it's a pretty quick process and before long we are both outside the terminal gates and making our way towards Launceston where we plan to have breakfast. Everything i've read about Tassie tells me of the windy roads about place, so it's a touch of a surprise to find ourselves driving along a dual carraige way highway for the first part of our journey. I don't know why that highway surprised me actually, i'm not sure what i should of expected to be driving on here to be honest, i hadn't thought all that much about it...lol. I radio Jeff on the uhf that i need to pull over somewhere and turn on the fridge in the camper trailer (it's a Eutectic Autofridge, it gets run for a couple of hours twice a day and turned off the rest of the time), we decide to take the next exit off the Bass Highway onto the Meander Valley Highway to do so. We aren't in any rush to get to Hobart today to meet the families (they don't arrive until after lunch time), so we'll take the scenic route to where it is we are going we have decided. 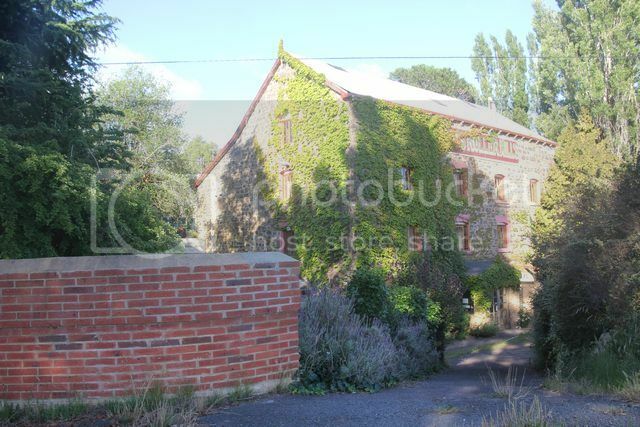 We pull up on the side of the road in the small town of Hagley, it's only now that we catch our first real glimpse of the beautiful character buildings Tassie is renowned for...it's just a small private house, but quite the change from anything we have back home in Brisbane. From Hagley we continue on to the small town of Carrick a short distance away, coming into town we spot another beautiful building on our right (The Mill Inn), so we pull up to take a few quick pics of it also. 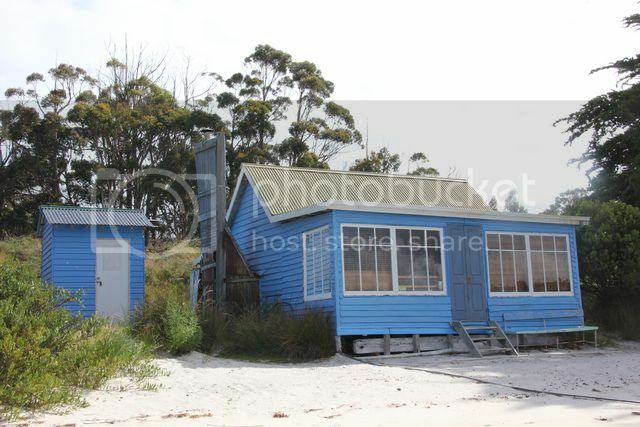 It's currently for sale, which we notice in the following weeks of our holiday is quite common of many buildings around Tassie, there seems to be heaps of property for sale all around this state. 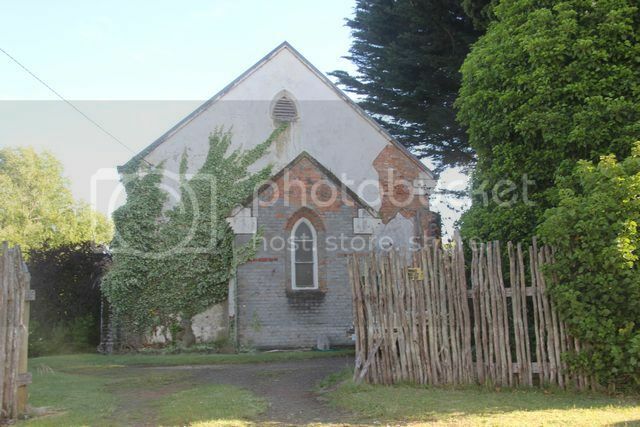 Whilst i am taking a few pics here, Jeff heads off up a side road a hundred odd metres away for a look around, he radios me up to come look at another old building he has found so i do just that. 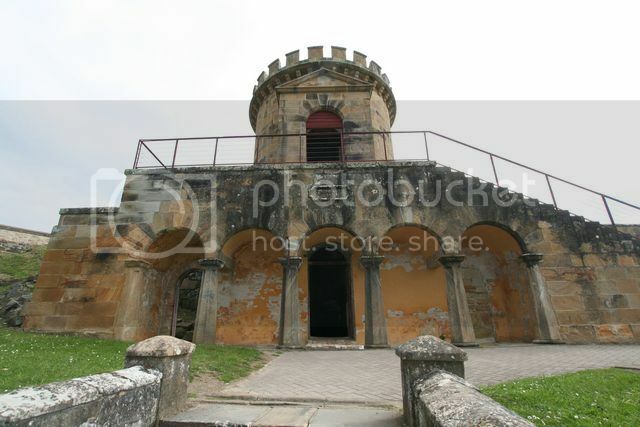 Archer's Folly is the name of the place Jeff has found, a ruined colonial house started in 1847, never completed being built before then sold in 1867 and then burned to a roofless shell in 1978. 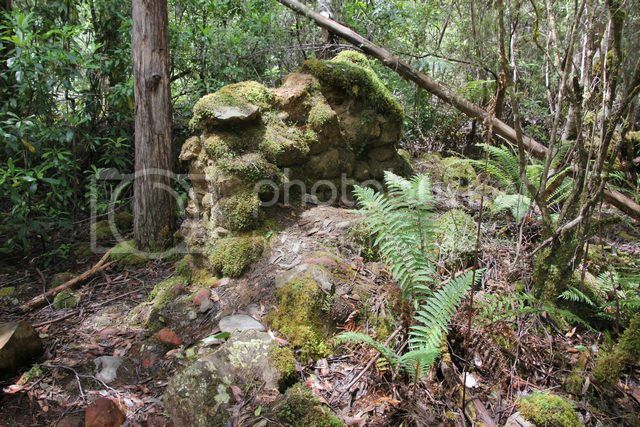 Sitting as a stark reminder to what might have been, the ruins of "Archer's Folly" is listed in the Tasmanian Heritage Register because of its association with prominent local businessman John Kinder Archer. Not to be mistaken as a descendant of the Archer dynasty, John Kinder Archer was the son of John Archer, a miller from Ware in England. Following the death of his father, and his inheritance of 30 shares in a steamship, John Kinder Archer turned his hand to the shipping industry. 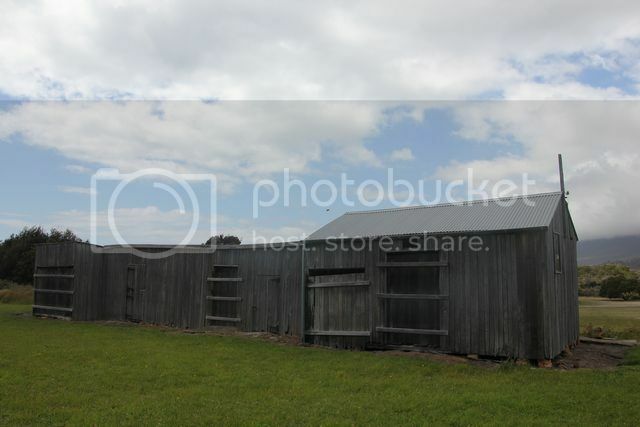 He was also an elected member of the House of Assembly for Norfolk Plains in 1859, a position he held until 1861. 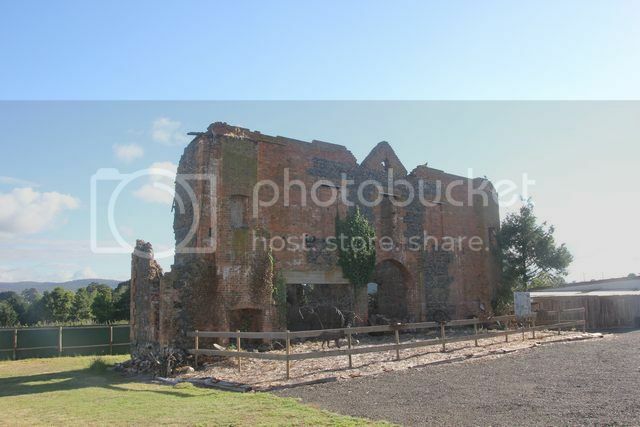 At about this time, Archer began building a large mansion on the high ground adjacent to Bishopsbourne Road in Carrick. 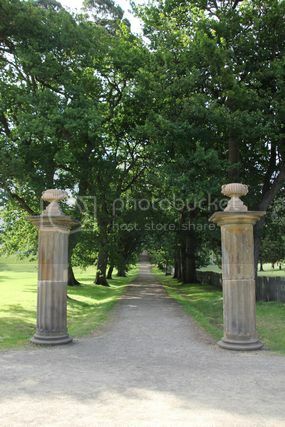 An interesting feature was the carriageway in the centre of house which took the form of a tunnel. 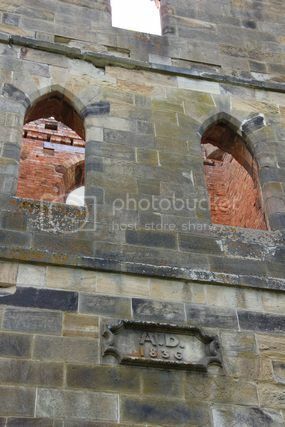 Horse drawn vehicles could be driven right through the building from the front entrance to an inner court yard and out through the back entrance to the stables. The front of the house was built, but at this stage Archer suffered a number of set backs. Two of his ships collided in Bass Strait in a severe storm. They were carrying building materials for the house and were uninsured. Further building plans were cancelled and the house was never finished. 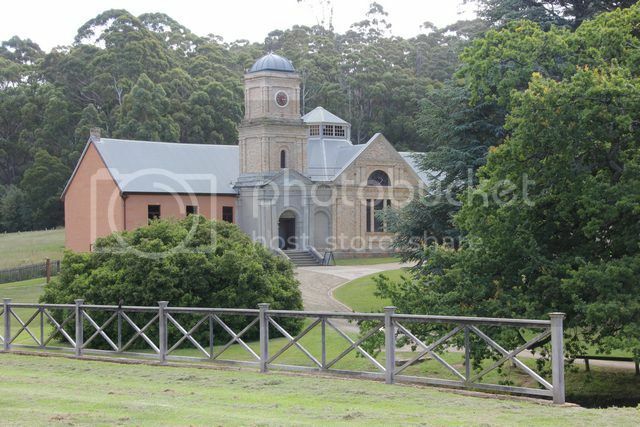 In 1867 it was sold to a miller, and ex-employee of his father, TW Monds who used the property for storage purposes. With time starting to get away from us, we head off for Launnie where we'll grab a bite to eat for brekky, before making our run to Hobart. 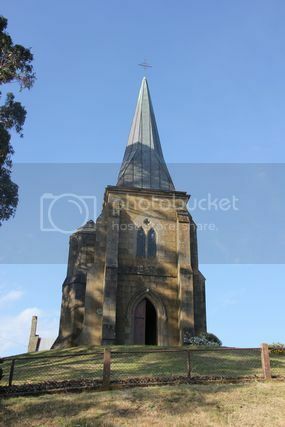 It's an uneventful drive into Launceston, there's a nice big steep drop down the highway coming into town, something i'm not really looking forward to driving back up towing the camper once we leave after having brekky. We grab the opportunity before brekky to refuel the vehicles, then find a place that is open at this early hour and grab a quick bite to eat. Brekky eaten and it's about a 200klm drive to Hobart from here, we have an uneventful drive at a croozey pace, stopping once along the way to stretch our legs and grab a drink from the fridge in the back of the vehicles. The climb up that steep hill out of Launnie wasn't to bad really, i just need to get used to sitting in the left lane when i have the trailer in tow and going slowly at a relaxed pace not working the engine to hard, there'll be plenty more times i need to do this in Tassie as we tour around the state, it's all in the mind set of taking it slow that i need to get used to i guess. Coming into Hobart i ring Fiona on my mobile phone, she is a good family friend of ours that my wife used to work with for many years when we were younger, she moved down to Tasmania a while back, and we will be staying at her place for the next few days camped in the driveway of their house. 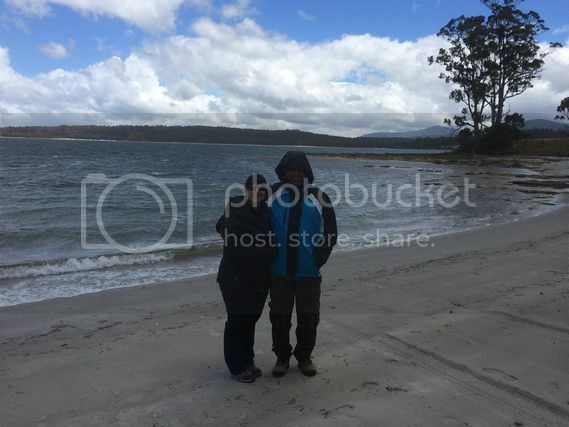 Fiona (and her partner Shane) don't live in Hobart itself, they live at Carlton Beach which is about 40klms to the East of the city. We make good time getting to their place, and Shane tells us to take over the driveway and set up anywhere we like, so we do just that and unhook our trailers and set up for the next few days. Shane and Fiona need to go out somewhere for the afternoon, so we say goodbye to them before heading off ourselves to collect our families from the airport, which is not all that far away really. The families are excited to see us, and my girls enjoyed their first ever adventure on a big plane (previously they'd only ever been on a small Cessna type plane doing a scenic flight over The Simpson Desert). 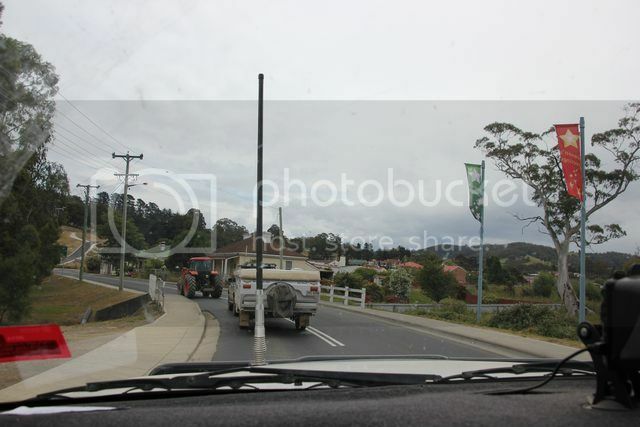 We leave the airport and head back towards Shane and Fiona's place, stopping off in the town of Sorell along the way to do the all important shopping of food and alcohol supplies. Coming into Sorell i notice something we don't see anymore back home in Qld, i spot a Rebels OMC (outlaw motorcyle club) clubhouse on my left, we don't have these OMC clubhouses in Qld anymore since the local state government cracked down on them and made OMC's illegal, so it seemed strange seeing such a clubhouse openly displaying it's existence now (which is how it used to be back home not all that long ago though). 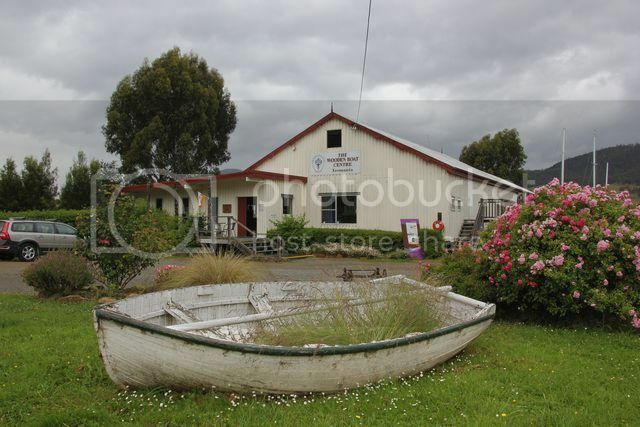 Sorell has both a Coles and Woolworths supermarket in the main street of town, there's a good butcher shop in the same shopping centre where Woolworths is located, aswell as a large bottle shop behind the same shopping centre also. We grab all that we need and head back to Shane and Fiona's place, they are both home by now, so we spend the afternoon having a few drinks with them, and rearranging gear in the campers and vehicles. Shane plays the perfect host and cooks us all up a great bbq meal for dinner, we have a nice sunset to finish the arvo off, and the night is spent having a few laughs with a few more drinks also. The weather has been kind to us thus far, and it appears that today will be another nice day yet again. 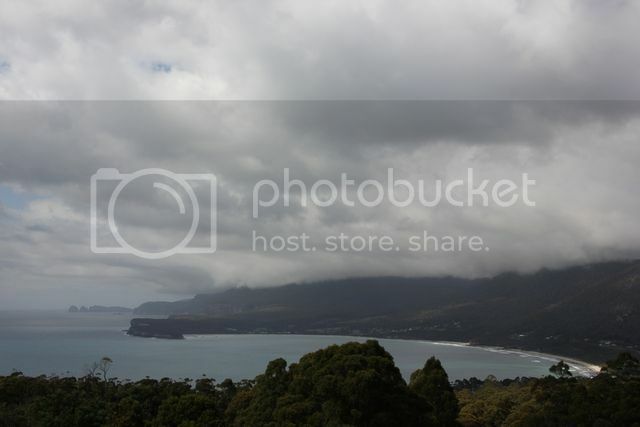 The plan for today is to go up to the top of Mt Wellington to check out the view there, and then maybe to the Cascade Brewery after that, and later this afternoon go visit a fellow MySwag forum member to drop something off i had brought down from home with me. I don't think i've mentioned it already, but strapped down on the top of my camper trailer for the trip to Tassie, i had an extra spare wheel (rim and tyre) off of my Landcruiser that i no longer required, and had for sale a few weeks before we left on our trip. John (aka Draggin on MySwag forum) had contacted me and said that he was from Tassie and heading up to see his brother in the New Year, and if i could get the wheel to his brother's place in Hervey Bay (i think it may have been, but i don't really remember now for sure) that he was interested in buying it from me. 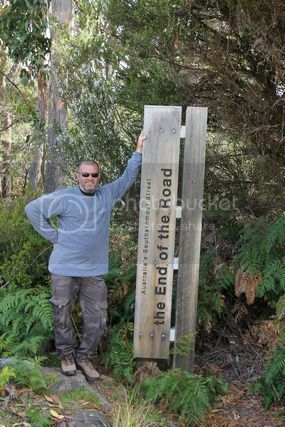 I asked just where it was in Tassie he lived?, and luckily for him it was just outside of Hobart, which happened to be the first place we planned to use the camper trailer to sleep in on our trip. 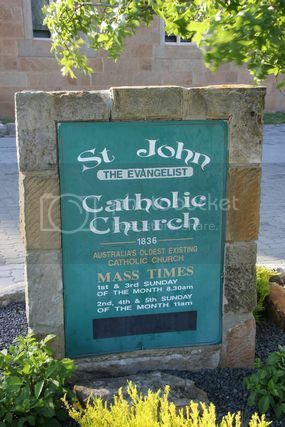 So with that in mind, i said to John that i'd deliver it to him at his home instead (it's just a few thousand klms down the road after all...lol), as i'd be there in a few weeks time. 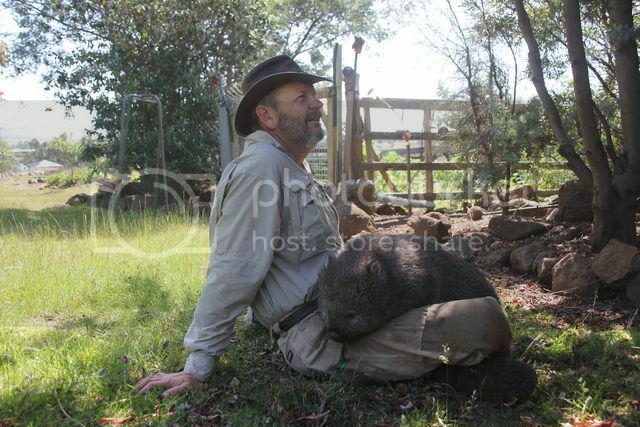 So why do i mention this now?...well i'd spoken to John lastnight on the phone and arranged to meet with him this afternoon to drop the wheel off at his place, it was at this time that he mentioned to me that he cared for orphaned Wombats, and would our kids like to come and see the one he was currently looking after, and have a bit of a play with it. 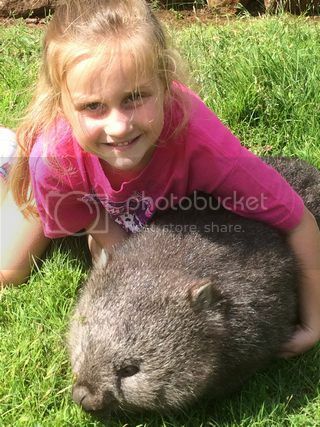 Well who can pass up an offer like that, in my 40 plus years of life thus far i've never gotten to touch or play with a real life Wombat, so i wasn't going to let my kids miss out on having this rare opportunity to do it. So the plan was made to drop by Johns in the afternoon sometime after we'd done our sight seeing. Brekky had and we climb in the fourby's to head to Mt Wellington. Shane had a heap of stuff to do elsewhere, but Fiona has joined us for the day and jumped into the back of our vehicle to play tour guide. Now one would think that having a local along for the drive would mean we wouldn't take any wrong turns going to where we planned to go today, but that didn't seem to happen for some reason. The first thing that went not quite right today....as we headed into town along the Tasman Hwy towards the Tasman Bridge i managed to run a red light, luckily for us though (and anyone else on the road), there was nobody coming through that intersection at the time. This was entirely my own fault for not paying proper attention to where i was driving, but i also slightly blame the stupid set up they have here where you enter onto the Tasman Bridge from the Tasman Hwy. You see at this point of the highway, 2 major roads (the Tasman Hwy and the East Derwent Hwy) merge into one, the lefthand lane of the Tasman Hwy has no traffic lights and cars continue on over the bridge without stopping, but if you happen to be in another lane (there's 2 other lanes you can be in i think from memory? ), then there's actually a set of traffic lights that stop you (if you happen to be looking at those lights and not the vehicles to your left continuing on that is), so as the people on the other highway can cross the bridge also. With the set up they have at this location, i'm sure i'm not the first person that's blasted through a red light here. I'm actually surprised they don't have red light cameras here to be honest, as i'm sure there's been a few accidents at this intersection with how it is set up. Like i said earlier though, entirely my fault, and once you know the road it's more obvious how it works here, but a trap for anyone new to the area IMHO. 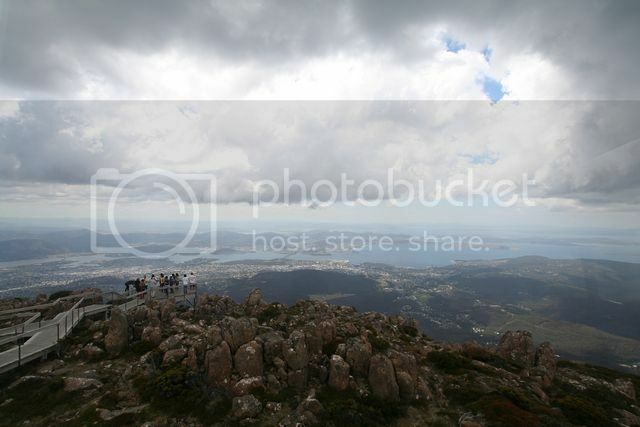 That experience out of the way, we crooze through the middle of Hobart town and head for Mt Wellington, which is only about 20klms to the summit from the city centre. Exiting the city we should have been in the lane for Davey St, but i was in the wrong lane and we ended up heading along Southern Outlet instead, a major arterial road out of town. We had a nice climb up a pretty steep hill before we found an exit to take, a quick turn around over a bridge back over that main road and entry back towards the right direction, and before long we were on the right road headed for where we were supposed to be going to. The climb to the summit of Mt Wellington is up a steepish wndy road, it goes on for ages before you reach the top, but once up there, there's a large car park area to park in, so we find a couple of spots amongst the crowd of vehicles that is up here, and hop out for a look around. Getting out of the vehicles and it's a touch chilly, the weather up here (you're at 1,270 metres) can be pretty different to what you get down in town 20klms away, so we grab our jackets and make for the lookout to check out the spectatcular views. 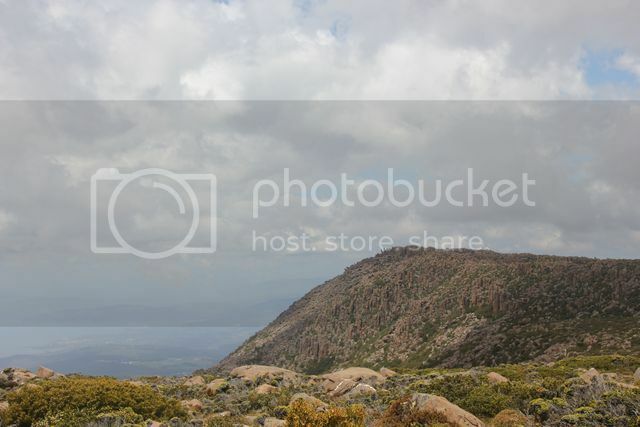 No photos i take / took can do the views from a top Mt Wellington any real justice, i'd rate coming up here a must do if you ever visit Tasmania. Yes the crowds can be a touch annoying, but who can blame these people for wanting to come up here, the views out over Hobart and it's harbour below us are simply stunning. 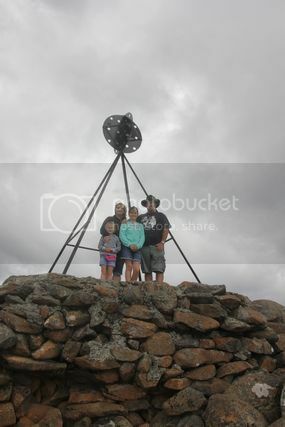 We spend quite some time checking out the views from a few different locations at the summit, we also climb up to the trig marker and get a family pic taken aswell, before eventually leaving and heading back into Hobart city centre for lunch. Once back down the mountain we head into the city and have lunch at a pub in Salamanca. Salamanca is a section of the city that has quite a few sandstone buildings in it that once were warehouses, they have now been converted into cafes, craft shops and the like, and it's a "trendy" area of sorts to visit now. There's quite a bit of on street parking around here, just be aware that it's metered parking (even on weekends) and there were several parking inspectors doing the rounds the entire time we were here having lunch booking people who hadn't paid. A nice meal had at some Irish pub we found and there was more sight seeing to do. 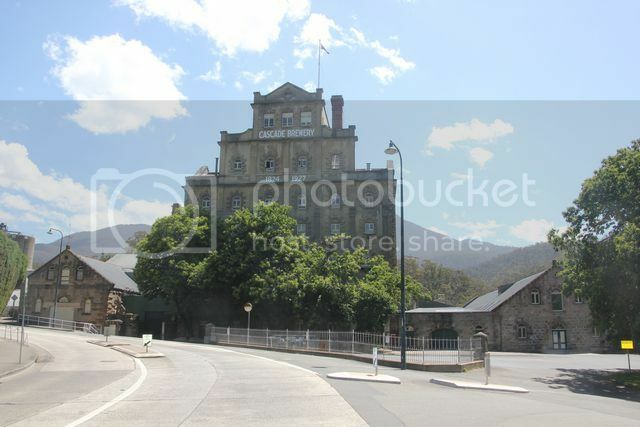 A short drive away is the Cascade Brewery, it is Australia's oldest operating brewery which was established in 1824. You can do a tour of the brewery if you like, but we choose to just have a look around the grounds and gift shop here instead, before continuing on our way once again. Our next stop today was at John's place to drop off the wheel i had sold to him, John lives not to far out of town around the Brighton area, so it wasn't a long drive to get there. 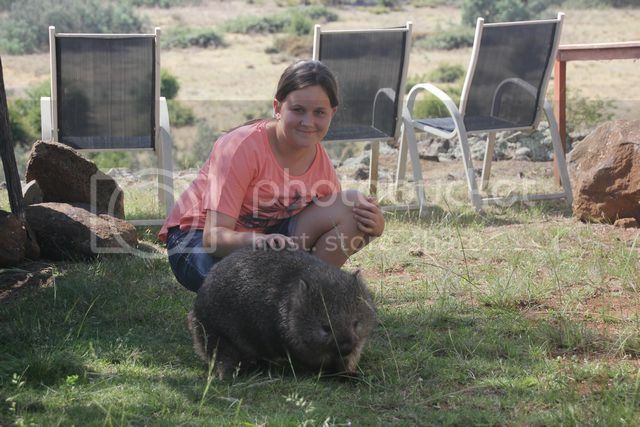 We spend quite a while at Johns place as the kids (both big and small ones) get to play with Nellie the Wombat, John even makes up a bottle at one stage so the kids can feed Nellie. 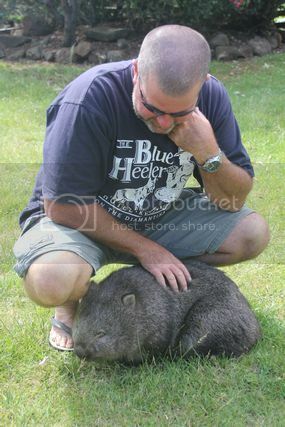 John explains to us how Nellie was orphaned by a vehicle killing the mother wombat, sadly later on in our trip we'd spot several other dead wombats in the middle of various roads as we drove along. With the afternoon starting to get away from us, it was time to thank John for his hospitallity and for letting the kids play with Nellie. Leaving John's place we head towards Tea Tree and jump on Back Tea Tree Rd to head towards Richmond for a stop and look around. 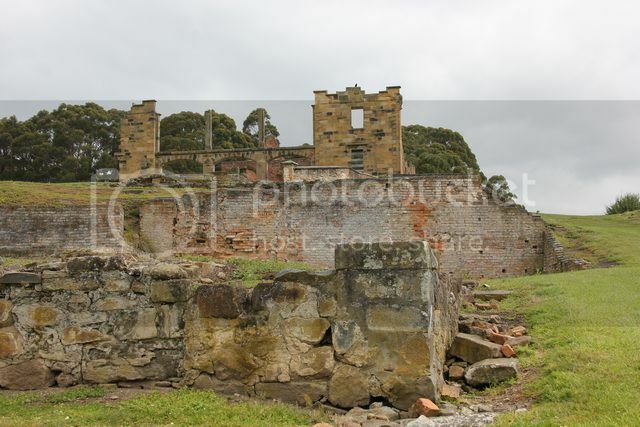 Richmond is a town about 25klms to the North East of Hobart, it's famous for it's historic sandstone buildings and structures, which include amongst other things, the oldest bridge in Australia and the oldest exisiting Catholic Church also. We spend a while walking around here checking the place out, before heading back to Shane and Fionas place. The kids have been pretty good today so we decide we'll take them down to the beach for a while so they can run around and burn off some energy. Carlton Beach is just a short walk from where we are staying, but it's an even shorter car ride there instead...lol...we drive down to the carpark and grab a few drinks from the fridge, walk down onto the beach and kick back for a while looking out over the water relaxing. Eventually we head back to Shane and Fiona's place where once again Shane plays the fantastic host and whips us all up dinner once again...a person could get used to this lifestyle on holidays i reckon...lol. Dinner and dessert had, a few drinks also and it was time for bed for all of us. 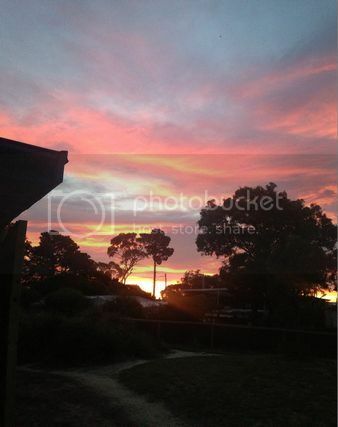 Loving the pics mate. Great report so far. The Irish pub at Salamanca had the best Peppered Squid I had tasted. Cheers Ian, plenty more pics to come yet (only about 6 more weeks worth...lol). Fiona that was with us in Hobart had the squid at the pub for lunch also, nice meals alround there if i recall correctly. 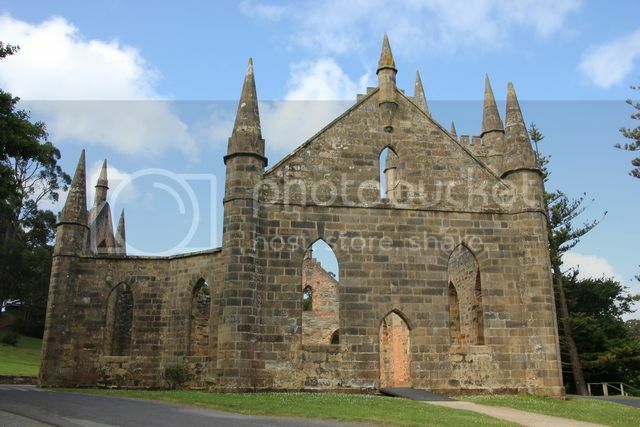 So the main plan for today is to visit Port Arthur, along with a few other stops along the way also. After dinner lastnight Shane asked about our plans for today, and when we mentioned where we were going, he suggested we take a scenic route along Carlton River Rd to Dunally instead of heading back onto the Arthur Highway and taking that all the way down to Port Arthur....which is what we did. 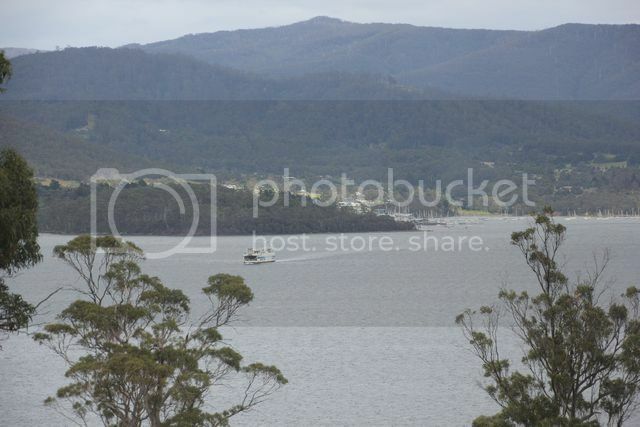 After now having done that drive, can i suggest that anyone heading out of Hobart towards Port Arthur do the very same drive themselves, exit the highway at Forcett heading for Dodges Ferry, then turn left onto Carlton River Rd and keep following that to the end. 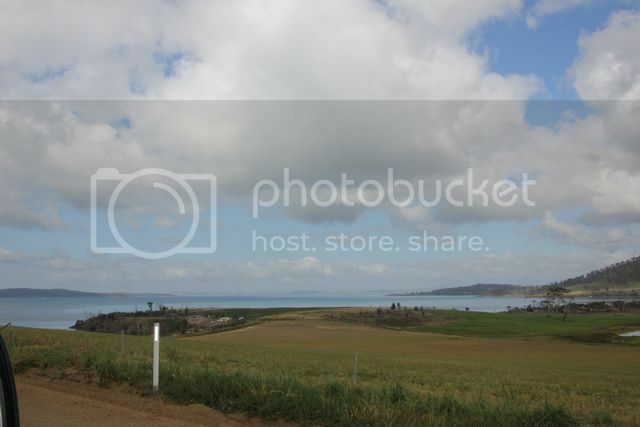 I had a quick look on a map lastnight where we had to go but never really took much notice of the water we'd be skirting by today.....so imagine my surprise when we crest a hill on a back country road and there's this bloody huge bay of water sitting out there infront of us...it really was quite unexpected. The road itself we travelled has a very small section of gravel to traverse, it was in such condition at the time we travelled along it, that i'd have no issue at all taking a normal sedan along this route. It's a nice slow paced drive you do along this route, if you're in a hurry go the highway, if it's scenery you want then this is the drive for you. 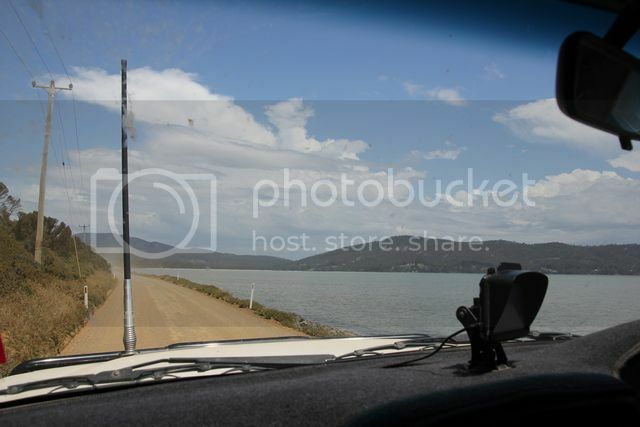 As i alluded to already, we follow Carlton River Rd East to it's end at a T intersection and turn right onto Fulham Rd, we then follow this road as it skirts it's way along the edge of the bay all the way until we hook back up onto the Arthur Highway and head South towards Port Arthur. Turning South onto the Arthur Highway we follow this for a short while before we then turn left onto Pirates Bay Drive to go see the Tesselated Pavement. 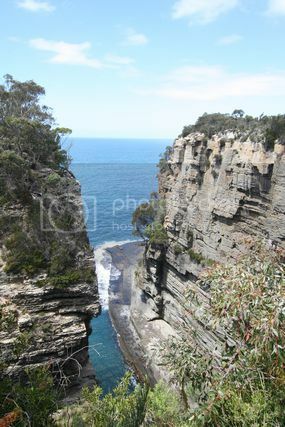 Before reaching this destination we stop off at the Tasman National Park lookout to check out the spectacular coastline view that is available to be seen here. 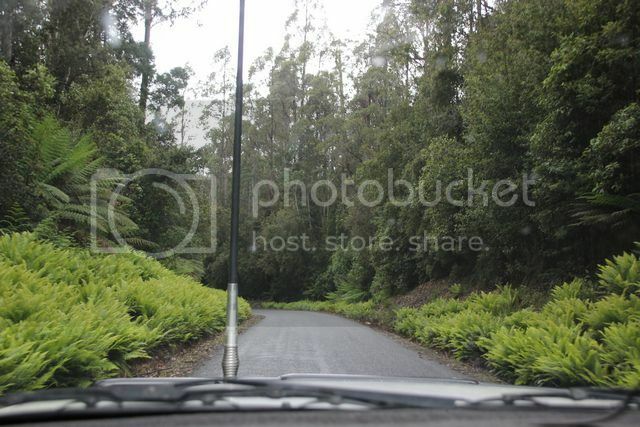 Pics taken from the lookout and we are back in the vehicles again to continue along the same road for the short drive to the Tesselated Pavement carpark. 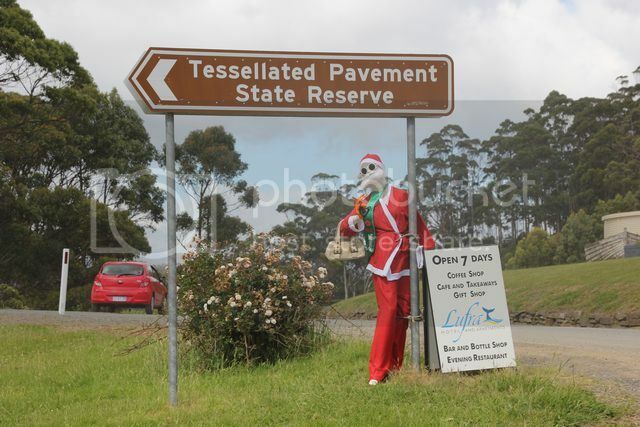 Reaching the carpark we find that the local Xmas spirit is alive and well, even if Santa does look to be a bit like a drag queen IMHO...lol. 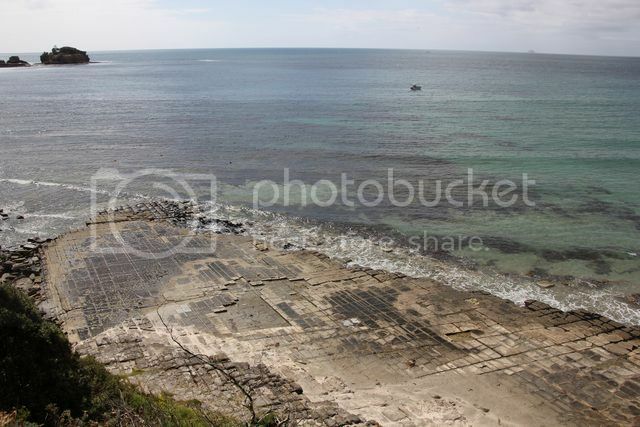 We park the fourbies and do the short walk down to the Tesselated Pavement, a truely remarkable rock formation that looks like someone has layed large stone pavers down by the waterline. 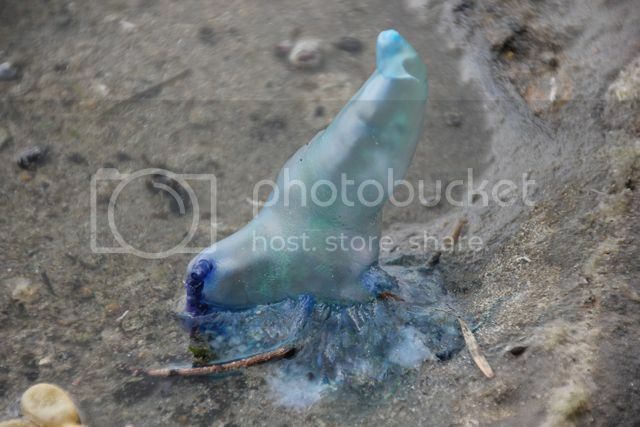 We walk around here for a while checking the place out and i notice a huge blue bottle type of animal on the ground that i also take a pic of aswell. With our look around here complete we continue to walk along the beach rather then back up the track we came down from the carpark. 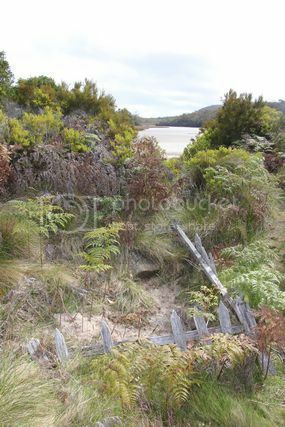 We find an exit track up off the beach that appears to run into the back of some peoples houses at first look, but upon closer inspection we find that if we walk to the right of the house we came to, the track skirts it's way along the properties fenceline and up a hill to the roadway. A bit of a walk back along the edge of the road and we are soon back at our vehicles once again, where we grab a few cold drinks from the fridges to quench our thirsts. 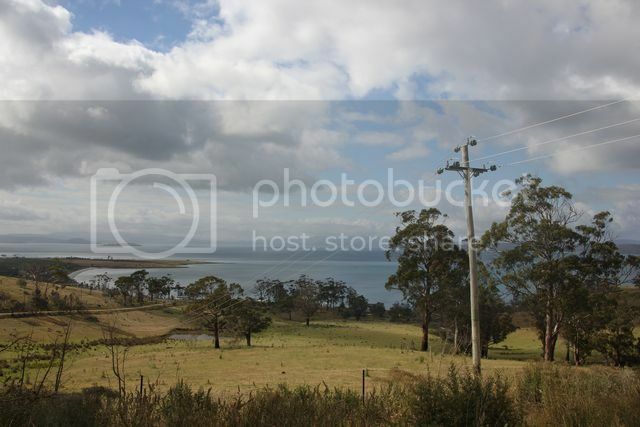 Back in the vehicles again and we rejoin the main highway where our next stop is another short drive down the road at the Eaglehawk Neck Dog Line. 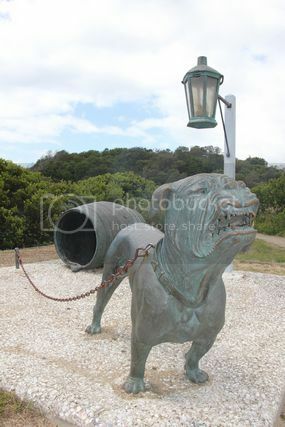 The Dog Line was established in 1832 along the narrow isthmus at Eaglehawk Neck....basically it was a group of 18 viscious guard dogs (and lanterns) chained at intervals along a line at The Neck, the dogs would alert the guards should any convicts try and escape through this area. There was very few options convicts could take as an escape route heading North from Port Arthur through here, one was to try and swim across the channel of water of Norfolk Bay (though most convicts couldn't swim and belived the bays were infested with sharks), or they could also try and sneek past the line of viscious guard dogs that covered the width of the land mass of The Neck. There was a few successful escapes made over the years, but one of the funnier not so successful attempts was that of a convict named Billy Hunt, who dressed himself up as a kangaroo and attempted to hop his way across the neck....unfortunately for Billy a guard decided that roo meat would make a very nice meal indeed and he started to shoot at him. 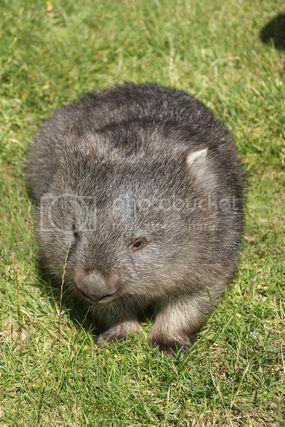 Billy was then forced to reveal his true identity and was promptly recaptured. Back in the vehicles again and continuing South we soon turn left onto Blowhole Rd, strangely enough to visit The Blowhole. 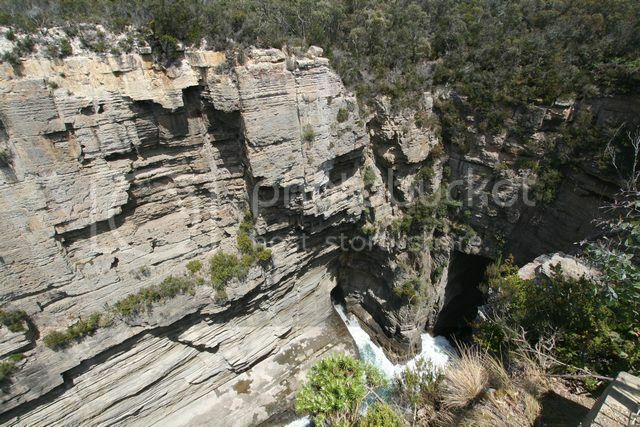 When i was a kid last holidaying in Tasmania I remember visiting a blowhole, but when we arrive at this location it looks nothing like i remember it being at all...but that was nearly 30 years ago after all i think to myself. 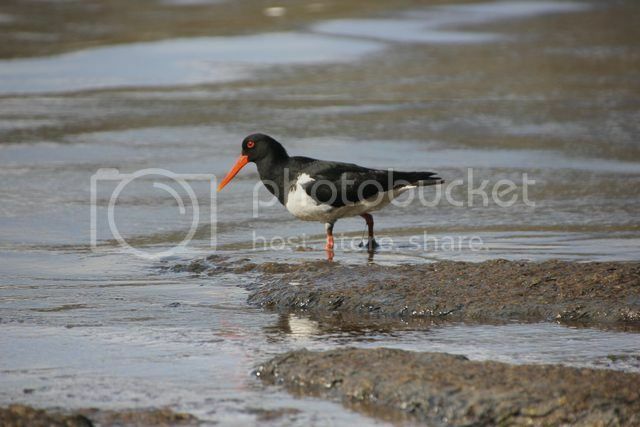 There's a fish and chip van we notice in the carpark area that seems to be pretty popular, we bypass it for now and make our way to the blowhole a very short walk away to take some pics. 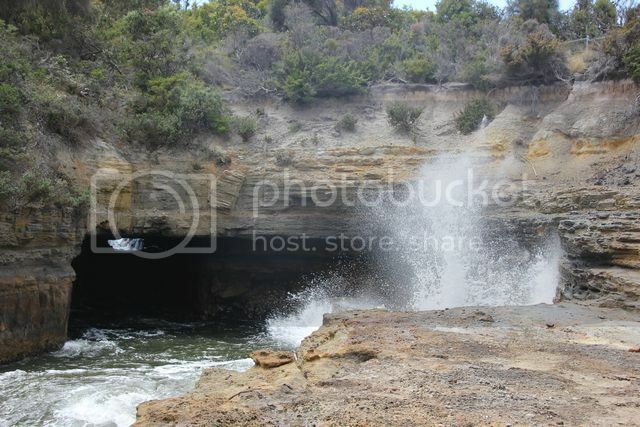 From The Blowhole there's another short walk to be done up to the cliff face looking out over the ocean, we do this walk aswell and then head back to the carpark for an earlyish lunch, where we grab some hot chips from the van to go on our ham sandwhichs that we make for lunch. 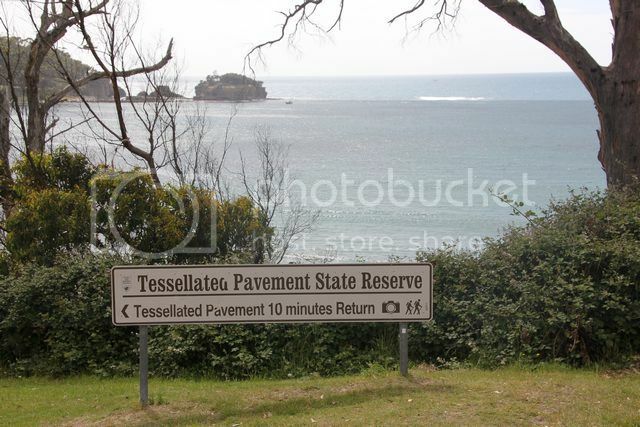 Lunch eaten and we then continue on our drive to the next stop which is the Tasman Arch. 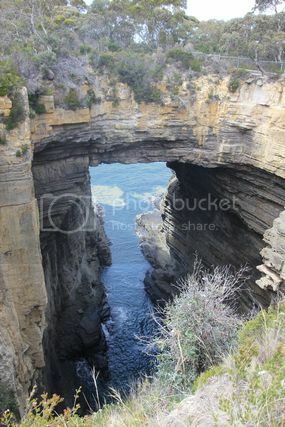 You literally pull up right beside the arch here, so no need to walk anywhere to view it, though there is a walk to be done to another lookout area a short distance away, aswell as you can walk to view the Devils Kitchen from here also. 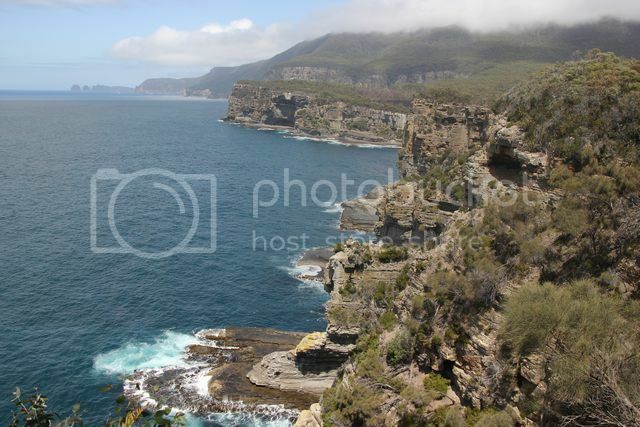 We do the walk to the lookout which gives yet another pretty spectacular view of the rugged coastline, we then walk to the Devils Kitchen which isn't to far away really. Sarah was back at the vehicles missing out on the veiws to be seen here due to their youngest being asleep in the back seat of their vehicle, so i quickly run back to the fourbies and tell her to go have a look at the view for herself. Sarah at first says nah she won't worry about it, but i tell her it's well worth seeing, so she heads off to check it out for herself whilst i do some baby sitting. Once we are all back at the vehicles we continue driving to the end of this road which turns out to be not far at all, just around from where we walked to view the Devils Kitchen. There's a viewing area here at the end of the road which turns out to be better then the spot we walked to IMHO, so for those who don't do the walk from the arch and just drive down to this point, i reckon you wouldn't be missing out to badly. 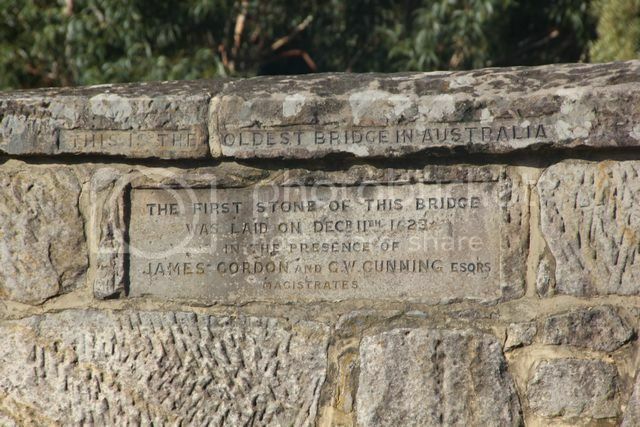 and today represents the best surviving examples of large-scale convict transportation and the colonial expansion of European powers through the presence and labour of convicts. 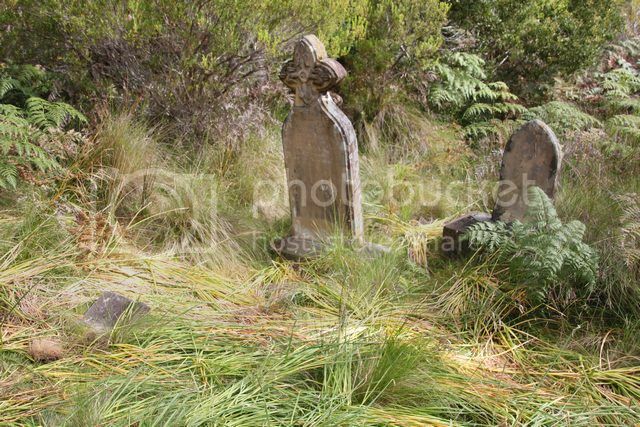 # 2 - in 1996 it was the site of Australia's biggest mass murder / killing spree, which resulted in the deaths of 35 people and the wounding of another 25 people, and this eventually resulted in a national ban on semi-automatic shotguns and rifles. This fact isn't really talked about at the tourist attraction for obvious reasons, there is however a memorial garden area dedicated to this sad event to be found on site. 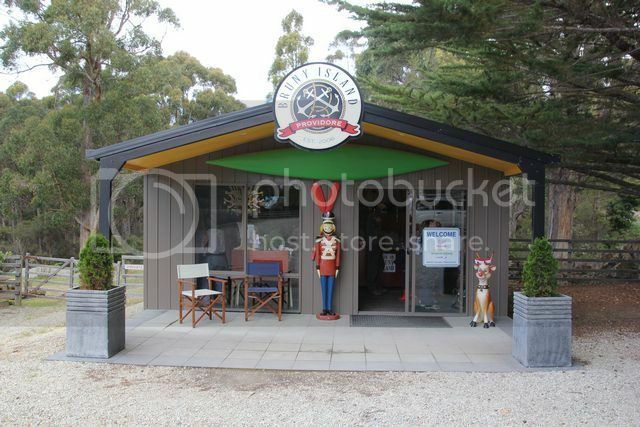 We park our vehicles in the large carpark area and walk down to the entrance building / kiosk to pay our entry fee. There's a variety of entry fees you can pay to get into Port Arthur, depending on what you want to see and do. Standard entry fee is $35 for an adult or $80 for a family, which is 2 adults and six kids. This is a 2 day pass (day time hours only) and this gets you access to the ruins, gardens and restored houses on the main area of the property, it also includes a 30 minute harbour cruise on the MV Marana and there's also a 40 minute guided walking tour you can do around the grounds included in the entry price (though our guide went for atleast an hour). 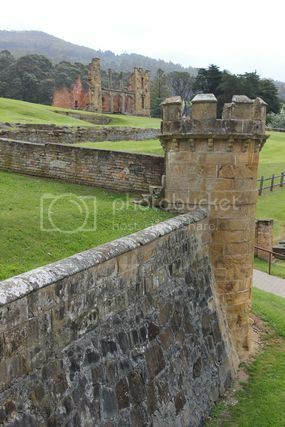 Additional to the standard entry fee is an optional upgrade pass, it gets you a 2 year pass to come and go as many times as you like to Port Arthur, and costs an extra $10 for an adult or $20 for a family. 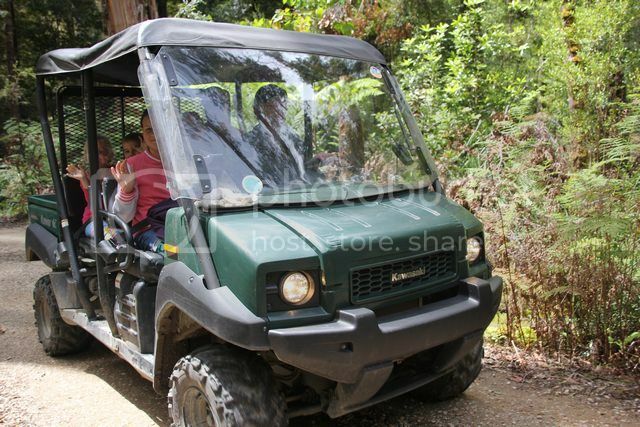 Aswell as the upgrade pass there are also optional tours you can pay to do whilst here. The Isle of the Dead tour and Point Puer Boys Prison tours cost an extra $15 for an adult or $35 for a family to do each tour, you can choose which ever tour you want to do, or do both. Being we haven't really allowed enough time to do any extra tours (we didn't really allow enough time fullstop for here in hindsight, i reckon allow the entire day), we pay our standard entry fee and enter the site. In about 15 minutes time they have a cruise on the harbour leaving, so this is the first thing we do is head down to that area for our boat ride. It's a decent sized boat you travel the harbour on, the cruise passes the Dockyard, Point Puer Boys’ Prison, and then does a lap out around The Isle of the Dead cemetery before returning back to where you departed from. 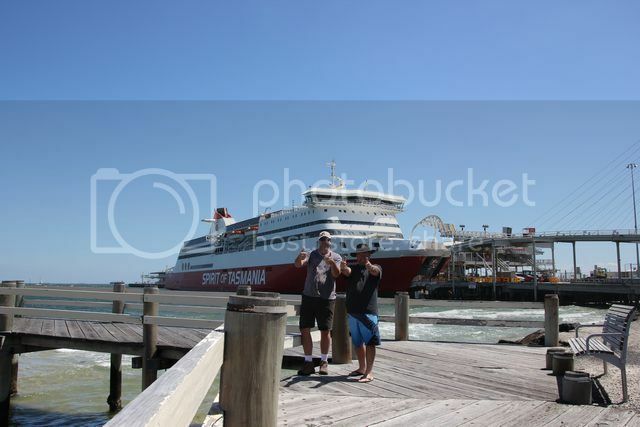 The entire time you do the cruise they have a running commentary about the site itself, it's quite interesting listening to the facts being mentioned and a great way to start your tour here. With our harbour cruise done we then take a walk to check out the old dockyard, which built hundreds of vessels with convict labour over the years of the penal settlements operation. 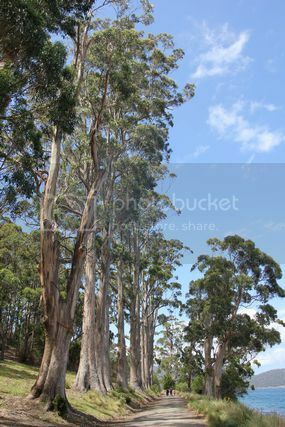 Before reaching there though, we notice the row of Blue Gum trees lining the walkway beside us. 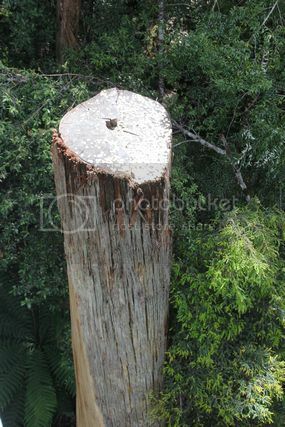 A board informs us that these were planted by convicts back in 1860, and it was one of the tree types they used in ship building, and also ideal for the building of poles, piles and sleepers. 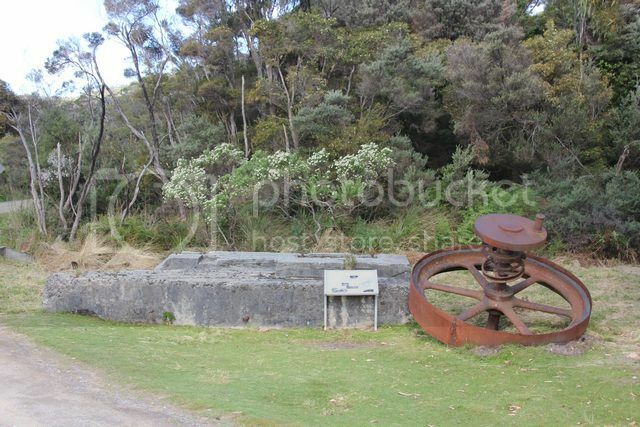 We do a walk around the dockyard and inspect the sculpture of a ships hull on display here, aswell as the old lime kiln and a few other things also, before making our way back to the main area of the site which has the bulk of the ruins located on it. 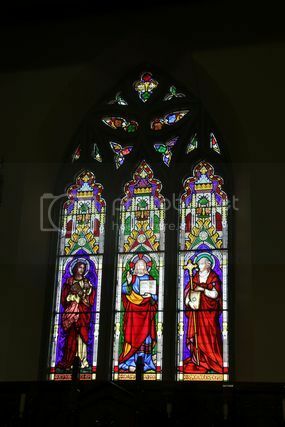 As mentioned already, they do a free guided walking tour included in your entry fee, we do this next and get the run down of how the settlement was formed, how it ran, the fires that destroyed certain buildings etc etc. 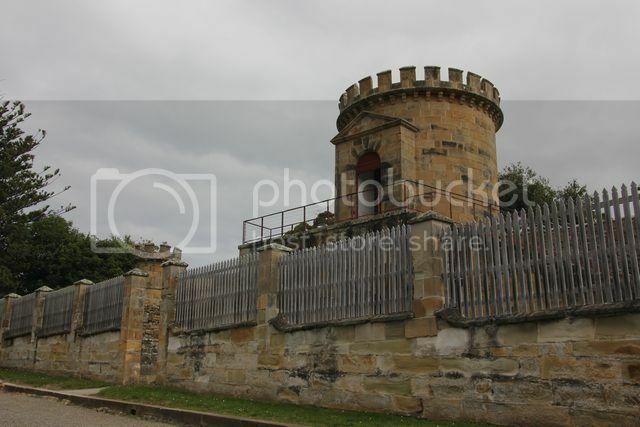 The main building you see in the grounds is the old Penitentiary, it had been undergoing extensive restoration work to stabilise the structures walls for quite a while now, and today they were busy completing the pulling down of all the temporary fencing that has kept visitors away from this building. 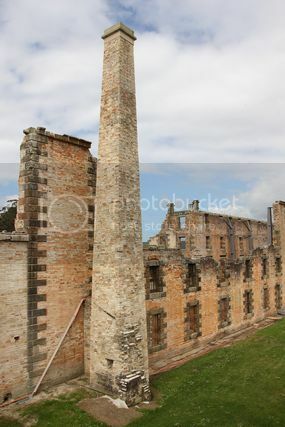 Sadly we still couldn't get access to this particular building as it was still a bit of a work area with machinery moving construction gear away from the site, but anyone that visits Port Arthur today should be able to walk around and through the inside of this building, they had even built ramps to allow wheel chair access to the building also. Eventually our guided walking tour ends, it was supposed to be a 40 minute tour but ran for well over an hour, the staff member was pretty passionate about her job and more then happy to answer any questions people asked her. From here we spent a few hours walking around the site itself randomly inspecting the ruins and surrounding gardens, we realised at this point we hadn't allowed enough time to see all that was here to be seen but never the less we really enjoyed our visit here. One thing we notice for the first time whilst being in Tasmania was the rabbits we were seeing, we normally don't get to see them all that often back home, but here they seem to be everywhere. 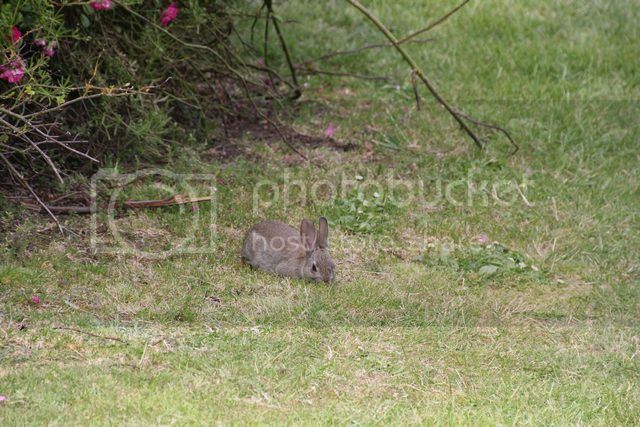 Over the coming weeks we'd be amazed at just how many rabbits are in Tasmania, back home i see the occasional hare if i'm out in the country side somewhere, but here in Tassie we see rabbits everywhere and in big numbers. 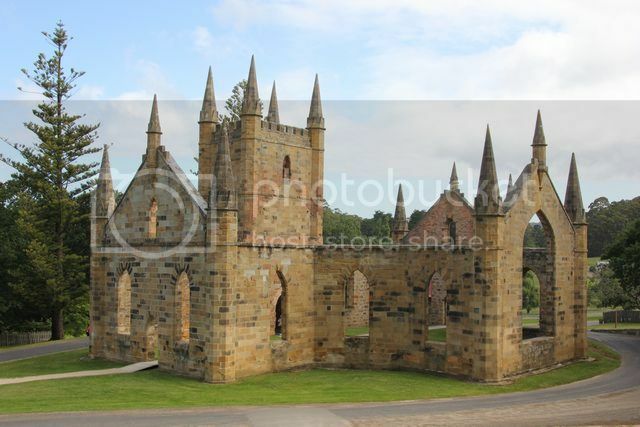 I'll let the pics do the talking for the rest of our Port Arthur experience, the ruins are magnificent to inspect, plenty of information to be found inside other buildings you can walk through, and the gardens are just beautiful also....allow an entire day to have a good look around this place, not half a day like we did. On a side note..... you may notice something missing from most of my pics, there's no people to be seen in them. Whilst it's only a few weeks before Xmas and plenty of tourists about due to being school holidays already on mainland Australia, the place isn't what i'd call super busy. 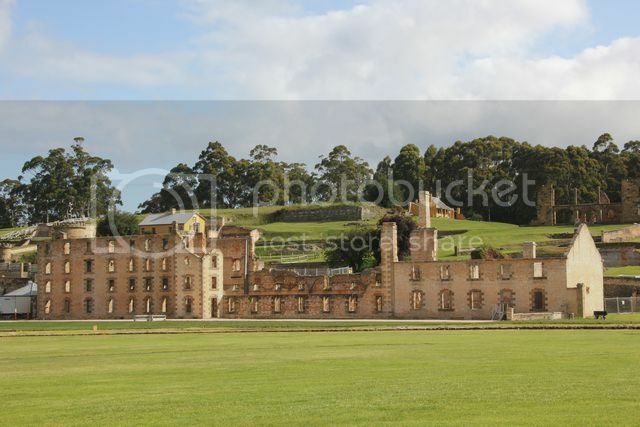 The grounds here are massive and people spread out about the place, if you wait long enough you can manage to get pics of the buildings and grounds without any people in them which is pretty cool i thought. Leaving Port Arthur we head back North for camp at Shane and Fionas place once again tonight, along the way we take a short detour to go check out a campsite we had considered staying at for our Port Arthur visit, but decided against as we thought it's just be easier leaving the campers set up at one location for a few nights and tour from there instead. 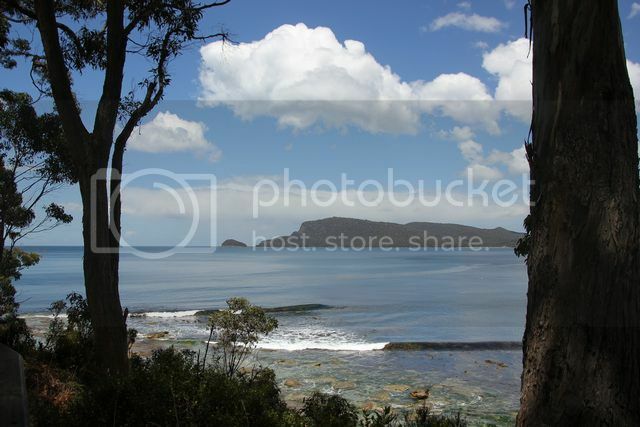 Fortesque Bay is a National Parks campground which is accessed via a gravel road, it's pretty easy driving and accessable by 2wd vehicles. 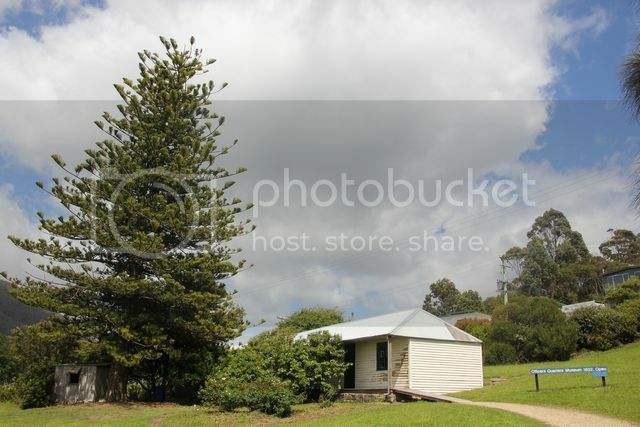 The campground has a toilet block with showers, though i didn't look to see if the showers were hot or if they cost anything to operate. The campground itself is located by the water with many sites having water views, one down side though is it isn't the most level of places for camping on. 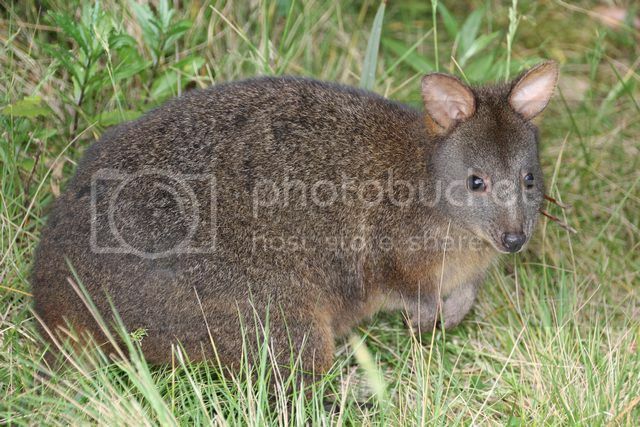 Overall the location is nice with wallabies freely wandering about the place, you just need to be lucky enough to jag one of the more level sites to set up on. 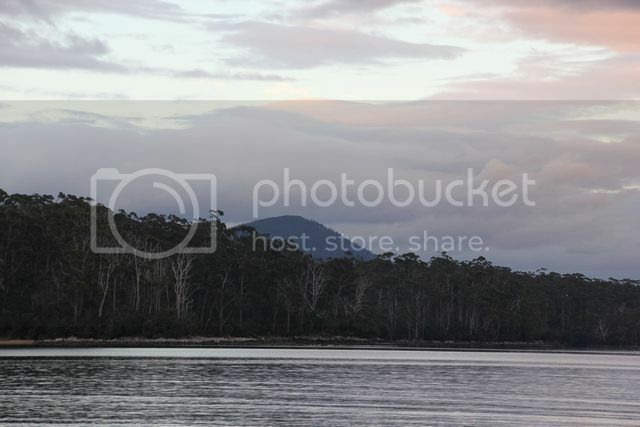 We have a bit of a look around the campground and enjoy the water view for a while before calling it day and heading back to camp for what wuill be a bit of pretty late dinner. We back track the same way via Dunally that we came along today, before making a slight detour to the local BWS hotel down the road to buy Shane and Fiona a few thank you presents for letting us camp in their front yard the past few nights. Tomorrow it's time to hit the road for a new location to set up camp at for a few nights. 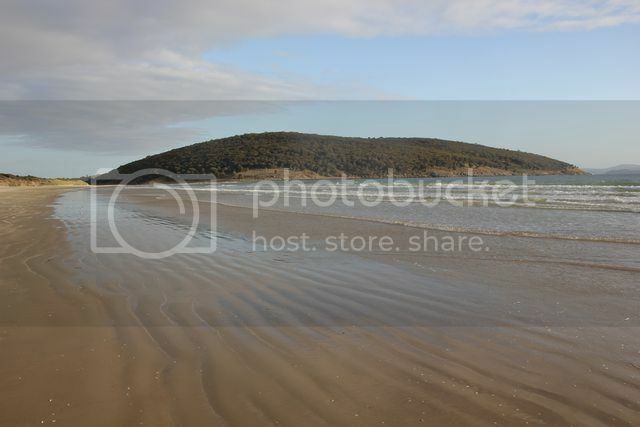 It was a bit hard to get out of bed this morning after such a big day yesterday, but today we needed to pack up the camper and head off to Bruny Island which be our camp for the next few nights. 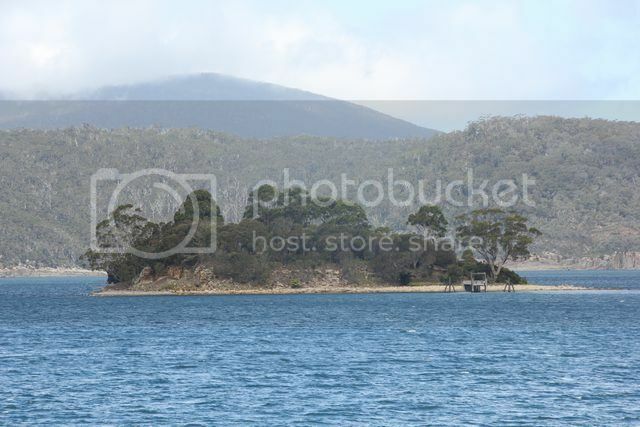 It's only about 130klms of driving required to get to our next camp, so it's not a big days drive required, but we do need to catch a ferry across to the island which departs from Kettering and lands on North Bruny Island at Roberts Point. First things first though....by the time we wake up and get out of bed today Shane and Fiona are long gone and off to work. 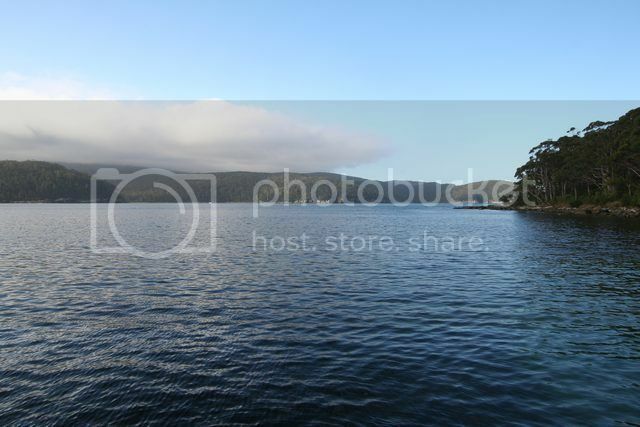 It's another beaut day weather wise and we eventually have brekky and pack up camp ready to head off for Bruny Island. 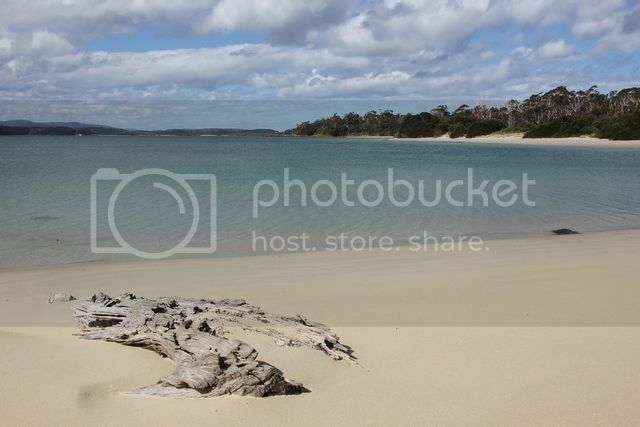 Levaing Carlton Beach we head back towards Hobart, stopping off in Sorell to grab some last minutes supplies (fresh bread and fuel etc), and i try and get a gas bottle from the camper trailer refilled at the local BP servo. The guy at the servo tries to fill the bottle but it has a leak which makes it unsafe to use (which i sort of knew about, but if you wound it all the way open it actually stopped leaking). Luckily for us the servo does Swap and Go gas bottles and had one the same size that fat in the gas bottle holder of the trailer, so i grab that and pay for the fuel and new gas bottle exchange, before heading off for Bruny Island. It's an uneventful run through Hobart and on to Kettering, where we follow the large road signs that direct us to the ferry. 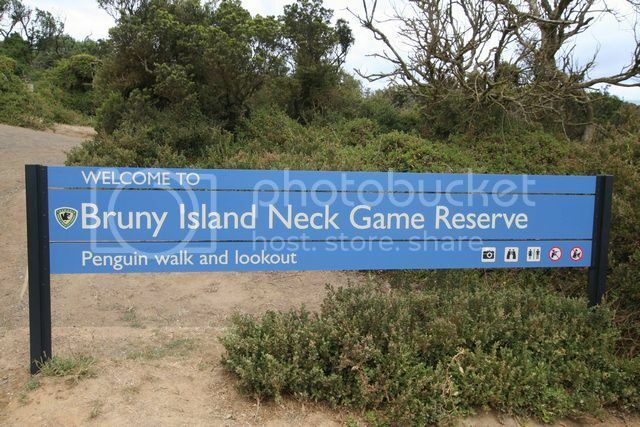 Now here's a heads up for anyone heading over to Bruny Island....the ferry is a cash only payment system, even though there's a booth to pay at when you get there, you still need cash to make the payment, so make sure you come prepared. Even though Jeff had informed me about this cash only system and we came prepared, some how he forgot all about it and arrived there with no cash in his wallet...lol. There's a NAB ATM outside the kiosk where you line up for the ferry, so Sarah ran inside there to grab some cash, and before long we joined the large queue that had formed here to catch the ferry across to the island. Normally it would cost $65 for a vehicle and camper of my size in this peak period, but i reckon it must have been my dashing good looks that caught the eye of the lady collecting the payments that put her in a good mood, because she said just make it $60 thanks....which i happily paid, before giving her a sly wink as i drove off... (ok maybe that last bit didn't happen, but i did get the $5 discount for some reason...lol). Loading of vehicles onto the barge is a bit of a fine art, how they manage to squeeze all the vehicles on in one go was simply amazing. 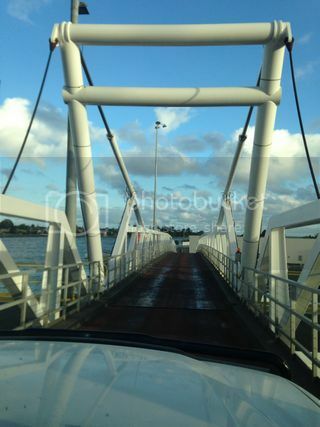 Having driven my fourby for many years i have fair idea how wide it is, following the loading guys instructions he steers me hard over to the left side of the boat. 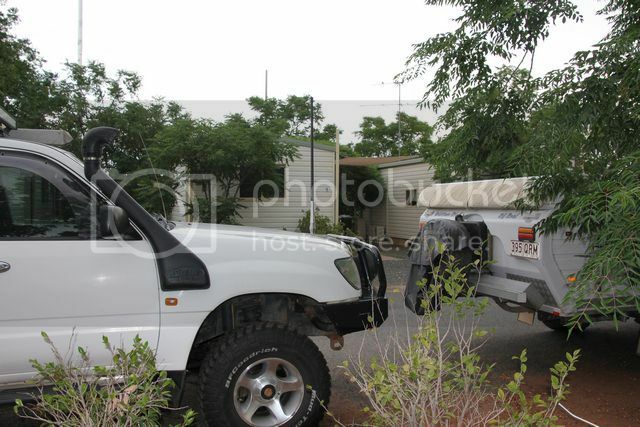 As i get to what i think is pretty close to a large solid timber door to the left side my vehicle, i think yeah that bullbar is about to hit, much to my surprise though the loading guy is telling me to keep going left. 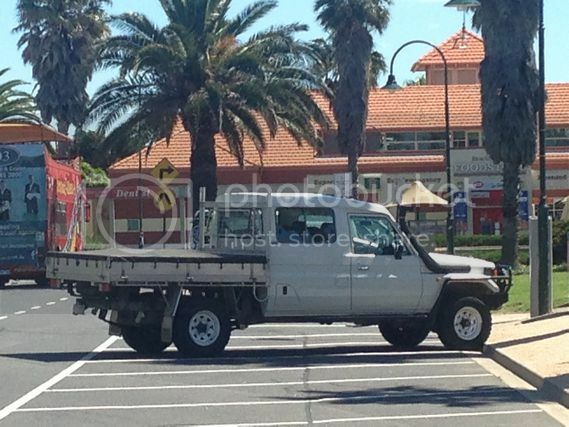 Thinking this guy knows what he's doing as he does this for a living, and can obviously see the front corner of my bullbar better then i can being he's standing about a metre and a half infront of it, i continue to veer the vehicle left....BANG!! !....i smack into the timber door and bounce off of it. FFS i think to myself, i knew i was going to hit that. When i park the vehicle up a touch further on the guy comes up to my window and says, "sorry about that, entirely my fault"...ya reckon i think to myself...lol... i hop out and inspect the strike zone but there's no damage to be seen, thank god it was the steel bullbar that smashed it and not some sort of plastic bumper on another vehicle. Waiting for the final vehicles to get loaded i start hearing some shouting going on at the rear of the ferry. There's some guy who has no idea how to drive a vehicle trying to maneuver into the area he's being directed to, i hear a loud bang as he slams into the side of the ferry at one stage, then there's a fair bit more shouting going on as he struggles to get the vehicle into psoition, gunning the vehicle when he should be taking easy, and bunny hopping it also. Eventually the vehicle gets put into position and finally we get to set sail. 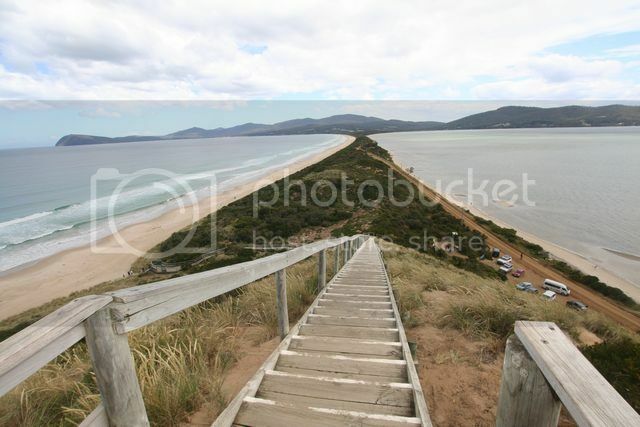 It's only a short ride across the channel to Bruny Island, probably not more then about 15 minutes ride maybe. 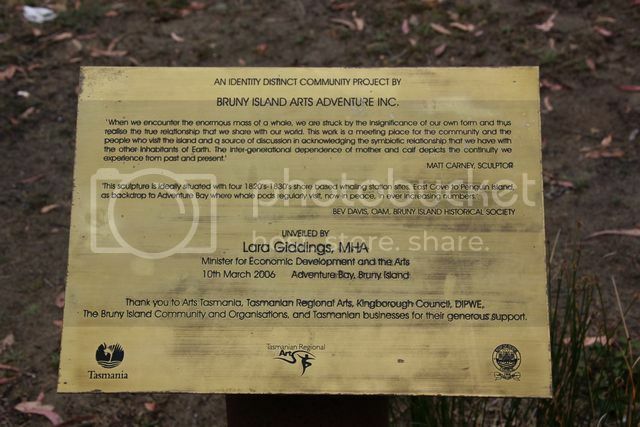 Bruny Island is made up of 2 main island sections that are joined by a long narrow land mass called The Neck, there's quite a bit of bitumin road and good gravel roads on the island making it easily drivable in a 2wd vehicle, but there's also a few areas that are only accessible if you own a 4wd. 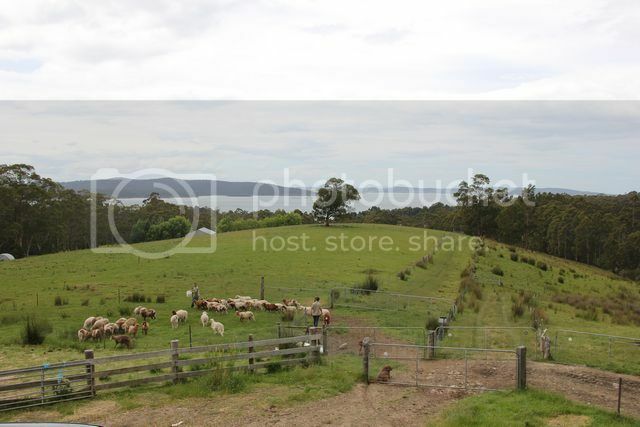 We unload from the ferry and immediately there's a steepish climb up a fairly long hill that greets us, we slowly climb the hill and then punt along at a leisurely pace on the windy road for about 15 minutes before we find ourselves pulling up at the Bruny Island Cheese Company. The cheese shop is open daily from 10 a.m till 5 p.m, they do regular free tastings and there's a window where you can watch them making the cheeses out the back also. We purchase some cheeses after doing a tasting and continue on our way South to tonights camp. 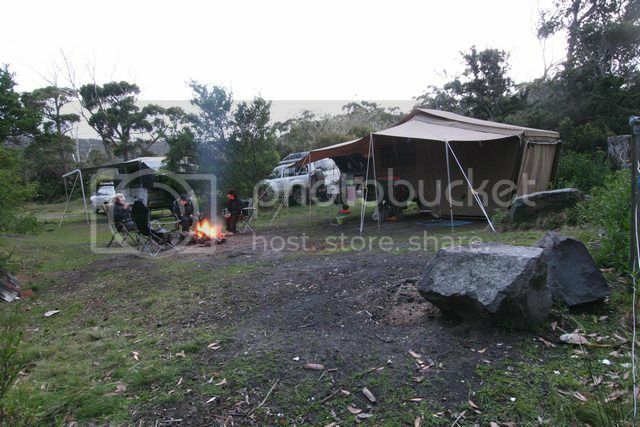 There's a few differnet camp locations to choose from around different areas when staying on Bruny Island, but where we are headed for is only accessable if you own a 4wd. 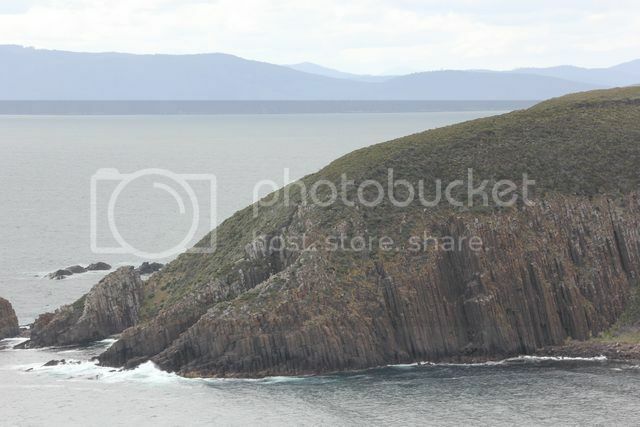 Cloudy Bay is where we are headed, to get there you need to drive to the Southern end of Bruny Island and then do a short beach drive to the camp area. We leave the cheese shop and before long are quickly pulling up to take a picture of an echidna we spot crossing the road in front us. 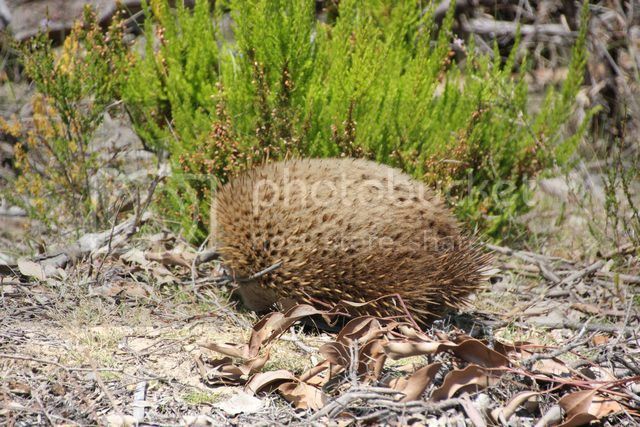 Echidnas are surprising quick when they want to be, i manage to grab a quick pic of it as it disappears into the scrub beside the road, but it's a nothing special pic. Back in the vehicle and we continue heading South, there's some nice water views to be seen as we drive along and then we hit a small section of gravel road which turns out to be The Neck, we want to stop to go up to the lookout that is located here, but there is only a small parking bay, and there's a few vehicles already here and no room for us with our trailers on the back of our vehicles. We continue on past this point without stopping and decide we'll come back tomorrow for a look when we don't have the trailers with us. 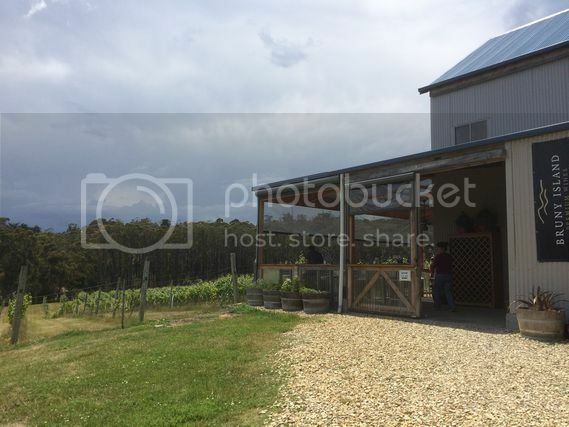 Continuing on along South Bruny Island we soon pull into the local winery, Bruny Island Premium Wines is a small family owned winery that is open daily from 11 a.m - 5 p.m, it has free tastings at the cellar door. The wives do a tasting and purchase a few bottles to enjoy later on, we jump back in the vehicles and head off for camp once again. 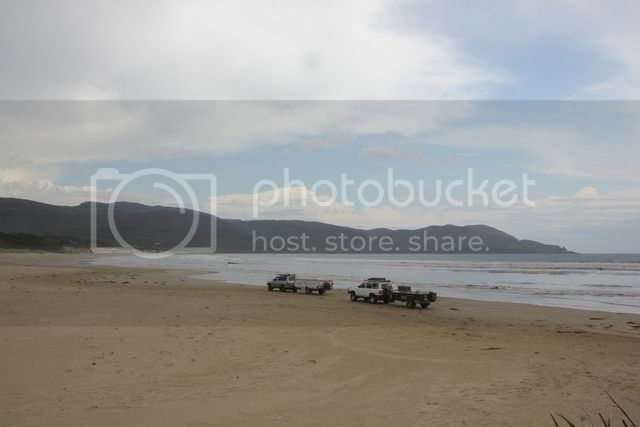 We follow Cloudy Bay Rd to it's end where we then drop down onto the beach, we pull up on the beach to deflate our tyres as we have no idea what the local beach conditions are like, even though the sand looks to be pretty firm. As we start to deflate our tyres a heavy shower of rain decides right now would be good time to drop on top of us. 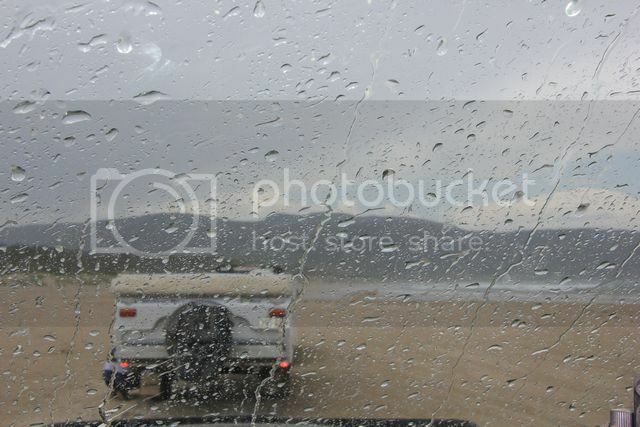 I make a dash back around into the drivers seat to seek cover for while, and Jeff crouches down beside his vehicle trying to keep dry as the wind blows the rain in sideways. The rain doesn't last long and we finish deflating the tyres for the short run down the beach. 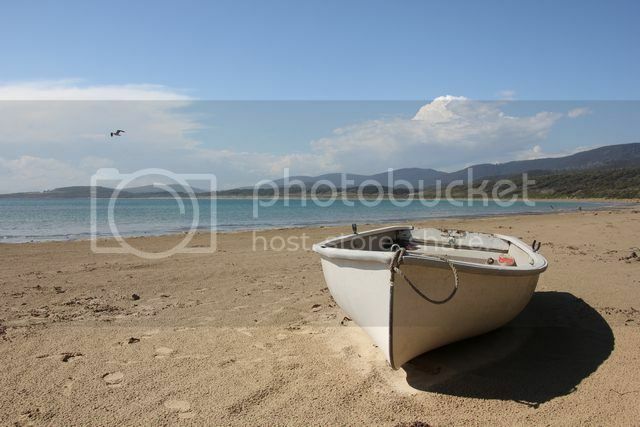 As we expected the sand is quite firm and pretty easy going, best to be safe then sorry though, as we didn't want to get bogged with the trailers on the back on a beach we have no knowledge about. Cloudy Corner is the name of the camp area we are camping in, it's a 3klm run down the beach to get to it, you then exit off the beach up a small track that then takes you into the campground. There's pit toilets located in the campground but no other facilities, you camp just back from the water and views of the bay are pretty limited from most areas you can set up in, but it's only a very short walk to get down to the beach. The campground has a ring road that loops around it and back to where you enter the grounds, we do a lap around the place and end up back at the start at the first area we spotted on our arrival to set up in. Setting up camp we hear the odd bit of thunder from a small storm that is approaching, Jeff is pretty much finished and i still have my awning to set up when it starts to rain lightly......suddenly it starts to hail on us...WTF we think...it's only pea sized hail, but it's most unexpected. With my awning only partly set up, Jeff and myself stand there holding the canvas up above us whilst we watch the hail and rain falling. Luckily it doesn't last all that long, and as quickly as it started it has finished, allowing me to finish setting up the camper. We find out later on that Hobart had a large amount of hail fall there from that same storm, we only copped the edge of it and i think it had started to die down a fair bit before it reached us also. With camp set up we have a late lunch of toasted sangas to help warm up with the overcast conditions that are about. As the afternoon goes on the weather improves remarkably and we take the kids down to the beach for a play, whilst we enjoy a few drinks looking out over the bay. The skies start to look threatening once again so we call it a day on the beach and head back up to camp, it doesn't actually rain after that but we did hear a few more rumbles from memory. 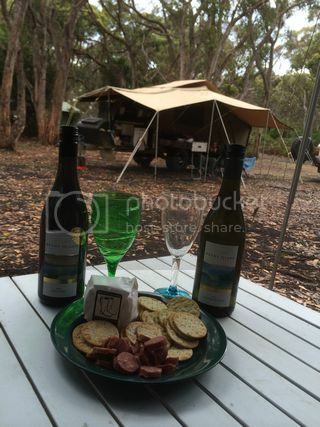 We get a fire going at camp and decide it's time for nibbles, the ladies grab the wine and cheese they purchased early today and we sample some of the local delights. My wife decides to put her boots on to keep her feet warm, she puts a foot into one boot and finds some pieces of glass in there from the massive hail storm that hit Brisbane, and smashed windows in our house a few weeks before we left on holidays...luckily she didn't cut herself though. Night starts to fall and it's time to make dinner, we eat this sitting around the fire and spend the rest of the evening sitting around the fire having a few more drinks before heading off to bed for the night. We all had a nice little sleep in this morning, it was a touch rainy overnight and still lightly showering on and off this morning, nothing like the sound of rain on canvas to make you want to stay in bed i say...lol. Eventually we drag ourselves outside and have brekky and get ready to explore the island. 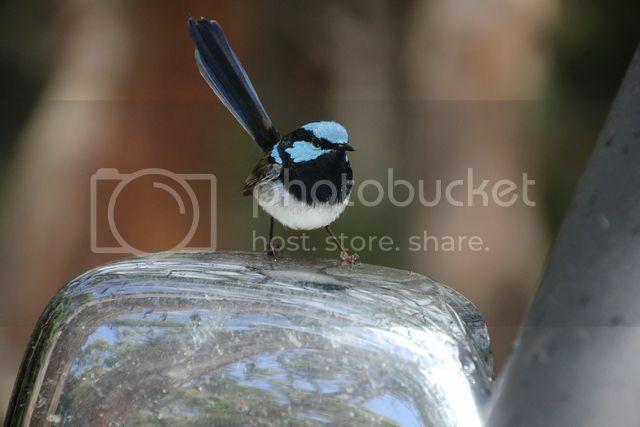 Just as we are about to leave i notice a male Superb Fairy-wren that is flying around Jeff's drivers side mirror on his fourby. 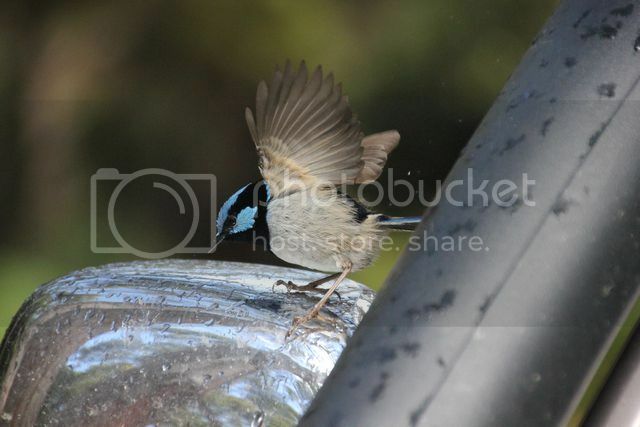 The wren is flying down to look at itself in the mirror then back up to land on top of it, each time sliding off the top of the mirror due to it being wet and slippery, it's pretty funny to watch it do this time after time after time as he goes sailing off the mirror. We leave camp for the short drive back up the beach, the campground is pretty empty and there's only a handfull of other people camped here at the moment....just the way we like it. 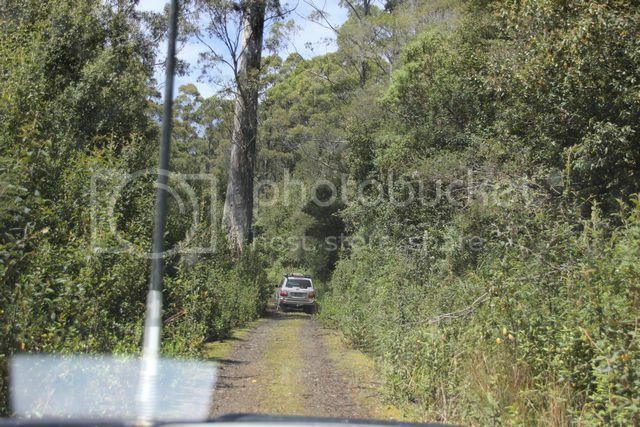 We head back onto Cloudy Bay Rd and a short distance away we turn right onto a smaller road that leads us onto a 4wd vehicle only track. This track takes us across the island, eventually bringing us out on Adventure Bay Rd just South of where the small convienence store is located here. The track itself was nothing hard to drive, a little bit muddy / boggy in places that could catch out a vehicle with limited ground clearance, but other then that a pretty straight forward drive from memory. We came across another vehicle travelling solo heading the same way we were heading that was catching up with us (we weren't in any rush), due to the muddy track we let them go first just incase they got bogged somewhere along the way, but they seemed to know what they were doing and were ok, not needing a hand anywhere at all. 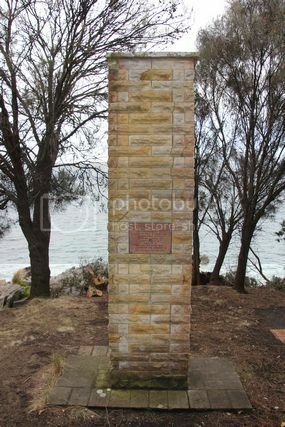 Rejoining the bitumin we turn left onto Adventure Bay Rd and soon pull up at a monument on the side of the road to see what it is about....it's the Furneaux and Cook Memorial. 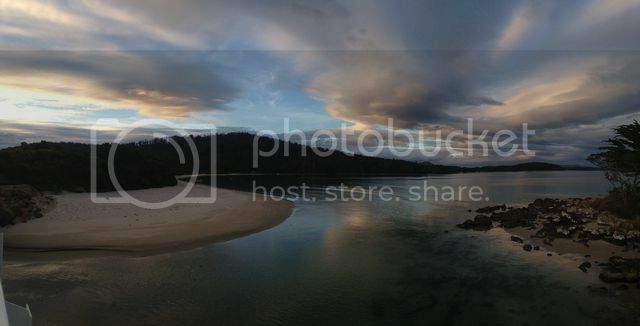 Originally this bay was named Storm Bay by Abel Tasman who sighted it first up in 1642 and tried to seek refugee in the bay from a storm, but he couldn't get into here due to a storm turning him away from it, thus naming it Storm bay. In 1773 Captain Furneaux re-named this bay Adventure Bay after his ship (HMS Adventure), he was a part of Captain Cooks second voyage into the Pacific but became seperated from him, so he anchored up here for 5 days and noted the good supply of water and food to be found here, it then became a popular stop over for future European explorers for restocking after that. 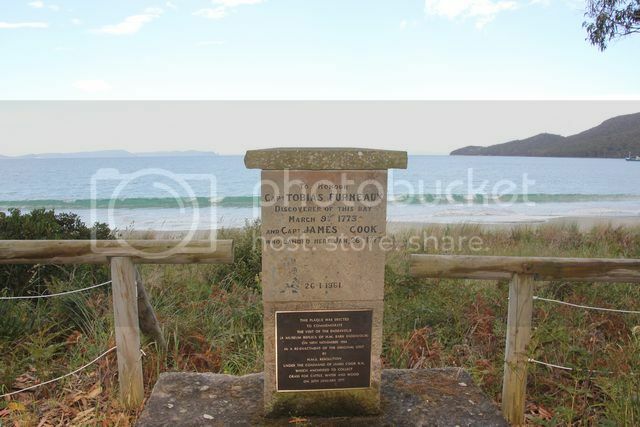 This memorial was erected in 1961 to commemorate the first landing on Bruny by a European being Lt. Tobias Furneaux, Captain of the Adventure and the subsequent landing by Capt James Cook in 1777. We had turned left onto Adventure Bay Rd but noticed the road continued around to the right for a short while, we decide to double back the few hundred metres past the intersection we came in on and see what's down the road there. There's quite a few houses located by the beach here, not sure how many are permanent residents houses and how many are just holiday homes though, the island isn't exactly busy considering the number of houses you see here. The road ends just around the corner from the monument, so we turn around and head back in the opposite direction. We stop off at the convienience store to grab a few things and i note the postcard showing a white kangaroo that is found on Bruny Island, something i'd seen pictures of previously but had no idea where they were actually found... (you can see i researched this holiday real well can't you...lol). I ask the guy behind the counter where it is these white kangaroos are located on the island, and he informs me it is only a few hundred metres down the road from where we are (back towards where we came from), and if we come back around here late in the afternoon we'd be a pretty good chance of seeing one. I thank the guy for this information and pay for our snacks and leave, knowing that we won't get back here this afternoon as we have a lot planned already for today. I did do a drive up and down the streets the guy told me about, but kangaroos tend to lay low during the day, so i knew it was unlikely that we'd see one, and i was right...we didn't. Across the road from the sculpture is a tennis court and kids playground, we stop in here so the kids can have a run around for a while and we have some morning tea here also. 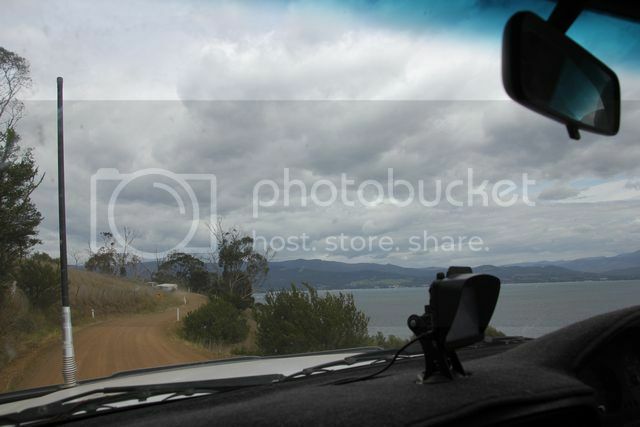 Back in the vehicles and following the main road as it winds it's way along beside the water we stop off at a lookout to admire the view over the bay. The water is CRYSTAL CLEAR down below us, something that we constantly get blown away by in the coming weeks as we travel around Tasmania....hence why i wrote that in capital letters like i did, the water everywhere is just super clear. 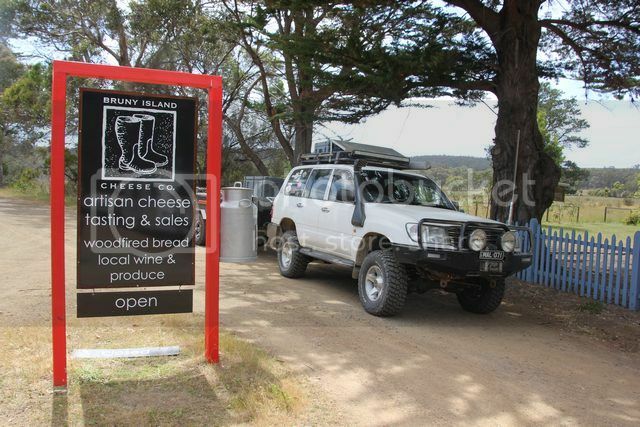 Next stop along the way is the Bruny Island Providore, this little shop is open daily from 10 a.m - 4 p.m, it sells fudges and truffles etc. 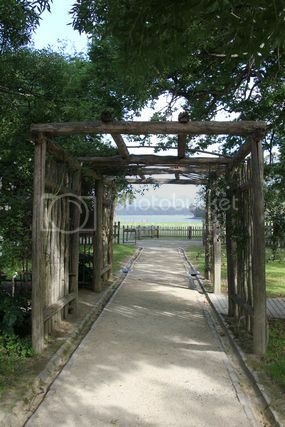 They do some free tastings so you can see what you like and don't like, there's also a 25 acre English garden to be explored here, but it is only available to private group booking of 20 or more people apparently so i have read. From the providore we drive back around to The Neck which is where we wanted to stop at yesterday but couldn't due to a lack of available parking space with the campers on the back, this time we have no problems getting a park there. We climb to the top of the lookout which involves walking up a bucketload of steps, it would certainly test out anyone with dodgey knees if they wanted to see the view from up here. 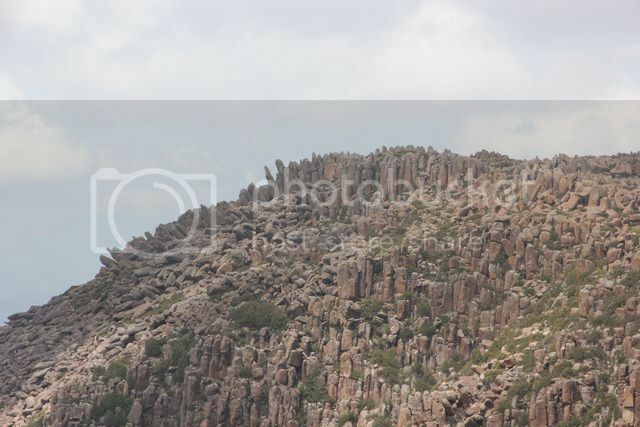 Climb to the top and you are well rewarded with a spectacular 360 degree view of The Neck and the surrounding waters either side of it. 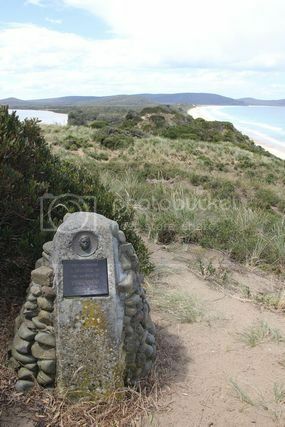 Also to be found at the top here, is a memorial to the indigenous Nuenonne people who lived on Lunnawannalonna (Bruny Island) before the European settlement. There's not a lot of room up the top should a large number of people be there at once, but we are lucky enough to have the place to ourselves for a short while before others arrive to take in the view themselves. 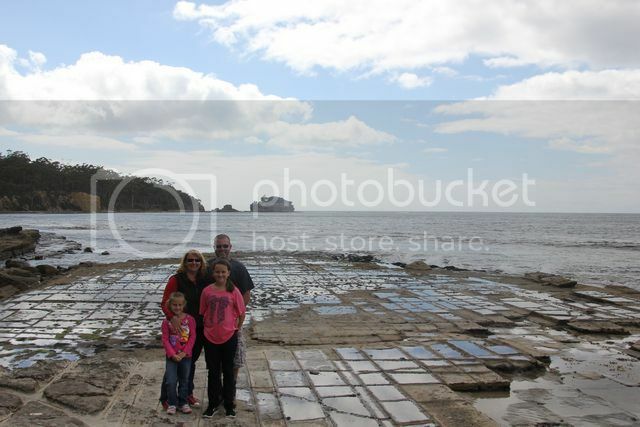 We take a few family pics here and then walk down onto the beach for a bit of a look around. 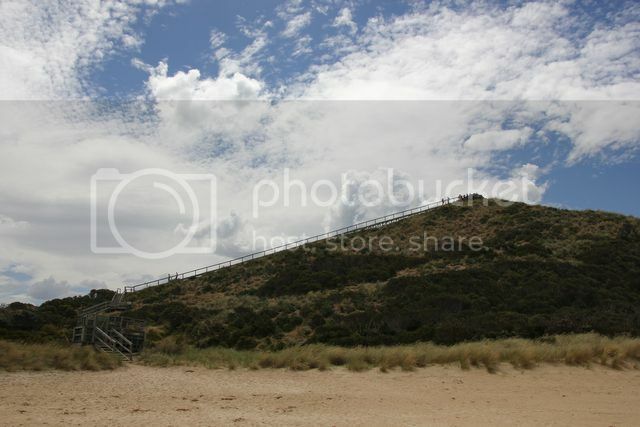 There's a boardwalk that leads out onto the beach from the lookout stairs over the fore dune, fairy penguins and short-tailed shearwaters call this dune home, and you can see the burrows in the dunes either side of the boardwalk. The Shearwaters return to their burrows at dusk and the penguins come in much later at night once it gets well and truely dark. With daylight saving keeping it light here till after 9.00 p.m, we were told by a local earlier the penguins likely wouldn't show up until about 11 p.m at night, way to late for keeping the young ones up to see them. 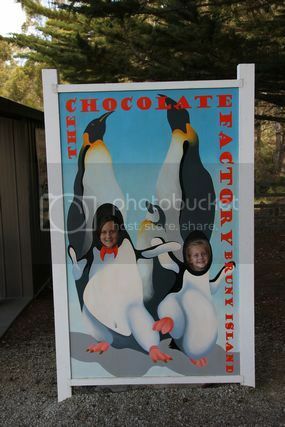 As much as we'd loved to have seen the penguins for ourselves and the for the kids to see them also, we reckon it would have been nearly 1 a.m in the morning by the time we see the penguins then drive all the way back to camp afterwards, so sadly we gave that idea the flick. 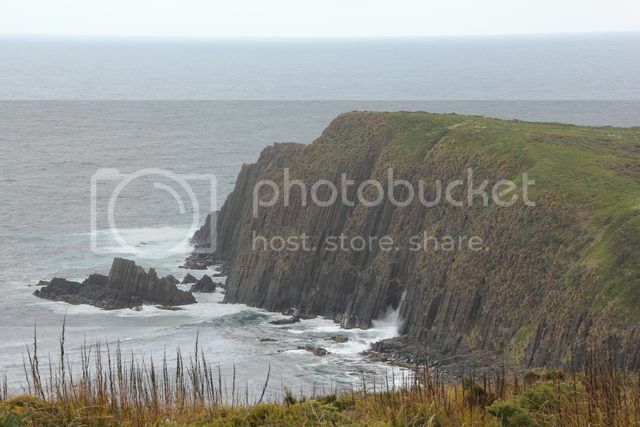 From here we jump back in the vehicles and head back South to go checkout the Cape Bruny Lighthouse located at the Southern tip of the island. Before going to far though, we detour into a campground just up the road a touch to see what it is like. 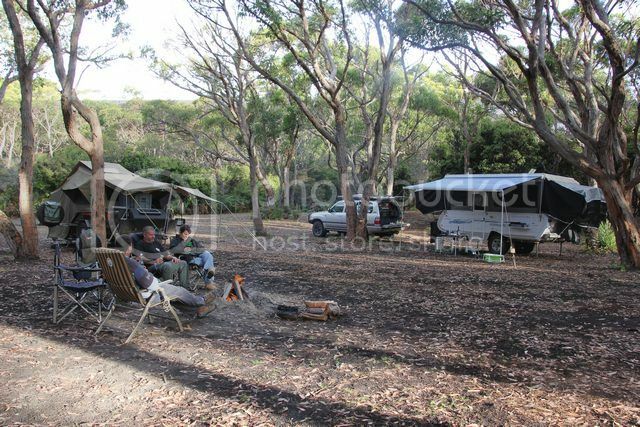 The campground is a touch busy and seems to be popular with 2wd vehicle campers, we don't really rate it that highly compared to where we are currently staying, and are glad we choose to camp where we have done so. The place is basically a big dirt bowl, it's fairly flat and shaded by the trees that surround the place, but being how busy it is here and a complete lack of grass anywhere to be seen, it's generally uninviting....if you had to you could camp here, but there's nicer places on the island then here in our opinion. We don't hop out of our vehicles here at all, just do a slow drive through then exit back to the main road and head off for the lighthouse. 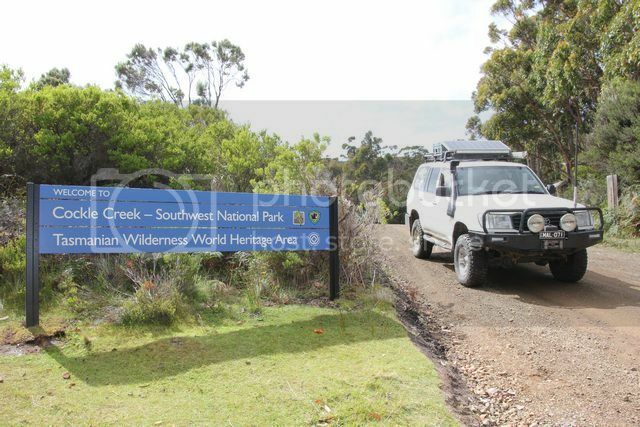 The road out to the lighthouse is mainly gravel, there's some very small corrugations we encounter on it in places, but it's in pretty good condition really and see's it's fair share of 2wd vehicles traversing it. On the way to the lighthouse there's a few places to pull up and check out the views along the way, we do this and take a few pics of the lighthouse from a distance aswell. We arrive at the lighthouse and getting out of our vehicles we realise we haven't actually stopped for lunch today (it's about 4 p.m by now), we make a few quick sangas and then start on the short walk up to the lighthouse. The first thing we notice here beside the spectacular views, is just how many rabbits live here....without word of a lie we'd see 20 rabbits atleast on the surrounding lawns, they were everywhere we looked. 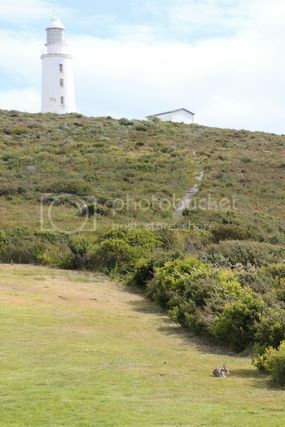 It's not a long walk to get to the lighthouse but it is uphill all the way, there's a well maintained pathway you take, and the before you know it you've reached the lighthouse. 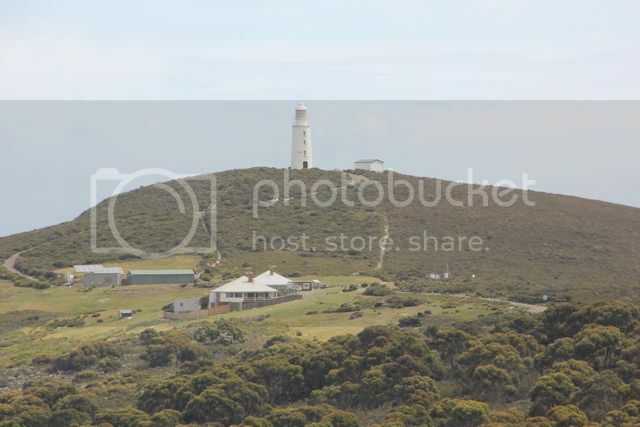 The Cape Bruny lighthouse is is the second oldest existing lighthouse tower in Australia, it was the longest continuously manned lighthouse being manned for 158 years, and was only decommissioned in August of 1996. 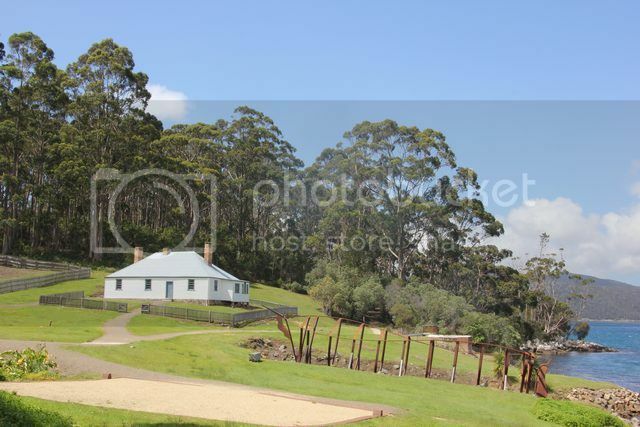 It was built with free convict labour using locally quarried stone and originally ran on whale oil . The views from the top of the hill at the lighthouse are spectacular, if you look back towards Cloudy Bay where we are camped it's quite a pretty serene sort of a picture, but if you look the other way out over the ocean below the lighthouse it's jagged towering rock cliffs being pounded by the ocean swells to be seen....the scenes surrounding us are chalk and cheese in differances. 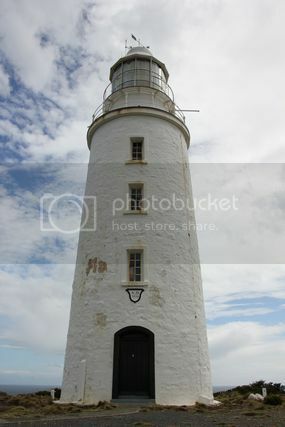 We spend some time up at the lighthouse looking around before making our way back down to the carpark area, one of the old cottages located here is now a museum, so we spend some time looking around inside of it. There's a few old cottages here besides the museum, one of them can actually be booked for accomodation it appears. 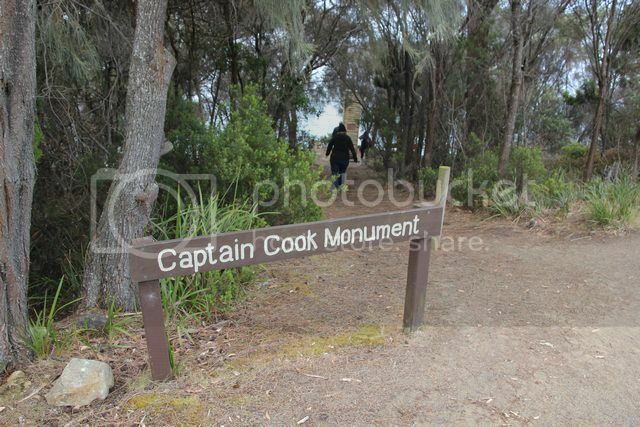 We leave the lighthouse and head back the way we came from (not that you have a choice in the matter), but instead of taking our turn off back towards camp we continue straight on to have a look at another campground which was called Jetty Beach. This campground seemed to be a touch nicer then the previous one we checked out at The Neck, but the ground was nowhere near as level and had a bit of a slope to it, there only appeared to be the one family set up camping here, so it wasn't busy at all. We do the drive around then spot a track leading down to the waters edge, we aren't sure if we are allowed to drive along the beach or not, but there's no signs saying we can't and we see tyre tracks in the sand already, so we drive out onto the beach and let the kids have a run around here for a while. Before long it's time to head back to camp so we do this, we spot another echidna on the side of the road on the run back, but other then that it's a straight forward drive back to camp. 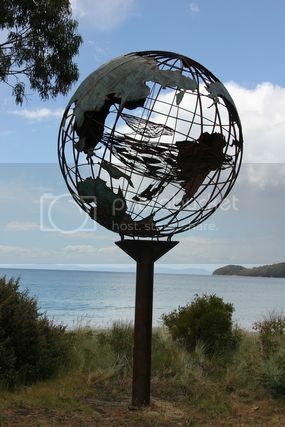 It's time for us to leave Bruny Island today, it's been a nice place to visit and would be worth spending a few extra days here if you have the time up your sleeve to do so. The weather is nice today, so we get to pack up the campers dry which is a bonus after yesterday morning with them being wet from the showers that were about. 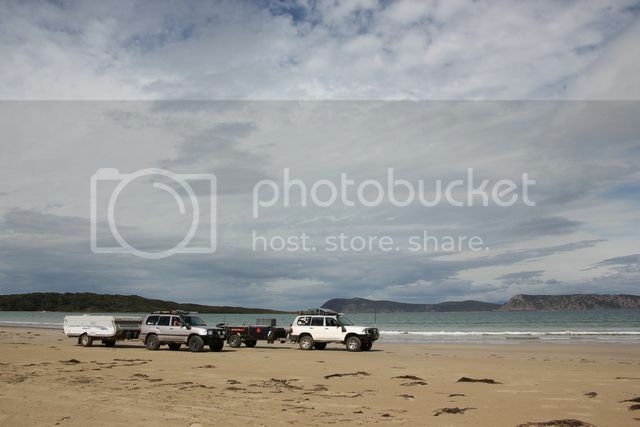 Brekky had and campers packed up and hooked up, we drive down onto the beach ready for the run North. 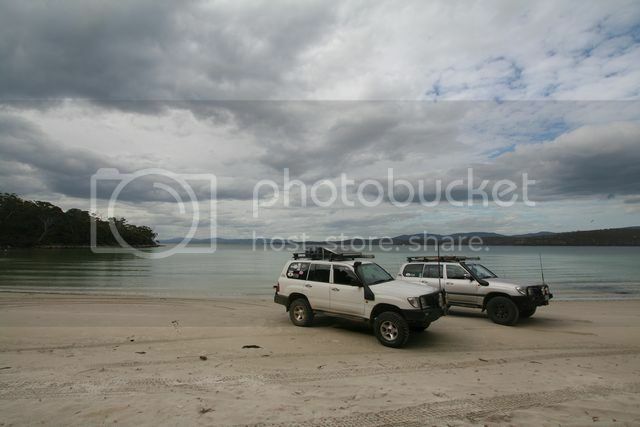 We stop off about halfway along the beach to grab a few final pics of the vehicles on the beach, then we head off again and say goodbye to Cloudy Bay once and for all, exiting back up onto Cloudy Bay Rd. 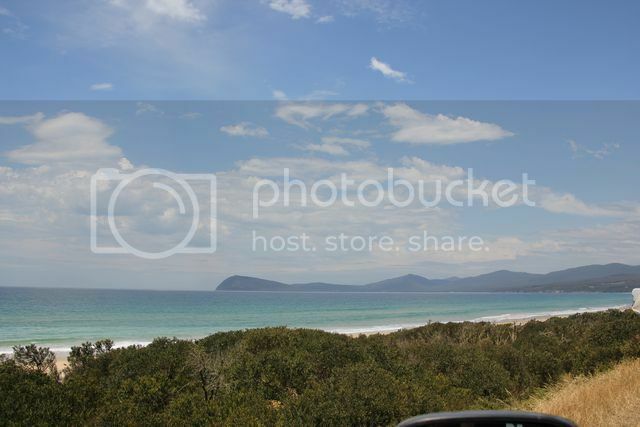 We do the drive to the North part of the island without stopping off anywhere, we have a bit of time up our sleeves before the ferry is next due to arrive, so we decide we'll do a bit of a scenic drive around the Northern end of Bruny Island to see what's up there to look at. We turn off the main rd and head for Dennes Point, the road started out as bitumin but has turned back to a good gravel road once again, though it is a touch slippery to drive on in places, so watch your speed on the corners. The road around the Eastern side of the Northern end is really windy, it takes us a lot longer to reach Dennes Point then we expected it to, we start to get a touch concerned that maybe we didn't allow enough time to get back to make the next ferry departure time. With no time to spare we just do a big loop drive around the Northen end of the island, we don't really stop anywhere along the way (a very quick stop for the odd photo), we just enjoy the scenery and before long we've done the complete loop that brings us back to the main road we had turned off of originally. Turning right back onto the main road it's a short drive from here to where we need to catch the ferry, so we're pretty confident we'll make it in time now. We crest the top of the big hill you climb when you first land on the island, and we see the ferry making it's way across the bay....perfect timing. We join the small queue that has formed for the trip back to the mainland, and with the few minutes with have to spare we grab our rubbish from our rubbish bags carriers and put it in the small bins that are located on the side of the road here. It was a tight squeeze shoving it in, but there's a few bins here so there's still room for other peoples rubbish also. Unlike the trip over where the ferry was packed solid, for the trip back the ferry is only about a third full at best this time round. 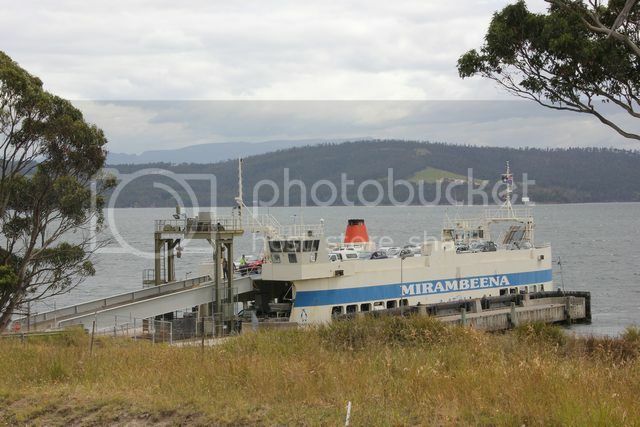 It doesn't take long to get us all onboard, and we are soon saying goodbye Bruny Island as the ferry departs the terminal. 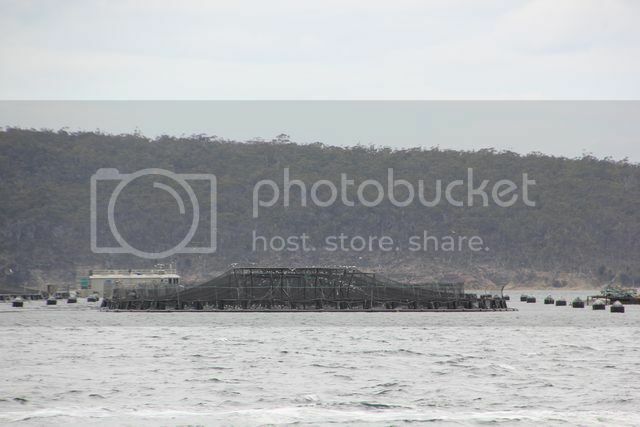 As you cross the bay you'll notice a Salmon farm located not far off of Bruny Island, fish farming is a pretty big industry in Tasmania, and the scale of some of the facilities can get pretty big as we'll find out later on in our trip. The ferry docks back at Kettering and we quickly unload, we travel back to the Channel Highway a few hundred metres up the road and make a lefthand turn onto it. Not stopping we drive straight out of town heading South to take the scenic route to Huonville. It's a much shorter distance and quicker to go North back to the main highway and down to Huonville from there, but we're in no hurry so choose to take this longer route instead. Less then 10klms down the highway we find ourselves turning right onto Devlyns Road. Granvewe Cheeses is located not far up this road, so we stop in for a tasting of their sheeps milk cheeses, smoked mutton sausage and Vanilla Whey Liqueur. It's now morning tea time so we decide we may aswell order something to have here on their deck that over looks the water off in the distance. We try out their Latte's made with sheeps milk, aswell as order a few bowls of ice-creams made from the same also, just in the interest of product research i swear....don't believe me hey....would you believe we ordered it just for the kids then?...lol. 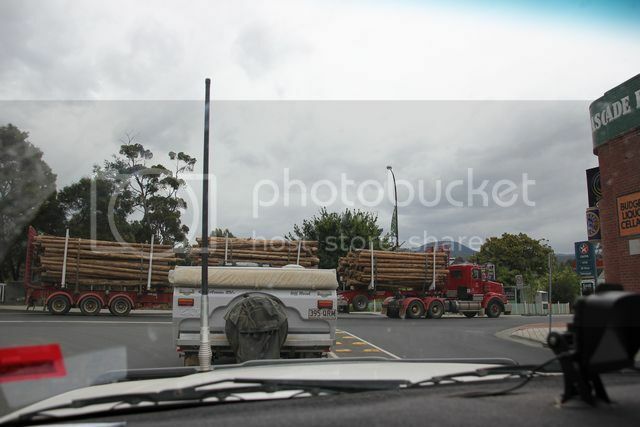 Entering Huonville we reach a T intersection which is the Huon Highway, waiting to turn onto that highway we see a pretty common sight around these parts, logging trucks form part of another industry that Tasmania is well known for. We turn right and drive into the centre of town to get some fuel and do some more grocery shopping also, it'll be a few days before we visit another decent sized town again and there's a good sized grocery store here so we make use of it. 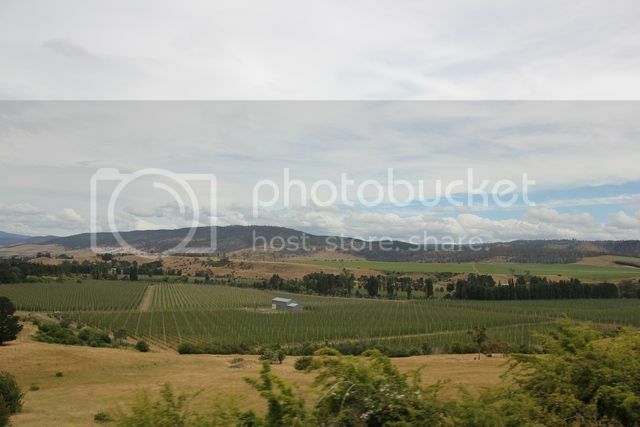 We head South out of Huonville towards Geeveston, the highway follows along side the Huon River, and about 7 or 8 klms out of Huonville you'll pass through the town of Franklin. 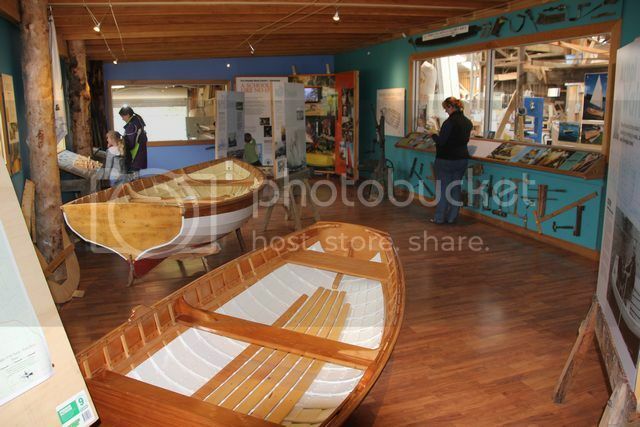 Located here in Franklin is the Wooden Boat Centre, it is both a tourist attraction aswell as a school for learning the art of wooden boat building. 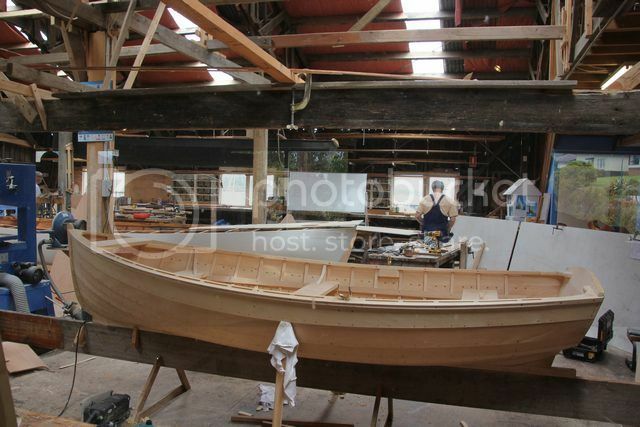 The centre runs Australia's only fully nationally-accredited Certificate course in Wooden Boat Building, here students will build a full sized sea going vessel as part of their course. 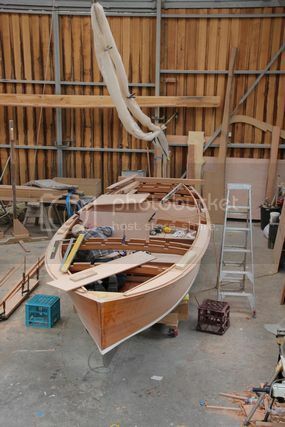 Being i'm a Carpenter i'm pretty interested in looking at most things made from timber, the craftmanship on display here is mindblowing, and if one day i win lotto and have plenty of spare time on my hands, i'd love to come down here and enrol to do this course and learn the art of wooden boat building. 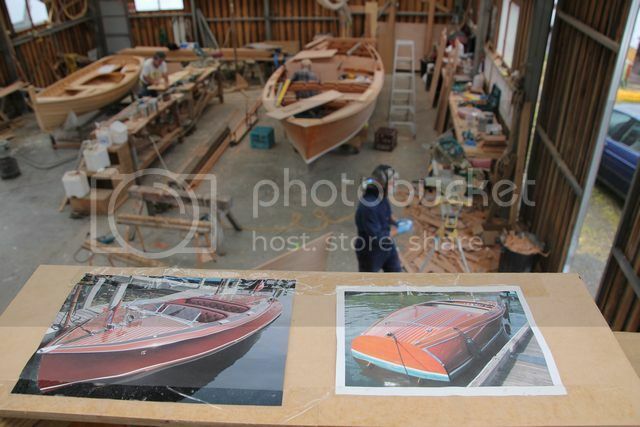 The centre is open weekdays from 9.30 a.m - 4.30 p.m. You pay an entrance fee on arrival and will be lead in a small group through the premises on a guided tour, you get to see all the facets of the boat building process and get a comprehensive overview of how it's all done. Fine workmanship like what is on display here is a dieing art in most trades, so it's nice to see something like this still being taught today as an actual trade. Tour finished we head back out to the vehicles, but we need to wait a minute for the rain to stop before doing so. I hadn't mentioned it previously but on arrival in Franklin it had started to rain quite heavily, we actually needed to run for cover from our vehicles on arrival to get out of it. We make a quick late lunch inbetween rain showers and then jump back in the vehicles to head off once again. 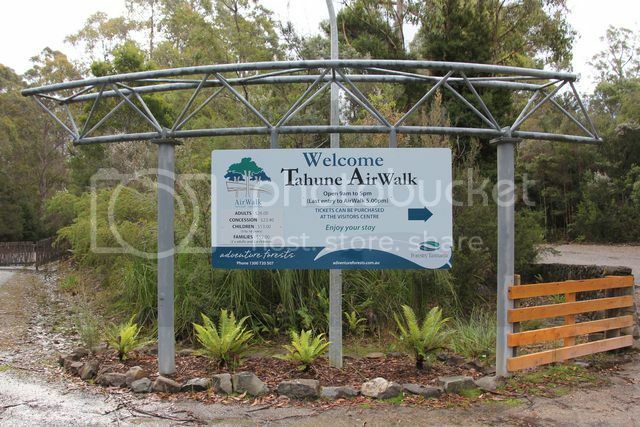 Tonights destination is going to be the Tahune Airwalk, it's located about 30 klms West of Geeveston along Arve Rd. Tahune Airwalk has free camping available if you purchase an Airwalk ticket, your first nights camping is free and after that you get charged to stay there any longer. The AirWalk is open seven days a week, November to March it's open from 9am-5pm and April to October it's open from 10am-4pm. The road to Tahune from Geeveston is pretty windy, it'll take about half an hour to do the 28 klm drive to get there. We arrive at reception a couple of minutes before 5 p.m, the staff are closing up shop and although it's going home time for them, they are quite helpful and direct us to set up camp for the night in the Over Flow carpark area, as our camper trailers are to big to fit in the designated camp spots, and to come see them tomorrow morning when they reopen to pay for our airwalk tickets. 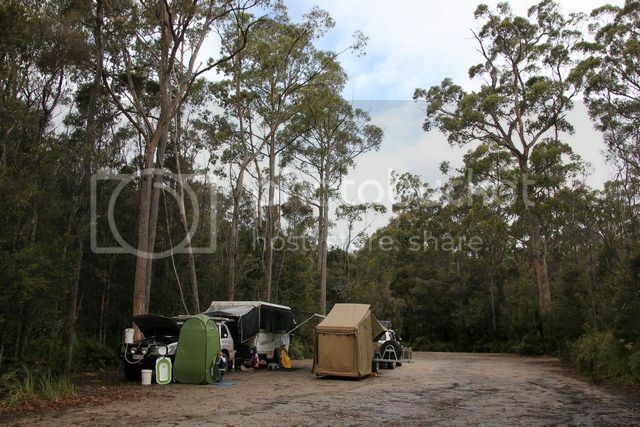 The campsites proper only fit a tent or something like a small motorhome in them, anyone with a camper trailer or caravan etc, will not fit in those sites and needs to set up in the carpark area. We set up camp and have the carpark area to ourselves, we haven't had a shower for a few nights now and spot a tap on the side of one of the accomodation buildings located nearby, so we take the opportunity to set up the shower tent and have a nice hot shower to clean ourselves up. The rain falls on and off for the rest of the afternoon and evening, we managed a short walk down to the river before it got dark for a quick look around and to let the kids run around abit, but after that it was cook dinner and then off to bed fairly earlyish to keep out of the rain. We had a bit of a sleep in this morning as the airwalk doesn't open until 9.00 a.m, we are camped in the carpark so it's not real far to go this morning...lol. It rained on and off last night and we had the diesel heater running in the camper trailer for the first time on our trip, the heater has helped keep the canvas pretty dry with the rain that was about, so we get to pack the camper up dry. Brekky had we make our way to reception to pay for the airwalk, it costs us $54 for our family to do the walk. From reception it's a shortish walk to where the airwalk itself starts, but be aware it's a fair amount of uphill to get to it, and there's 112 steps to negotiate along the way also. 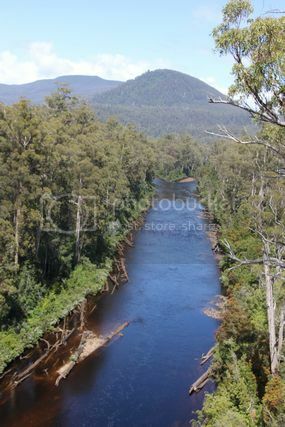 From reception the walk starts with you crossing over the Huon River on a road bridge, we stop on the bridge and take a few pics looking upstream. 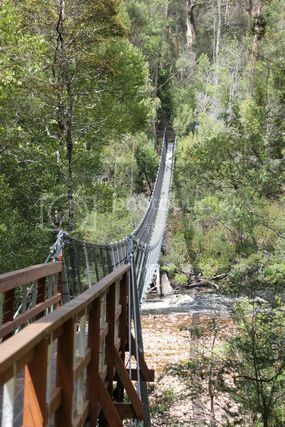 Pics taken we cross the bridge and pass through the day use picnic area to start our uphill and stair riddled walk to the airwalk proper. 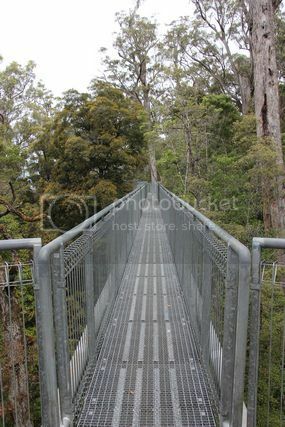 The airwalk itself is a 620 mtr long metal walkway suspended about 20 - 30 mtrs in the air in the forests tree canopy. 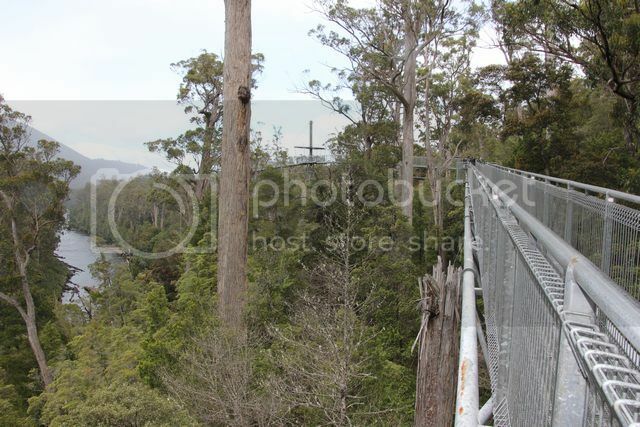 The last section of the walkway has a big cantilevered section that sits almost 50 mtrs above the ground, and gives a great view of the confluence of the Huon and Picton rivers. 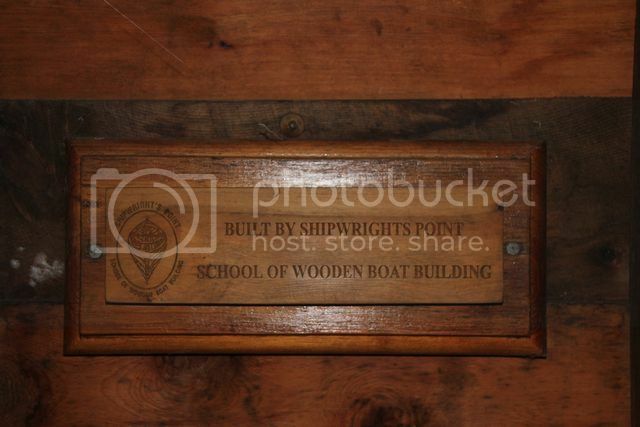 Right at the start of the walkway is a beautiful hut made by the Wooden Boat Building School we had visited yesterday, we stop and check out their handy work once again and i am impressed with the detail that has gone into the building. 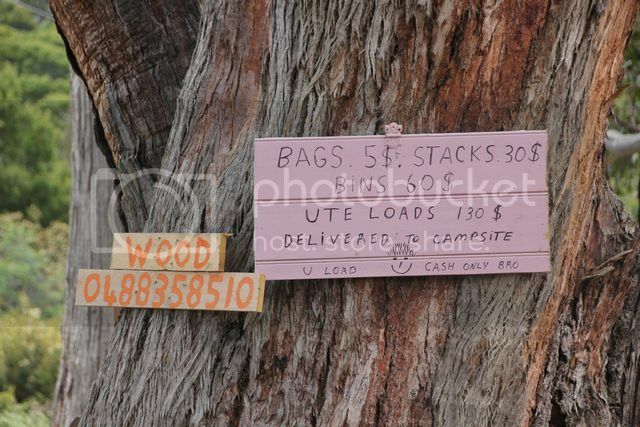 We start the walk and soon stop at a cut off tree stump that is covered in coins, it's called The Wishing Tree. 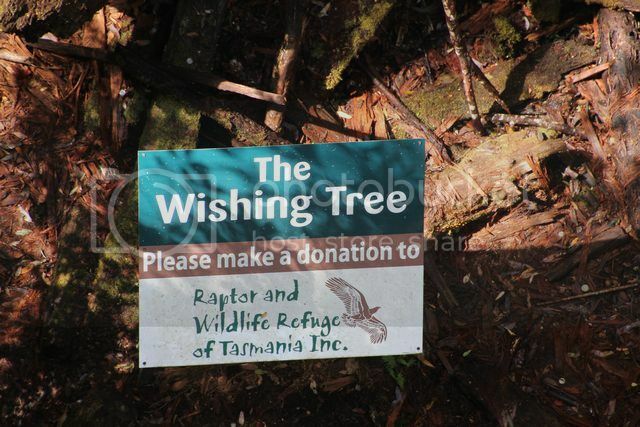 People try and throw their donation of coins from the walkway and land it onto the tree stump below, with all money donated going to help support The Raptor and Wildlife Refuge of Tasmania Inc. I give it a shot with a gold coin and fail miserably, i didn't even hit the top of the tree...lol...but you can see where others which a much better aim then myself have succeeded, which rubs salt into the wound...lol. We push on along the walkway admiring the view as we go and stopping to take the odd pic or two also, our youngest daughter isn't fazed by the height of the walkway, but the eldest is starting to freak out a touch. We reach the big cantilevered section at the end of the walkway and the eldest daughter refuses to walk out onto it, i eventually persude her to go out onto it and we grab a few more pics from there before then heading off to do another walk. 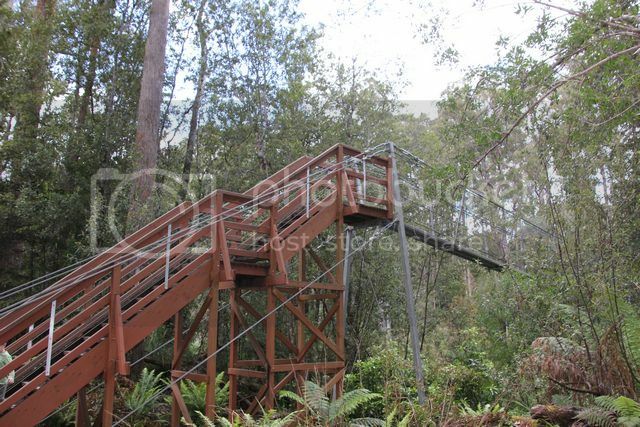 With the airwalk complete our next walk we do is The Swinging Bridges walk, it's a loop track and takes us about an hour to complete this with the kids, but i'm sure others do it in a much quicker time frame then that. 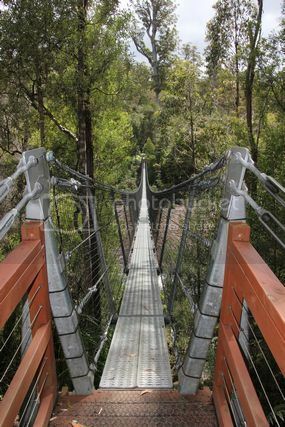 The walk is pretty easy going and winds it's way through the forest before eventually reaching the first of 2 suspension bridges that you cross over. 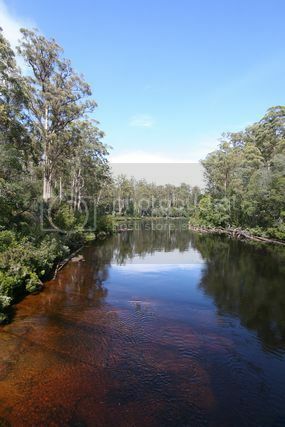 The first bridge crosses the Huon River and spans about 100 mtrs long over the water below. 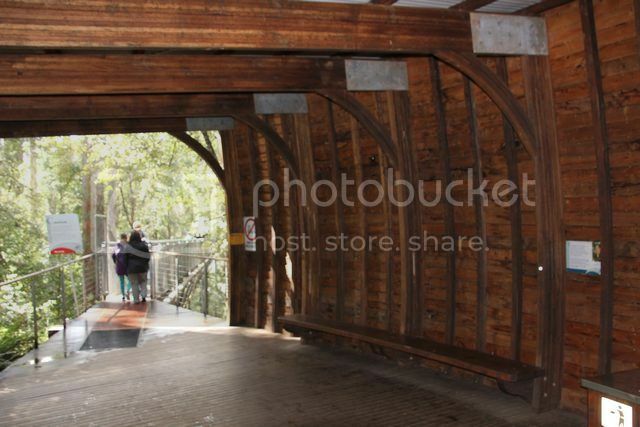 If you were the type of person that likes to scare your kids a little, you could wait until they are in the middle of it and start bouncing up and down on the bridge....not that i'd ever do something like that myself...lol. 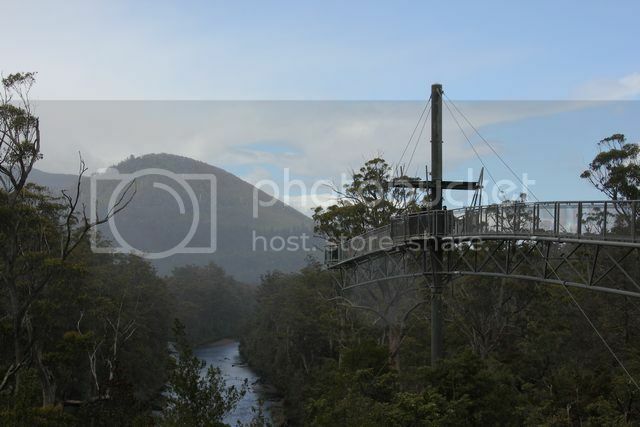 A touch further on is the second suspension bridge that crosses over The Picton River, this bridge is not quite as long as the previous one and spans about 60 mtrs over the water below. HOPEFULLY WE'RE SAFE WITH THAT WEIGHT LIMIT? 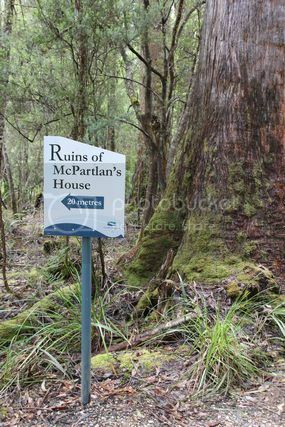 Not far from the second suspension bridge is a track running off to the ruins of McPartlans House. 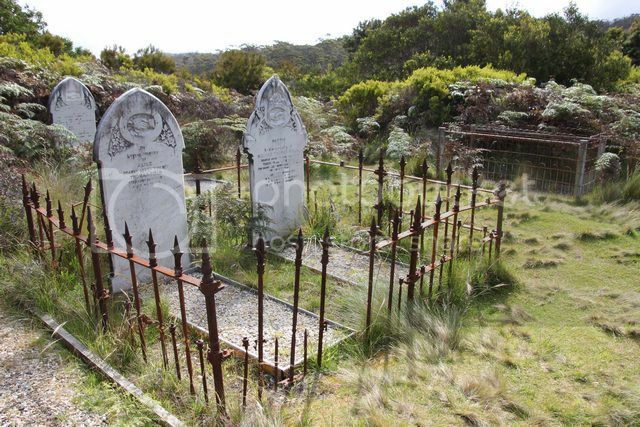 Police Constable Francis McPartlan who used to occupy this residence, was "a former Irish convict whose duty it was to walk the trail to the remote Arthur Range to check timber licenses". 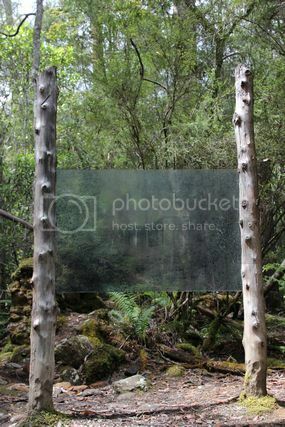 There's not much in the way of ruins to look at here, but they have erected a piece of glass (or might have been plastic, i didn't actually touch it to see) between 2 tree stumps with an etching of what the hut used to look like that McPartlan used to live in....it's really well done i thought. 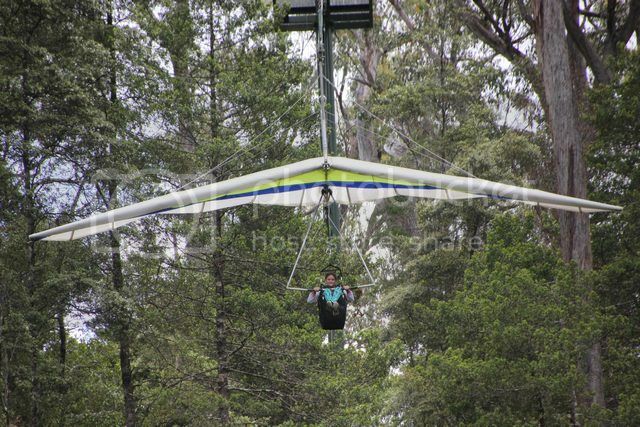 From McPartlans house it's not to much longer and we are back at reception, we decide it's time for some fun and buy a few tickets to have a ride on the hang glider they have here at Tahune. It costs $15 for an adult and $13.50 for a child to do it, and you need to purchase tickets at reception before going down to the glider. I buy a ticket (aswell as Jeff and Sara also) but my eldest daughter chickens out at the last minute. 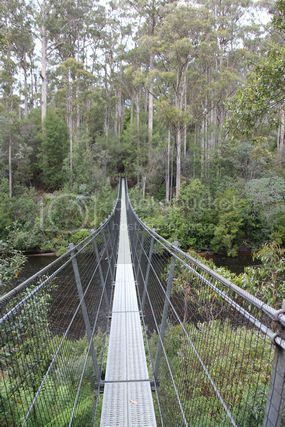 It's a shortish walk from reception to where the hang glider runs from, it's a cable run sort of operation and doesn't require you to actually fly the glider, it's just a short fun ride over the Huon River from a height of about 50 mtrs. Sara goes first in our group followed by Jeff, my eldest daughter has now suddenly decided she'd like to have a go also, so the staff member running the glider says that's fine and just go back to reception after we've finished and pay for it then, which is what we did. I was the last person in our group to have a go on the glider, and to be honest whilst it was a bit of fun to do, i'm not sure it's $15 worth of fun. We grab our bags and start to walk back to our camper trailers so we can hit the road for our next destination, the staff member running the glider is heading back that way also and asks if the kids want a lift back with him in the buggy, which they jump at the chance to do....so does big kid Jeff also the lazy plick...lol. Back at the campers we make some lunch and then hit the road once again, we need to head back to Geeveston on the same 28 klms of road that we came into Tahune on yesterday afternoon, and once back at the highway we turn right and continue heading South towards tonights destination which is Cockle Creek. Along the way to Cockle Creek we somehow found out that the town of Southport (which we'll pass close by) has the Southern most pub in Australia located in it, so a quick detour is called for to check out such an iconic pub as this one is we say. 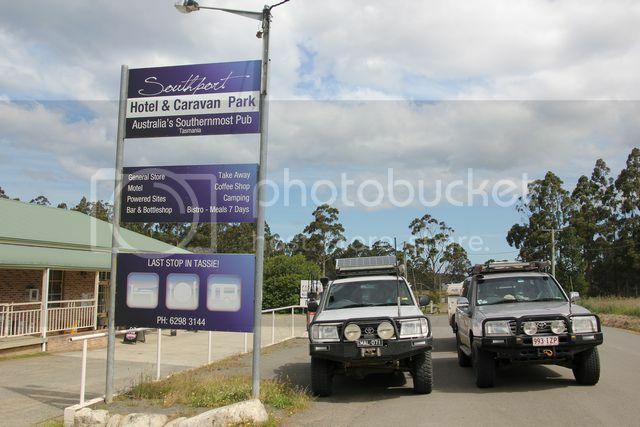 It's not a lot of klms out of our way off our intended route and we soon pull up in the carpark of the Southport Hotel. It doesn't have the same iconic look about it your Birdsville Hotel or Lions Den Hotel has to it (it's just a normal bland face brick hotel actually), but it is what it is so we make our way inside and grab a refreshing beverage each and a stubbie cooler to mark the occassion. Australia is playing in the cricket on the telly, so we watch a bit of that whilst having our drinks, before then setting off towards Cockle Creek once again. 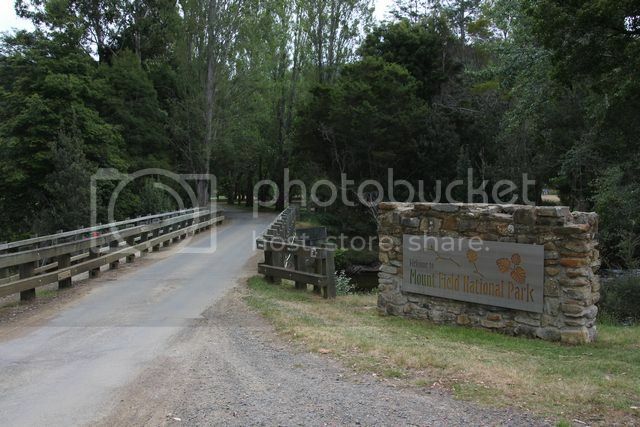 Eventually the bitumin road runs out, and the last section of road into Cockle Creek is a dirt road. We'd been warned by the barmaid that the road hasn't been graded in over a year (it might have been 2 years actually) and it's badly potholed, this warning was most certainly accurate. 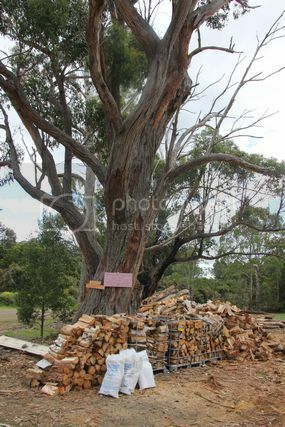 As the bitumin ended we passed by a house selling firewood out the front of it, we decided about a kilomter down the road further that we should have grabbed some firewood for tonight, so pull up and turn around to head back and grab some. Turning around is a bit of a tight affair on the road here, and Jeff manages to break his drivers side rear light of his Cruiser as he jack knifes the camper trying to turn around, he's not happy which is understandable, but what's done is done now. Seeing how tight it was for Jeff to turn around i decide to travel a touch further down the road before finding a better spot to turn around in, we both meet back down the road at the firewood sellers house and grab a few bags and tie them down on the back of my camper. We continue on to Cockle Creek and the road is pretty ordinary as we warned about, eventually we reach our detination and notice the area is absolutely chock a block with other campers in the various campgrounds we are considering camping in (there's quite a few different camp areas you can stay at along the edge of the road here, just keep driving till you find a suitable location to set up in). Just before we reach the bridge that crosses Cockle Creek itself, we start to think there is nowhere for us to set up in other then some of the muddy spots we have already bypassed. Sara is out of her vehicle running in behind some small dunes trying to find a vacant spot for us, when suddenly a lady already set up here calls out and tells us of a spot hidden down the back of where she is camped, so we drive in there and find the perfect location for a few nights stop over. It's a tight squeeze to manouvere both our trailers into position here but we eventually get it sorted, we set the campers up and grab a few drinks from the fridges, before heading down to the beach for a look around. As we head over to the beach (it's only about 100mtrs away), we pass through some of the chock a block camp areas we were seeing from the road and notice something is strange, there's something missing here....there's not a single person to be seen anywhere, something we hadn't noticed earlier. 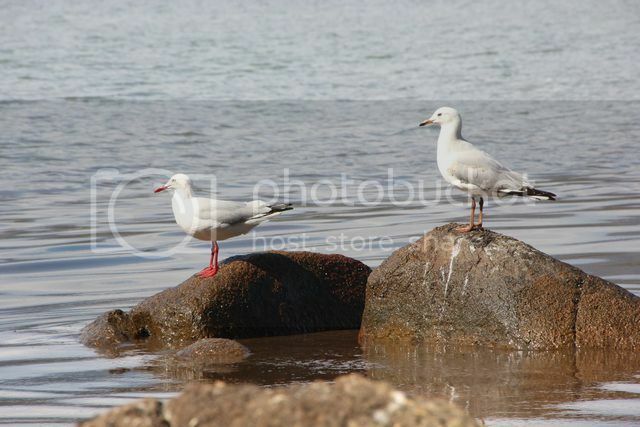 It's only a week or so before Xmas now, and all the locals have already staked the prime positions (well just about all the positions actually) for their Xmas / Newyears holidays. There's so many caravans already set up down here and stock piles of firewood at their campsites, that it leaves very little if not any vacant spots for anyone else passing through the area...so good luck finding a spot if you plan to visit the area yourself at this time of year. We walk over to the deserted beach looking out over Recherche Bay and take a few pics of the place, before making our way to the new road bridge that spans over Cockle Creek and taking a few pics from there aswell. We head back to camp eventually and get a fire going, before then making some dinner and spending the rest of the evening sitting around the fire chilling, before then going to bed. It rained on and off during the night but there was nothing torrential, just some showers. This morning there is still some very light showers about the place, but not much at all in them. 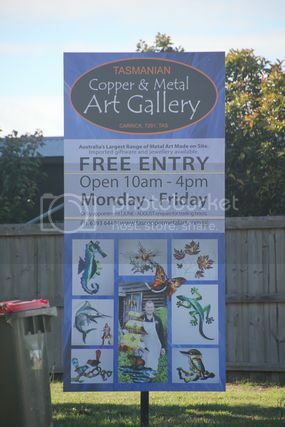 We have some brekky and decide on a plan of action for the day, our first port of call will be the whale sculpture just a very short distance further South along the road from camp, and then after that we'll head North to the Newdegate Caves. I say we'll head North from the sculpture, but you don't really have any say in the matter anyhow. 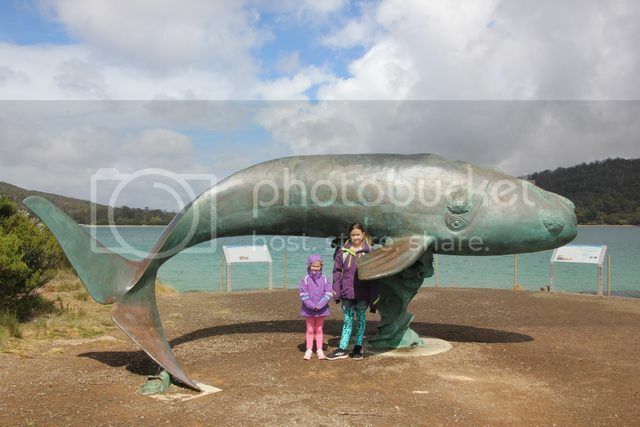 When you reach the car park area for the whale sculpture, you've actually reached the most Southern point you can drive a vehicle on a road in Australia, it's quite literally the End of the Road, and from here you have no choice but to head North again. There's a beaut walk you can do from the whale sculpture that takes you to Fishers Point in South Bay which used to be an old whaling station, and the walk apparently has views of mountain peaks and a great view of the Southern Ocean aswell, but it takes 4 hrs return and we won't be doing that with little kids in tow. 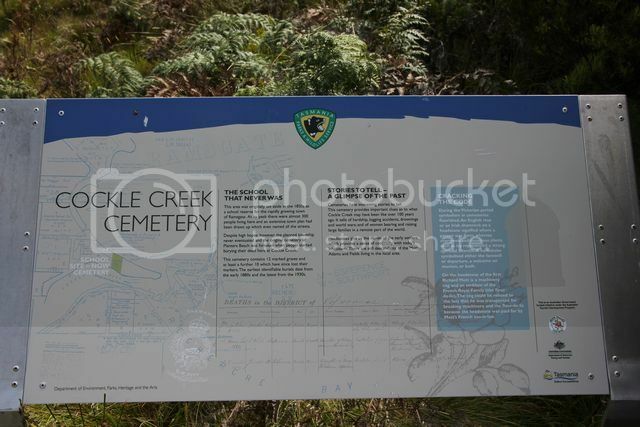 We spend a bit of time reading the various info baords at the whale sculpture and speak to guy trying his luck with a fishing rod, before jumping in our vehicles and heading North towards the Newdegate Caves.... as we leave here i quickly stop to take a pic at another Cockle Creek sign. 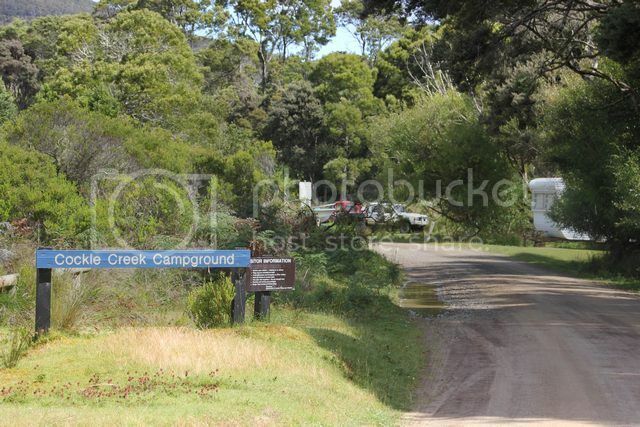 COCKLE CREEK / THE END OF THE ROAD....note all the various camp areas located around here. Fires are allowed in all the spots North of Cockle Creek, but not the 2 in the green shaded areas which are on the Southern side of the creek / bridge. 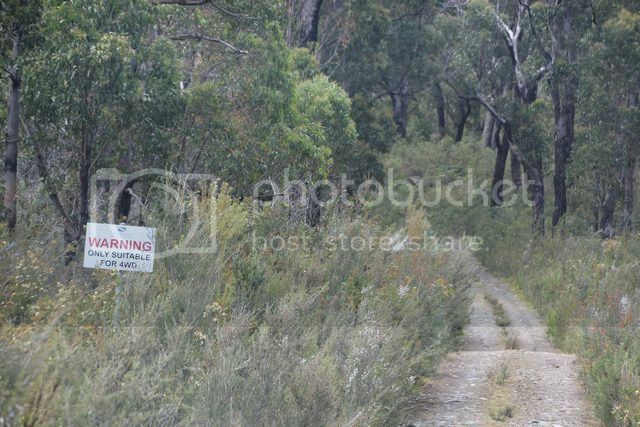 We soon reach our turn off for the Hastings Caves State Reserve and turn left onto a well-maintained gravel road, that takes us to the Visitor Centre and the Thermal Pools that are located here aswell. Newdegate Cave is 5km further along this road from the vistor centre, you buy your cave tickets here before driving the further 5klms to the cave carpark, and from there it's another five minutes walk to the cave entrance proper. We stop at the vistor centre and buy our tickets and look around the souvenier shop, as we pay the $60 it costs us for family pass (the use of the thermal pool is included in the entrance cost) we notice the next tour time isn't that far away, so we need to hurry back to the vehicles if we are to get there in time. 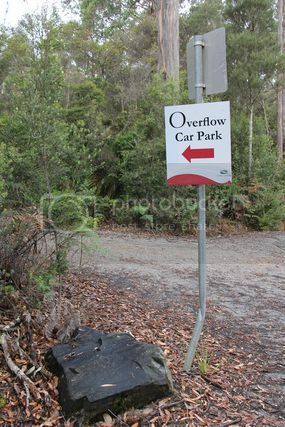 We quickly scoot along the 5 klms of dirt road to the car park and do the dash up the walking track to the cave entrance, arriving just in time before the tour begins. 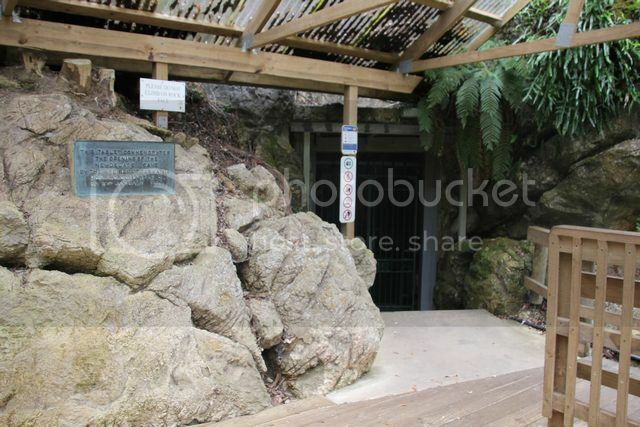 There's a large steel gate you enter through before you quickly descend down a heap of stairs into the cave, make sure you duck your head on the way down the stairs though, there's not a lot of head room on the way down. 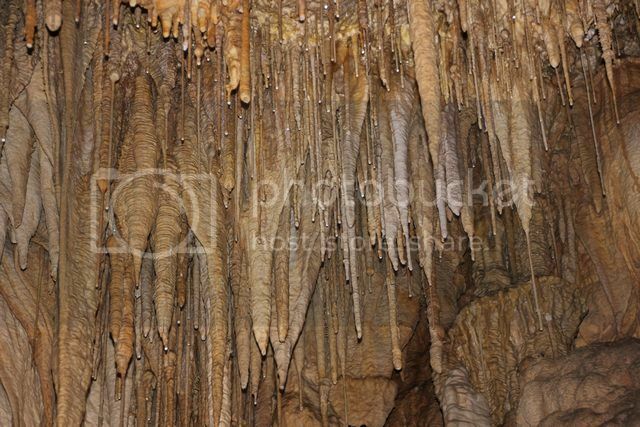 We do the guided tour and get the usual run down on the differance between Stalactites and Stalagmites etc, and we also learn that Newdegate Cave was named after Sir Francis Newdegate who was the Governor of Tasmania from 1917-1920. 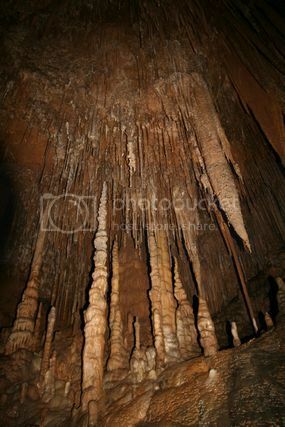 Aswell as those facts we learn that the cave is the largest dolomite cave open to tourists in Australia, which is different to the normal limestone caves people would normally visit. The kids enjoy their first cave tour and before long the tour is done and we head back out to where our vehicles are located. Back at the vehicles we decide that seeing it's already lunch time we'll head back to Southport and find a spot by the water to make some lunch and let the kids run around on a beach somewhere. We head into town and bypass the pub we stopped at yesterday for a refreshing beverage. At the end of the road we turn right and start looking for somewhere to have lunch. We follow this road all the way to it's end but don't find anywhere suitable to stop at, so we turn around and come back to the intersection we previously turned at, and continue to follow that road in the opposite direction. Not far down the road in this direction we find a spot that allows us to pull up at practically on the beach itself, we tell the kids to go play on the beach whilst we make some lunch, so they run off to go have some fun. Not more then a few minutes later the kids are back at the vehicles and hopping inside of them....what's the matter i say to them?....it's to cold and windy out there they say...geez, so much for Summer at the beach in Tassie...lol. Unbloody believable i think to myself, as i watch a lady and 4 young kids who are decked out in the their togs and carrying boogie boards walk towards the water ready for a day out at the beach...and here we are rugged up in practically snow gear, it really was a chalk and cheese moment...lol. Jeff sees what i am talking about and starts laughing himself over the uhf, i guess it's just a normal balmy Summers day for the locals down here. We head back towards camp and stop off at the same firewood sellers place we stopped off at yesterday to grab a few more bags of firewood. At $5 a bag i have no idea how the guy makes a profit selling it, but if he wants to collect it, cut it and split it for us for that price, we'd be mad not to buy it from him i reckon. Back at camp the wind is not like it was at Southport and it's much warmer, Jeff and myself decide to grab a drink from the fridges and go for a walk to explore where we are staying better. 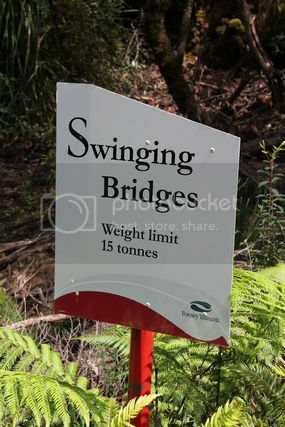 We head South across the bridge over Cockle Creek and spot a sign i hadn't seen earlier, i grab a pic of it and think it'll make a great accompaniment to my other pic at the most Northern point of Australia at Cape York. From here we walk over towards the water and spot a large flywheel that used to run all the machinery of a timber mill that operated at this very location back in the 1940's. 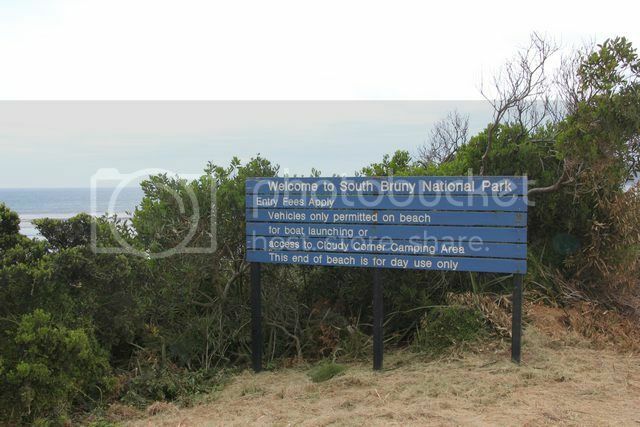 There's more signboards located here that explain the history of the mill, we read them before making our way out onto the beach and then start heading back towards camp to look for a nearby cemetery. 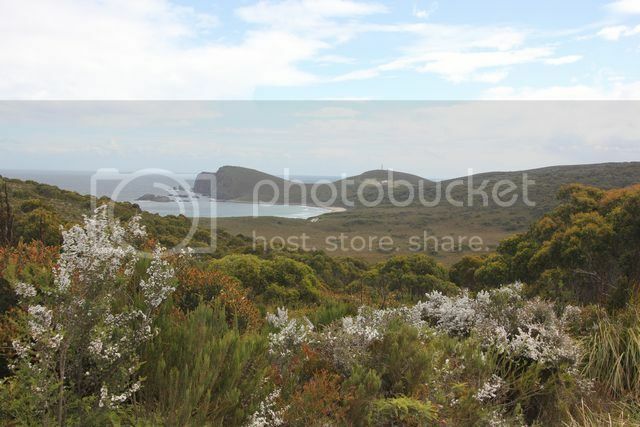 The weather is much nicer now then it was earlier, the view over Recherche Bay is pretty nice, and it's not hard to see why a tiny cottage located here was built only metres away from the water line to take it all in. 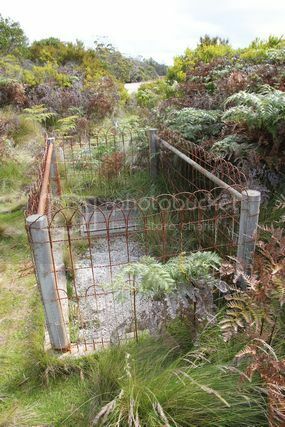 We cross back over the bridge spanning Cockle Creek and walk past the entrance track to our campsite, not far past here we find a track leading off to the cemetery, we then realise our campsite pretty much backs right onto it. 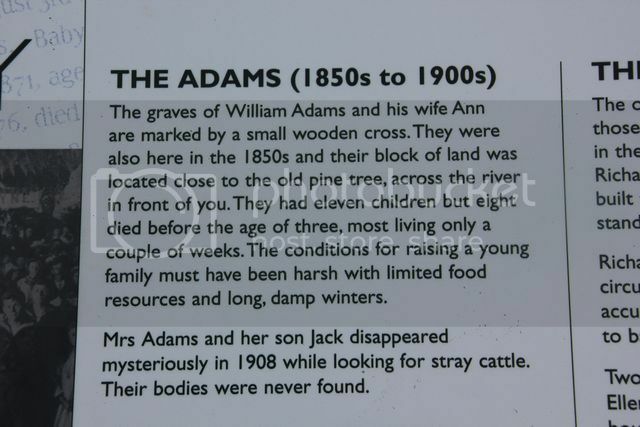 There's more information boards located here explaining the history of the cemetery and explaining the significance of certain markings on some of the tombstones found here. Reading some of the information boards you soon realise how hard it must have been to live here back in the day, sad stories of multiple lives lost in various families. One such family having had 11 children, but 8 of them died before they had reached the age of 3...so hard to comprehend how you'd deal with continual loss of life such as that. 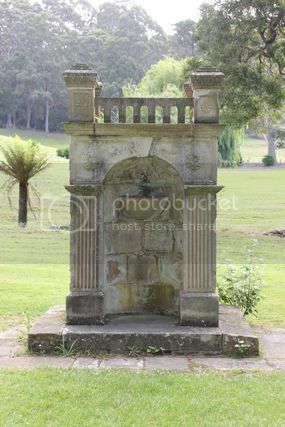 Jeff and i spend quite a while looking around the cemetery, it's surprising how many grave sites we find. 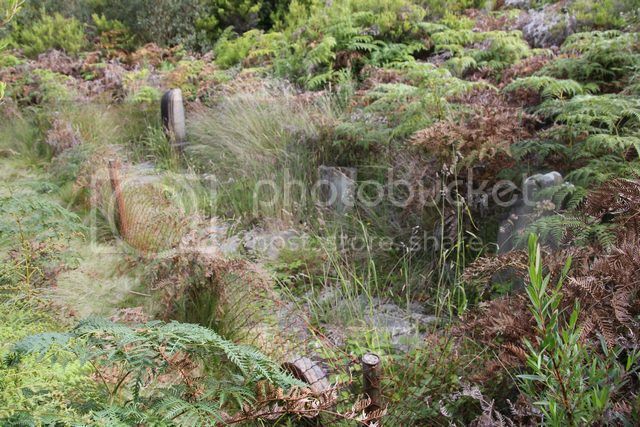 Some sites are starting to get quite overgrown and neglected, and it won't be long until mother nature reclaims them completely unless someone does something about it. We leave the cemetery via a different track we find leading out onto Cockle Creek, the tide is out so we have plenty of sand to walk on back around to a set of stairs that lead straight up into our campsite. With the wifes now getting dinner ready, we get the fire started and spend the rest of the evening sitting around it, enjoying a few drinks and a feed, before heading off to bed. A cracka of a morning today, we pack up camp and are on the road by 8.30 a.m. Heading North on the windy Huon Highway past Southport i see a 100kph sign so start to accelerate, it's here i learn a valuable lesson about Tasmanian speed limits...you see they don't mean diddly squat IMHO, they are posted as a bit of a joke for the locals i'd hazard a guess. Cresting a slight rise in the road where a 100kph speed limit sign is located, i'm accelerating to about 90kph as i suddenly notice about 30 metres infront of me is a sharp righthand corner that i need to be doing about 50kph to negotiate. I slam my foot on the brake pedal and manage to wash off just enough speed to wheel the fourby and camper safely around the corner, at the same time i'm swearing at the knobhead that thought it's a good idea to located a 100 kph speed sign at that particular location. Speed limits in Tassie are just a rough guide to their roads, whilst there is plenty of places with a 100kph posted speed limit, you really need to forget about that number and just read the road that is infront of you and drive at a speed you feel comfortable doing. 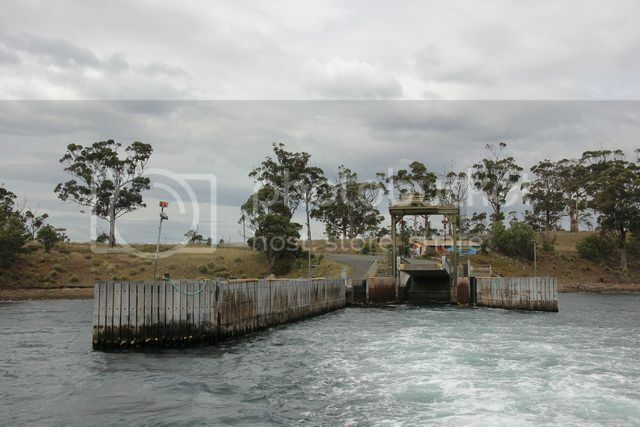 We head back towards Hobart and along the way stop off at Geeveston for a quick toilet stop. 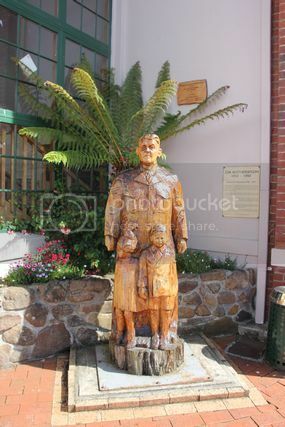 Why do i mention that you think, well if we didn't stop for that we wouldn't have seen the wood carving statues they have dotted about the place in town here. 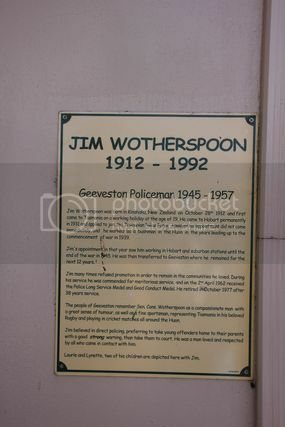 We'd passed through Geeveston on the way in and out to the Tahune airwalk in the days previous, but didn't actually stop there, we just croozed straight through the town. Stopping here for a toilet break had us seeing it's a nice little town they have here. 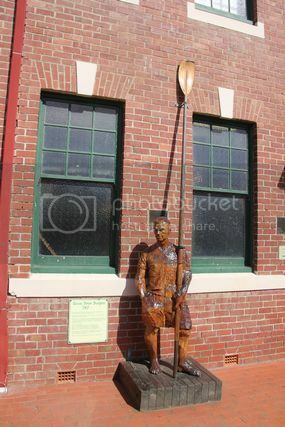 We'd stopped across the road from the local Bendigo bank, and here we notice a wooden statue of a man and a large rowing oar. 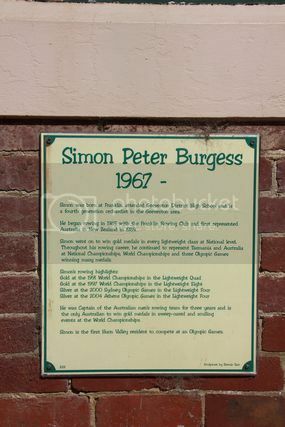 The statue was a tribute to Simon Peter Burgess, a local dual Olympian who'd won Gold medals at the 1991 and 1997 World championships, and who'd also won Silver medals in the 2000 Sydney Olympics and 2004 Athens Olympic games. We have a bit to do today so we don't spend very long looking around here, i'm sure if we explored the town more we'd likely find more statues about the place. Back in the vehicles and it's a blast straight up the highway back into Hobart. We drop the wives off at a local shopping centre in New Town to do some grocery shopping, and then Jeff and i head over to Glenorchy to pick up a GoPro camera that Jeff has sent to Shane's (our host earlier in the trip) parents house which they'd left back in Brisbane. Camera picked up, we thank Shane's dad for his help, and head back to pick the wives up and then play the usual game where you try and find a place in the campers and fourbies to fit all the supplies into. Campers restocked we head back out onto the Brooker Highway and turn left to head North about 30 odd klms for todays lunch stop. 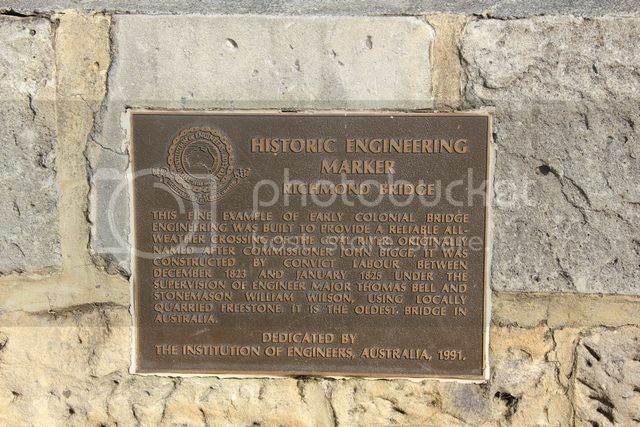 We reach the roundabout where the Brooker, Midland and Lyell Highways all meet together at the bridge that crosses the Derwent River, we take the exit to the left for the Lyell Highway and continue on. 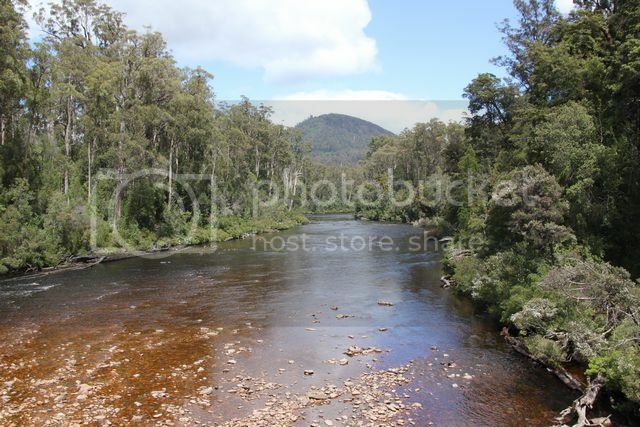 The highway winds it's way along the edge of the Derwent River, it's a scenic drive and before long we are pulling up in the town of New Norfolk for todays lunch stop. 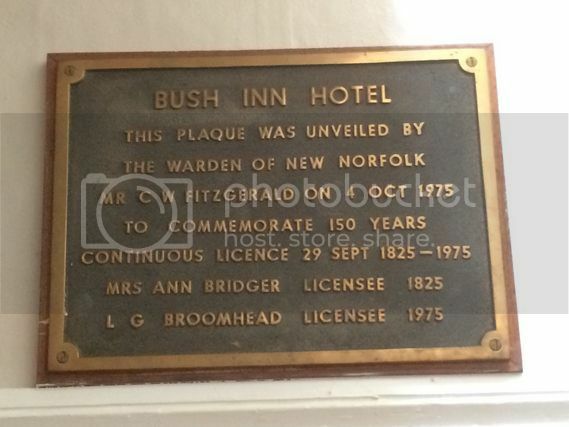 What brings us to New Norfolk you may ask?...well seeing we visited Australia's Southern most pub the other day for a refreshing beverage, we thought today we might aswell stop in at Australia's Oldest Continually Licensed Hotel for a counter meal, so that's just what we did. It's a nice old hotel with a big deck out the back looking over the Derwent River below, the meals were nice and before long we are back in the vehicles and headed on our way once again towards Mt Field. 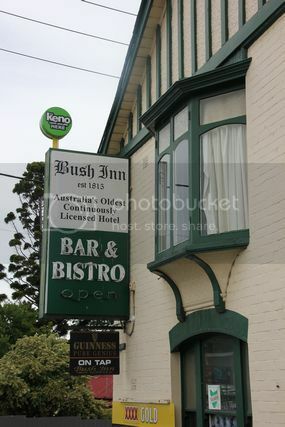 Whilst the Bush Inn may be a licensed hotel it doesn't actually have a proper bottle shop located in it, so we head up into the centre of town as we leave and make a quick stop at another hotel to restock the liquor supplies...geez this must be starting to read like a Tassie pub crawl by now i reckon...lol...which is exactly what our friends back home were saying on Facebook as the wives continually posted up pics of themselves having a Boags at each of the pubs we'd been stopping at along the way. As we leave New Norfolk we try and find a place to refill the water tanks on our camper trailers, the local information centre is located in the heart of town and you are no chance of parking there with a trailer onboard, we give up looking for a tap in town and decide to try our luck further on up the road. It's a nice country drive along the Lyell Highway as you head towards Mt Field, we stop off at a small town servo along the way to try and get some water (offering to pay for it), but they only run on bore water here so we thank the nice lady anyhow and push on for tonights camp. From New Norfolk it's only about a 40 klm drive to Mt Field, we plan to stay at the main National Parks camp ground located here, but have no idea what the place will be like so have a few back up places in mind also. Arriving at Mt Field i am surprised to see how well set up this place is, it has a large grassed day use picnic area with a kids playground located in it, aswell as a large National Parks office located here aswell. Driving past all this takes you around to the camping area, there's quite a few powered sites available here aswell as a heap of unpowered sites aswell, it's much like being in a caravan park really. The powered sites are set up down the righthand side of the road, they have water taps located at each power pole, aswell as a grey water waste pipe also. 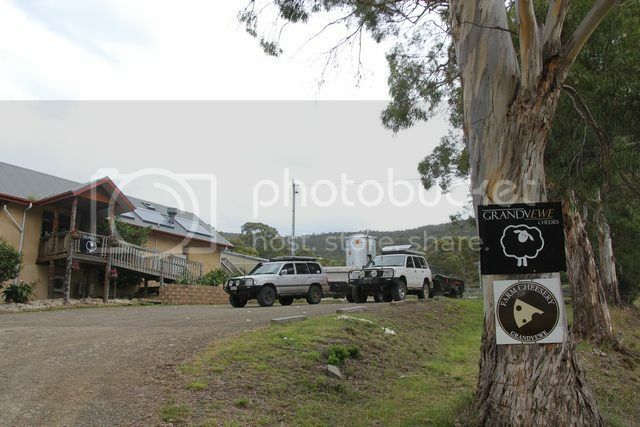 The unpowered area has bigger sites available to set up in, we do the sums and think for an extra $8 a night we'll go a powered site and not have to worry about anyone stealing our solar panels whilst we are away from camp here (it's quite a busy / popular place to stay at). It's a snug fit length wise to fit our hard floored camper on the site but we manage to do so, they mainly cater for small motor homes / self contained vans on these powered sites by the looks of it, but we manage to get set up for a few nights stay and then have a wander around the place to look around. Mt Field is a self registration campground, unpowered sites are $22 a night for a family and powered sites are $30 a night, there's hot showers and flushing toilets in the large toilet block located here, aswell as a laundry complete with coin operated washing machines and dryers (change is available at the Nat. Parks office during business hours). Whilst the wives do a few loads of laundry Jeff and i take the kids over the playground to burn off some energy. The rest of what's left of the afternoon is spent doing not much at all, we have a nice hot shower for the first time in a few days before dinner and call it a earlier then usual night seeing we don't have a fire to sit around. 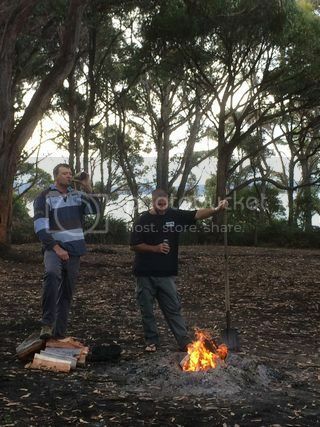 There is a communal fire area over near the unpowered area you could use if you wanted to, firewood is supplied by National Parks, but tonight we couldn't be bothered going over there to get it started.